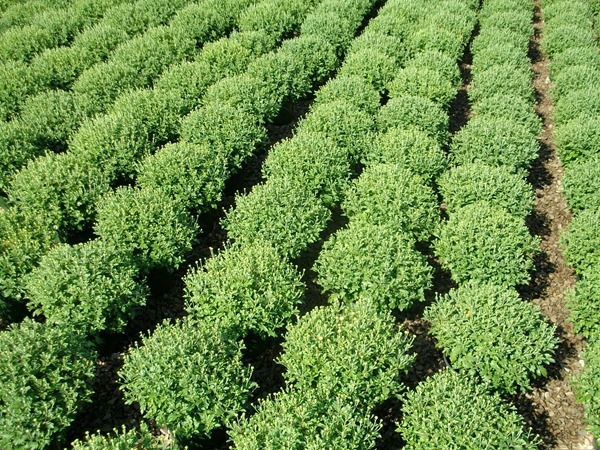 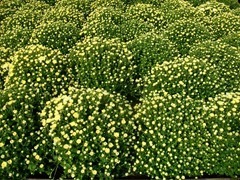 Aren’t these mums gorgeous? 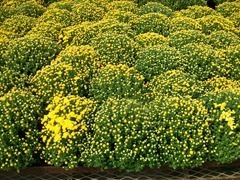 We have some really nice mums all around this year. 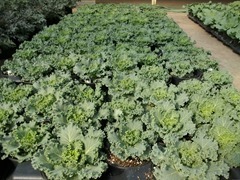 Lots of the 8” and limited on the 12”. 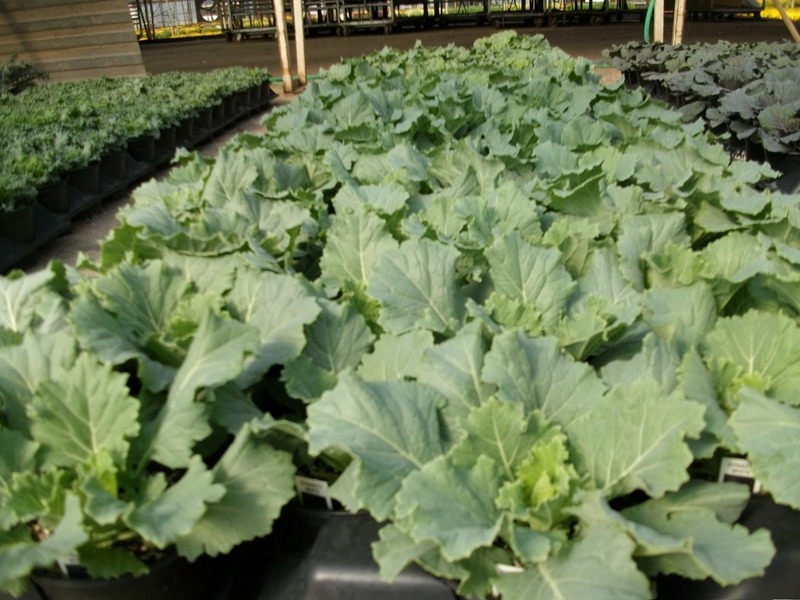 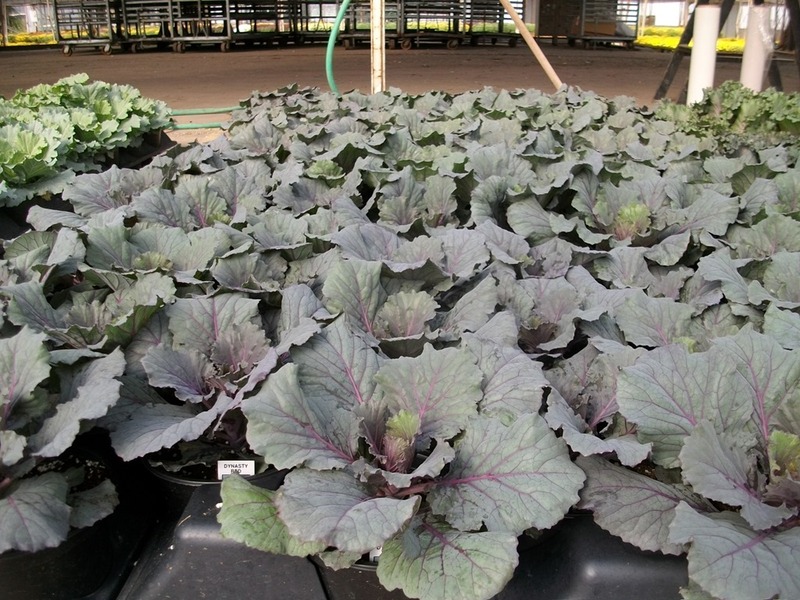 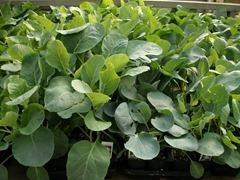 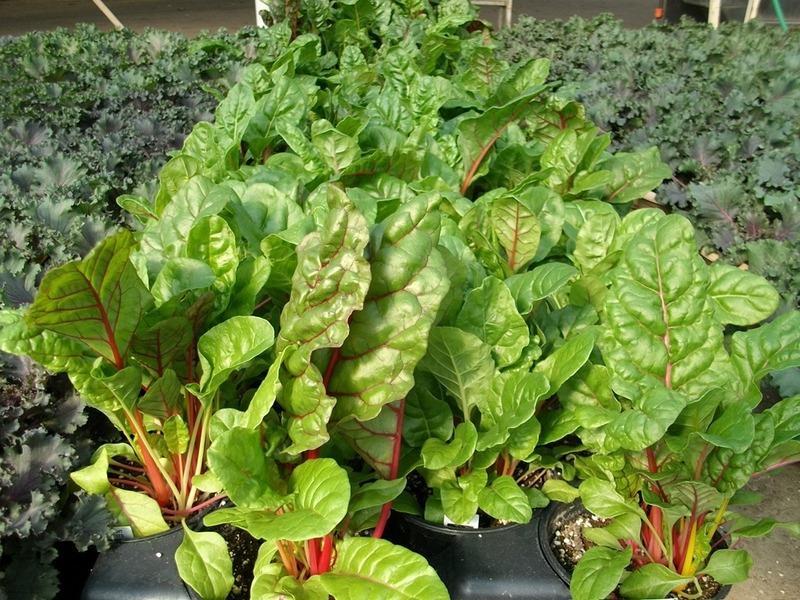 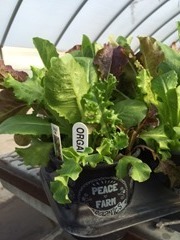 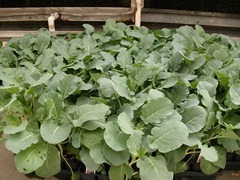 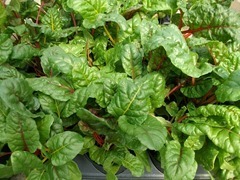 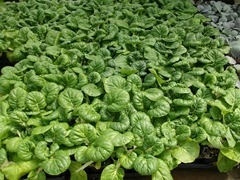 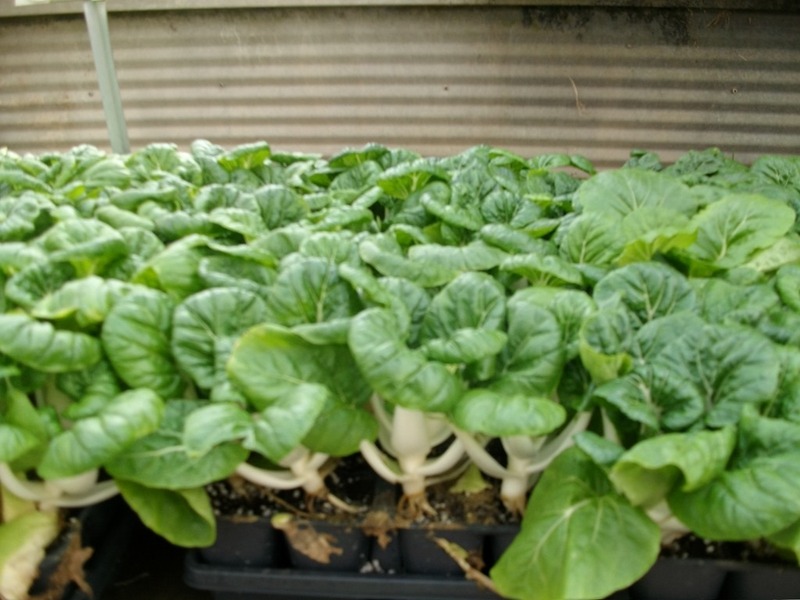 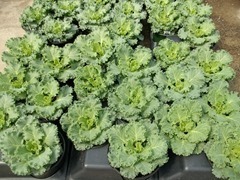 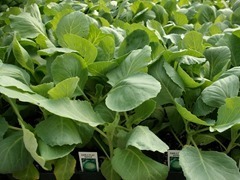 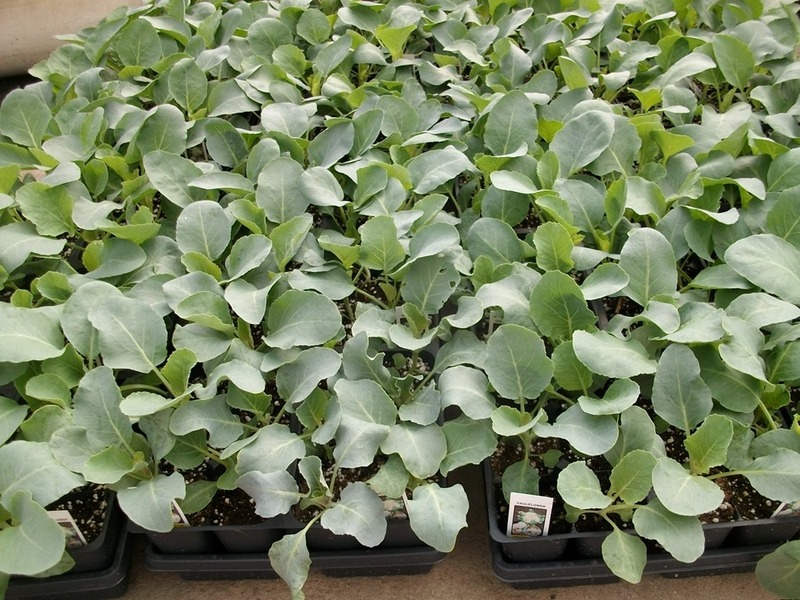 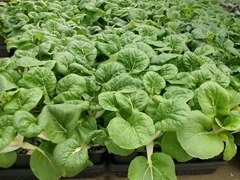 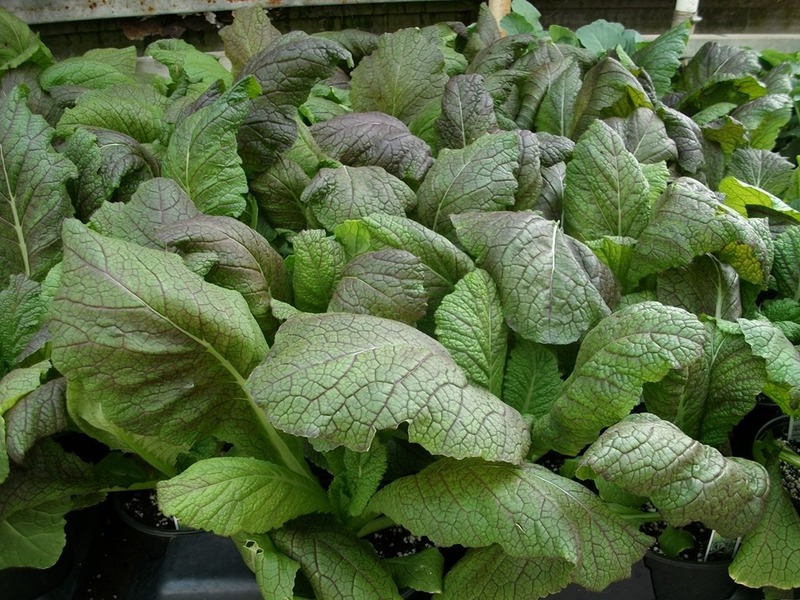 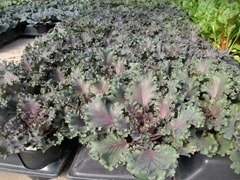 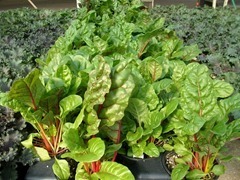 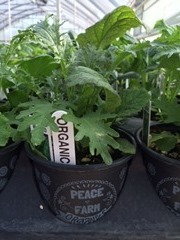 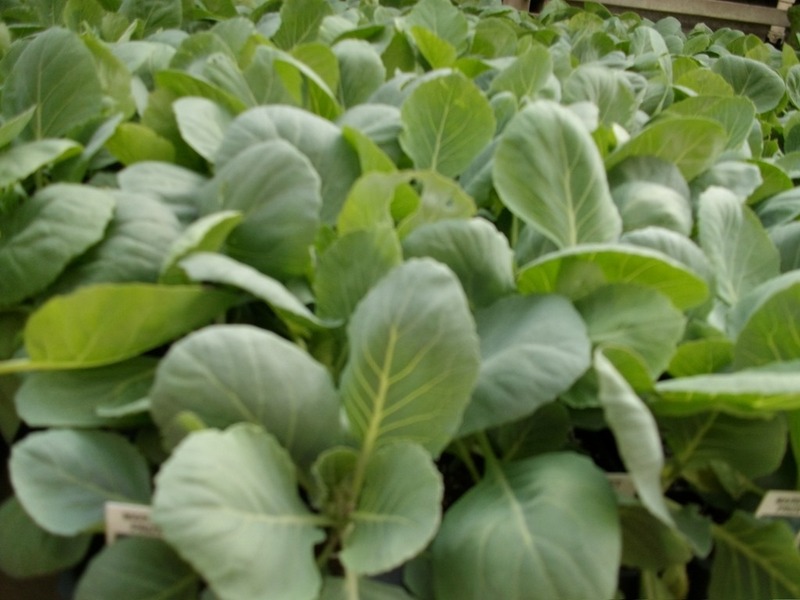 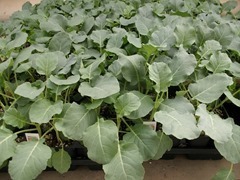 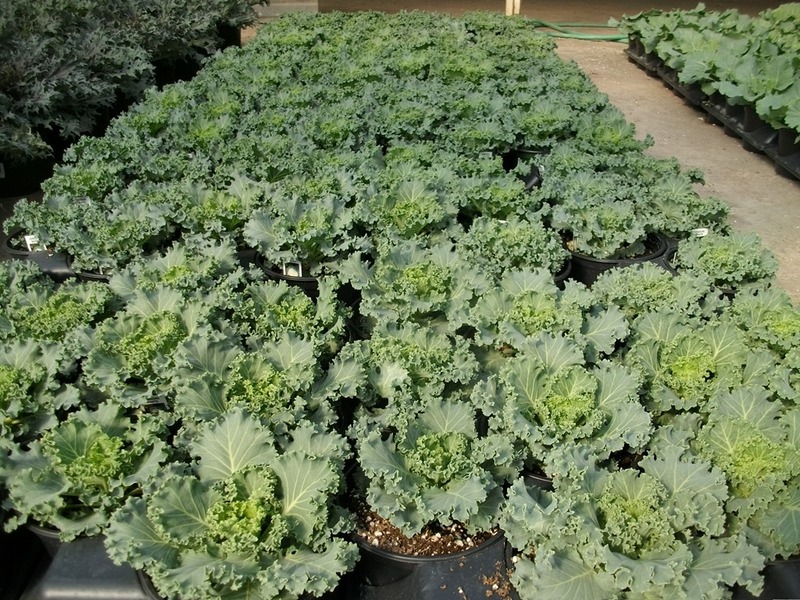 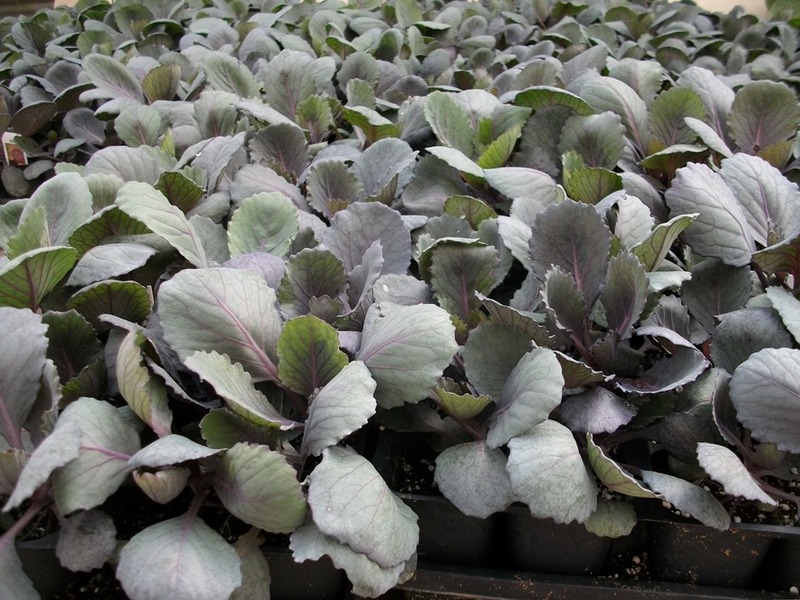 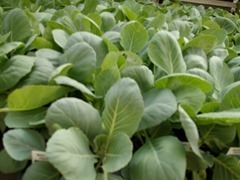 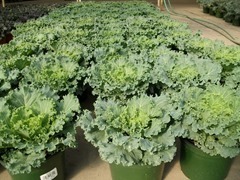 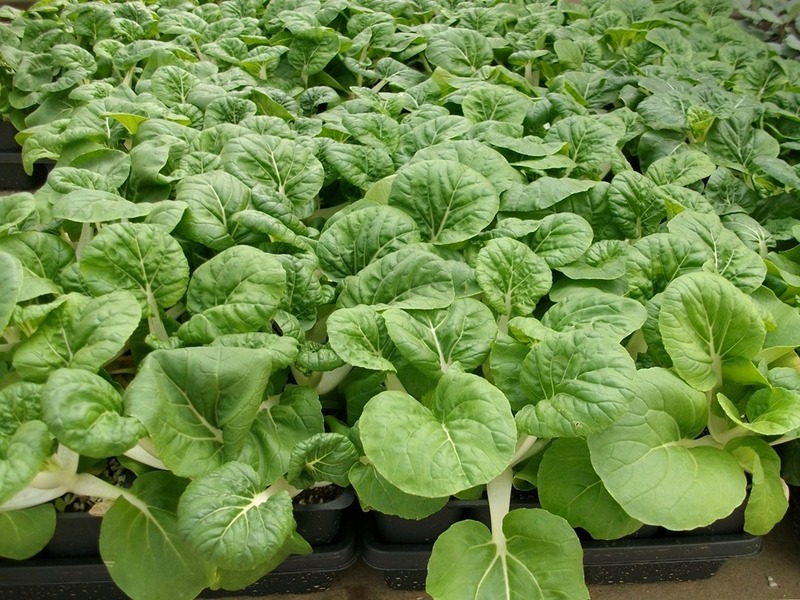 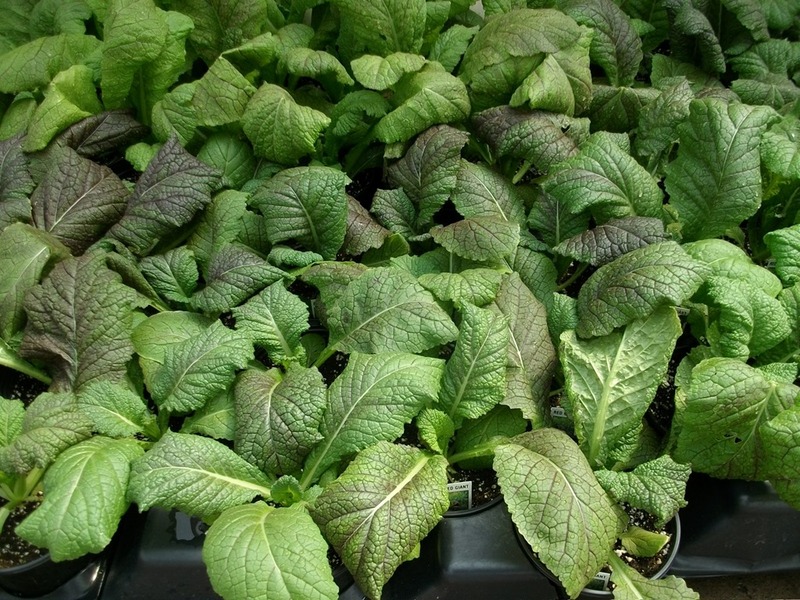 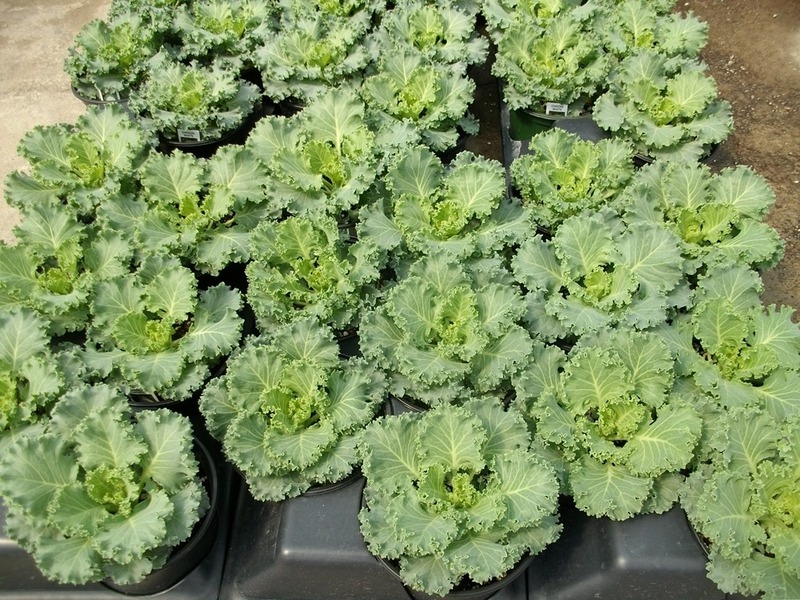 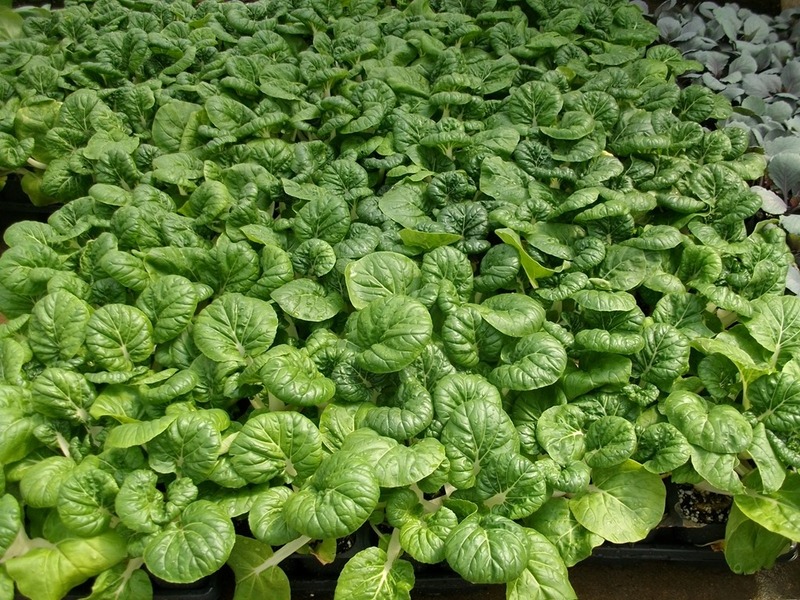 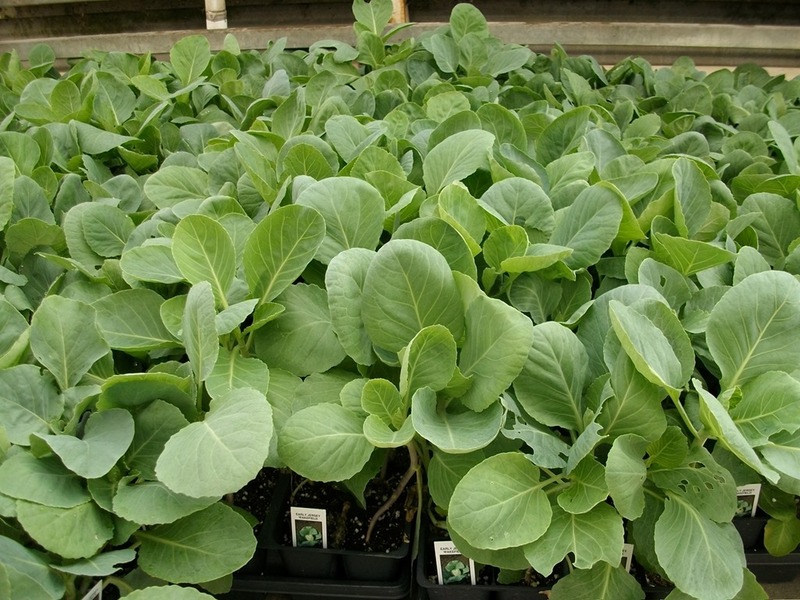 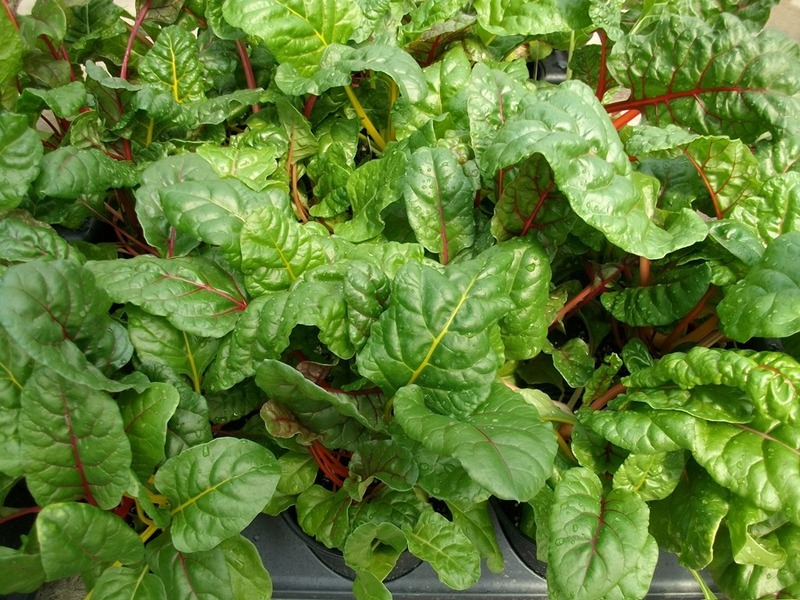 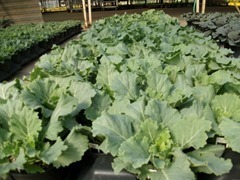 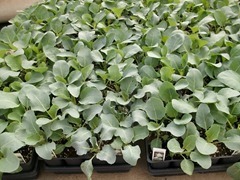 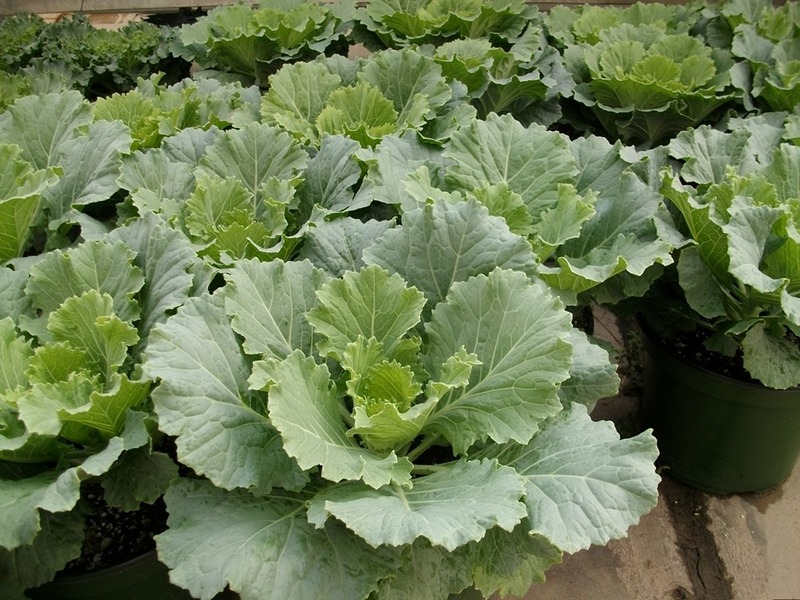 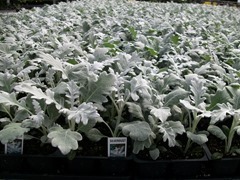 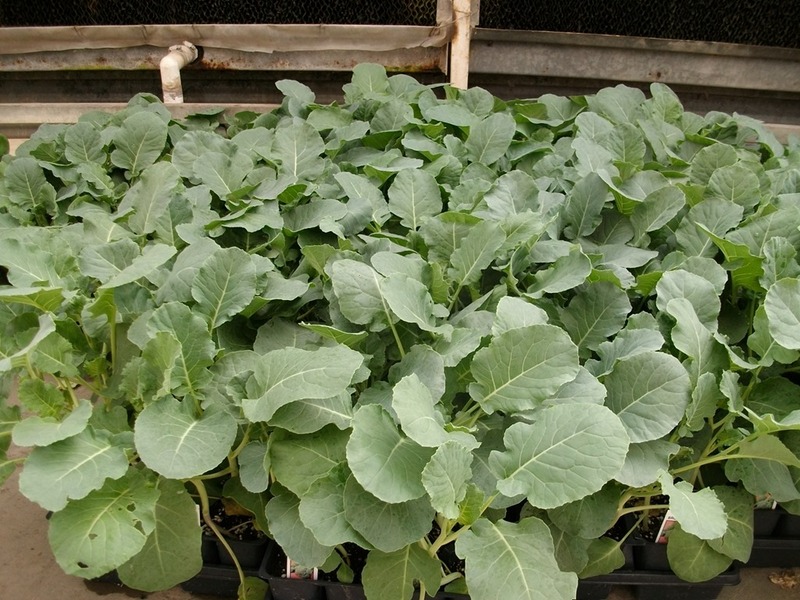 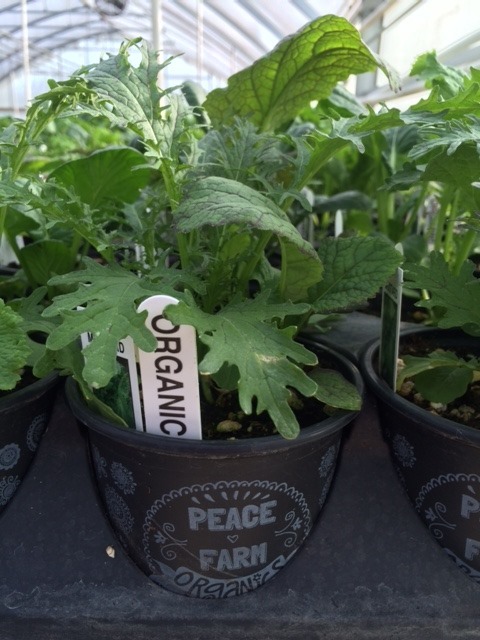 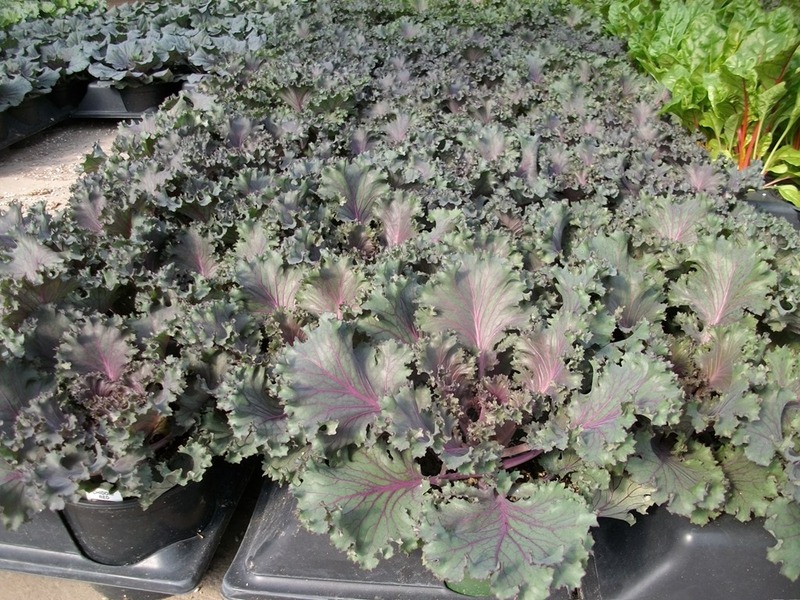 Our cole crops and Peace Farm Organic veggies are looking very good right now. 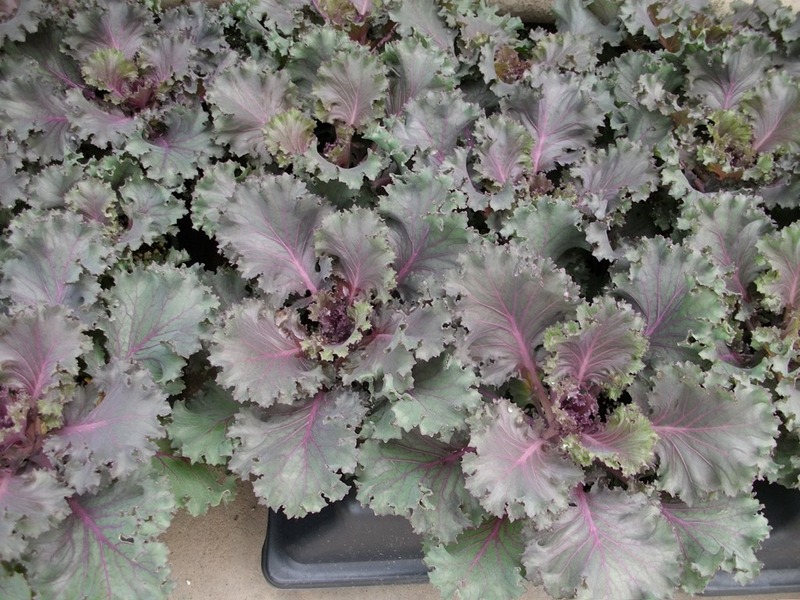 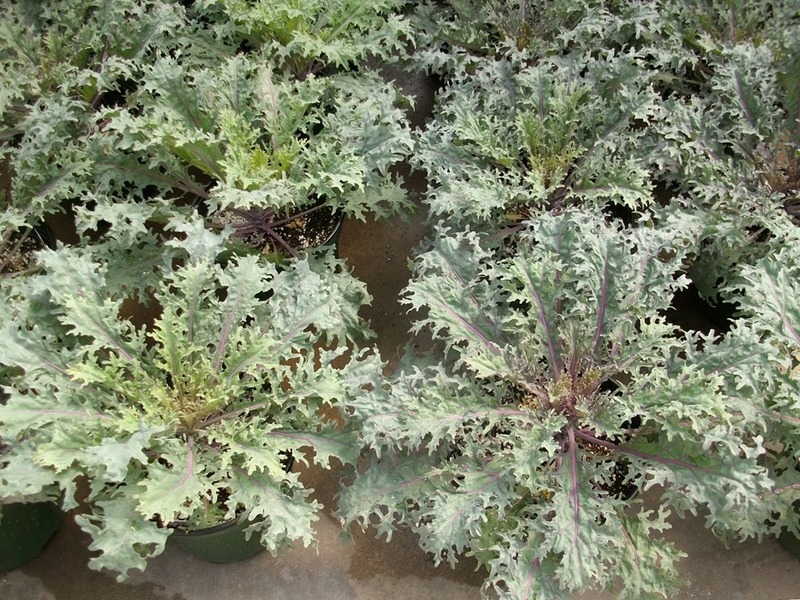 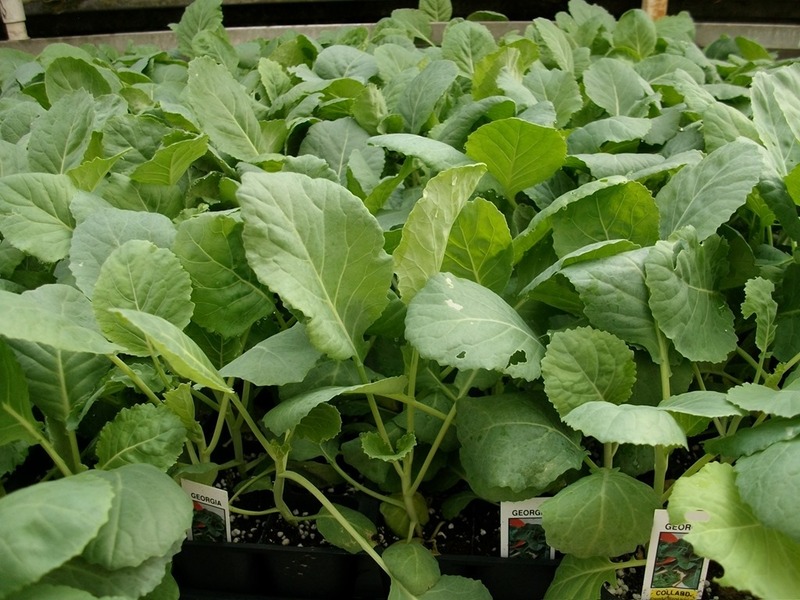 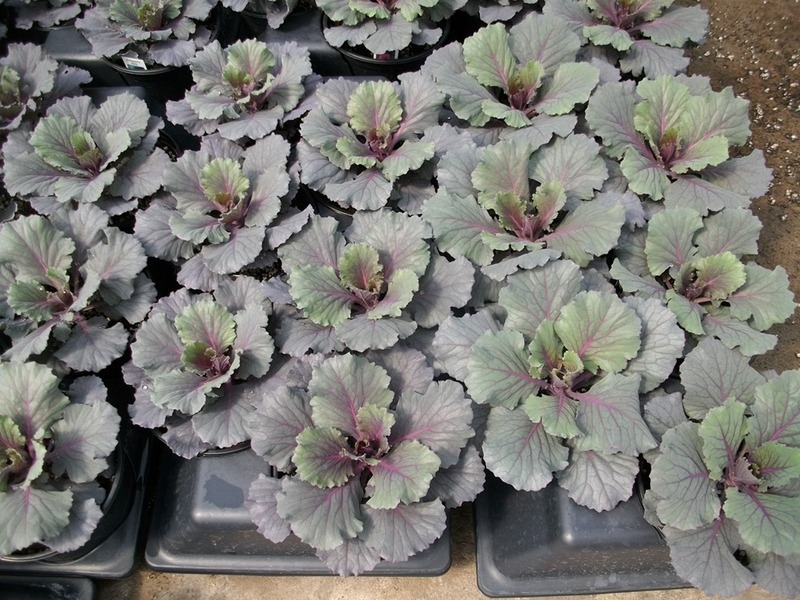 I can just go on and on about the cabbage and kale, pansies, etc. 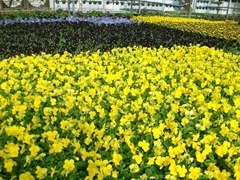 Below are some pictures so you can see for yourself. 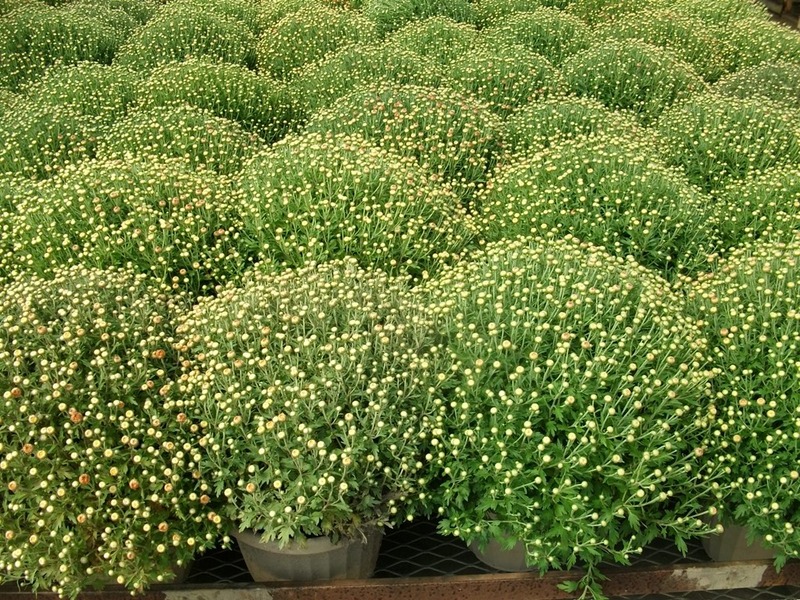 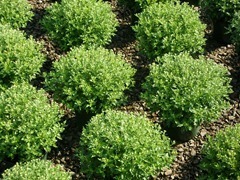 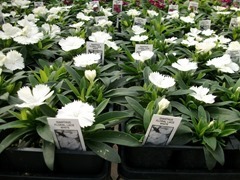 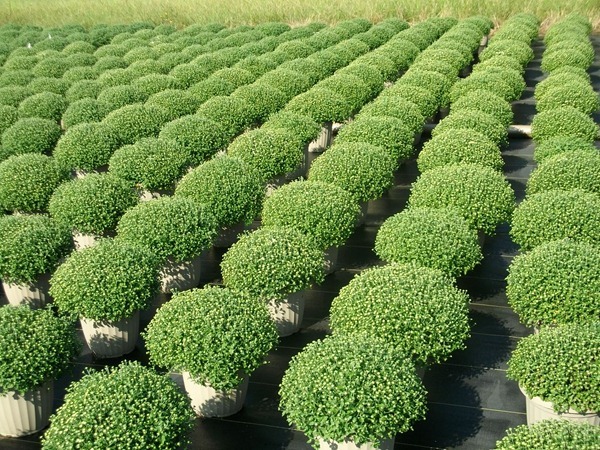 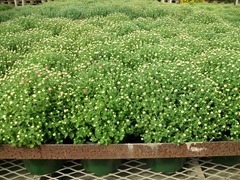 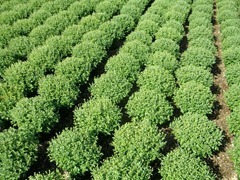 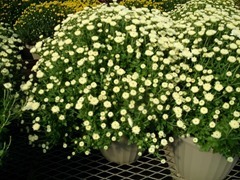 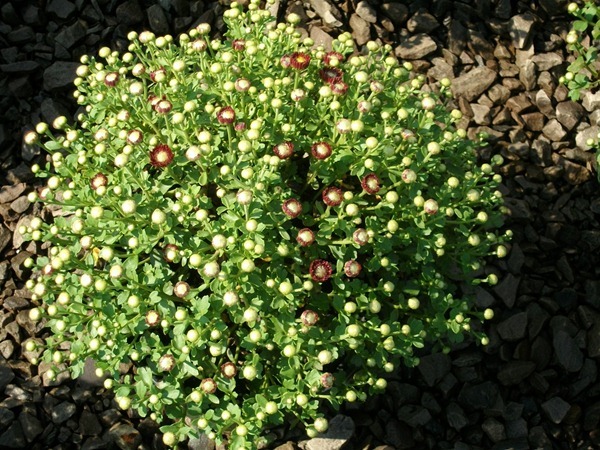 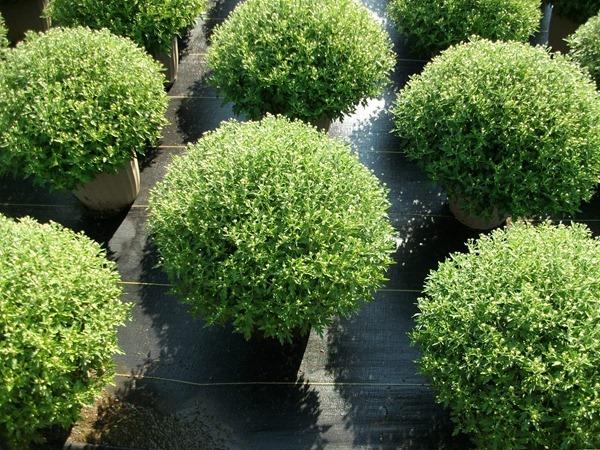 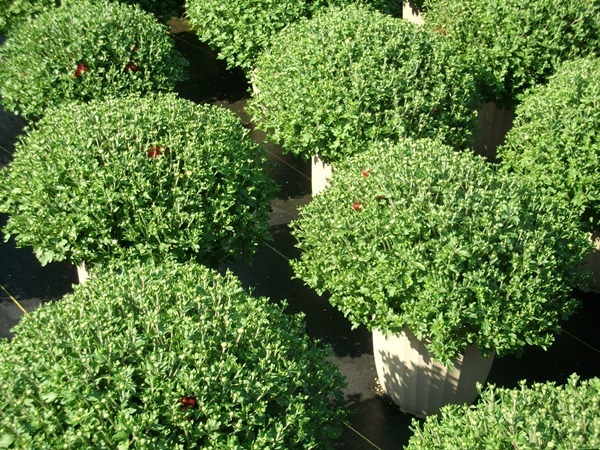 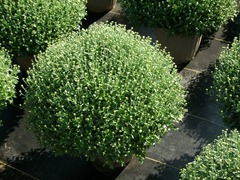 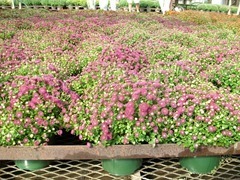 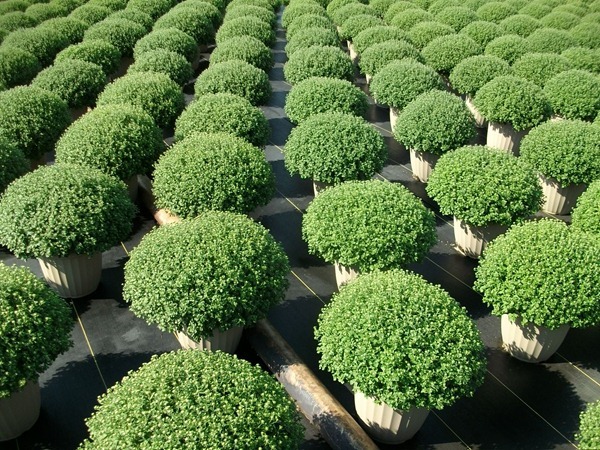 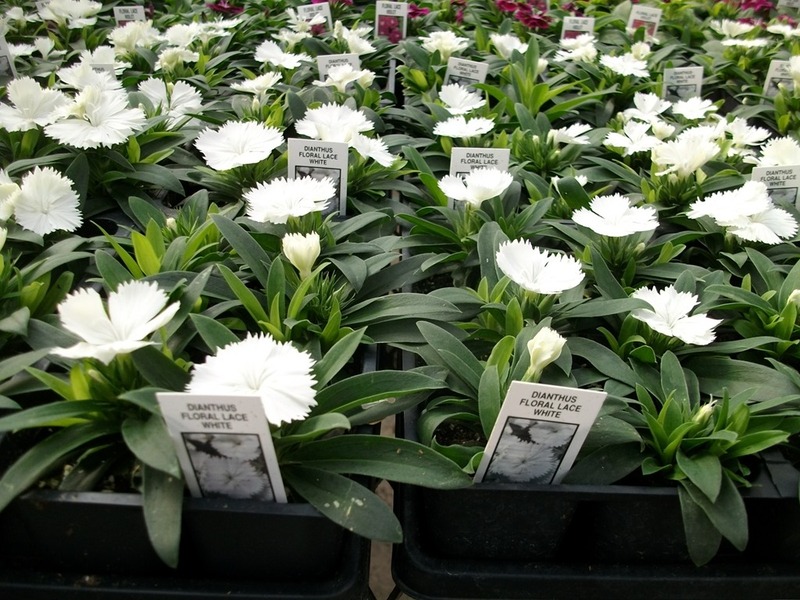 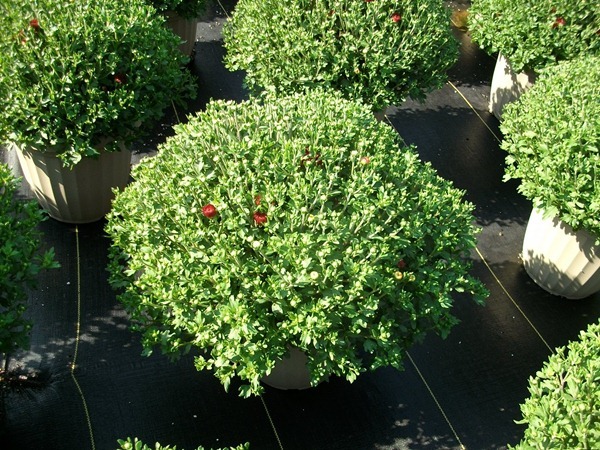 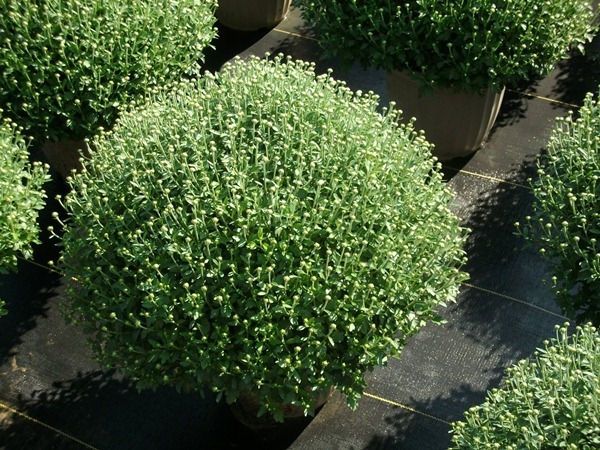 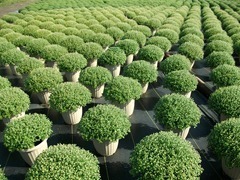 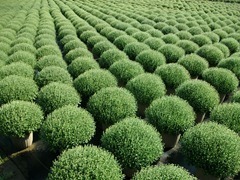 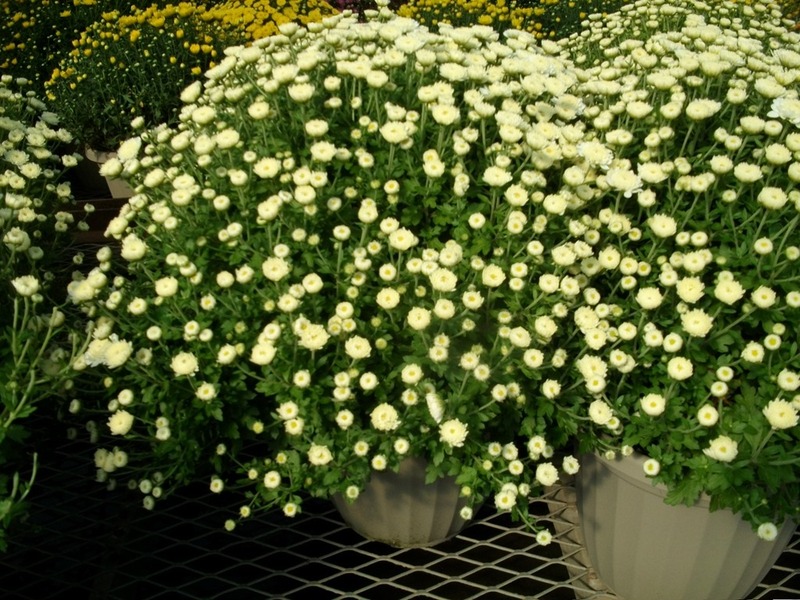 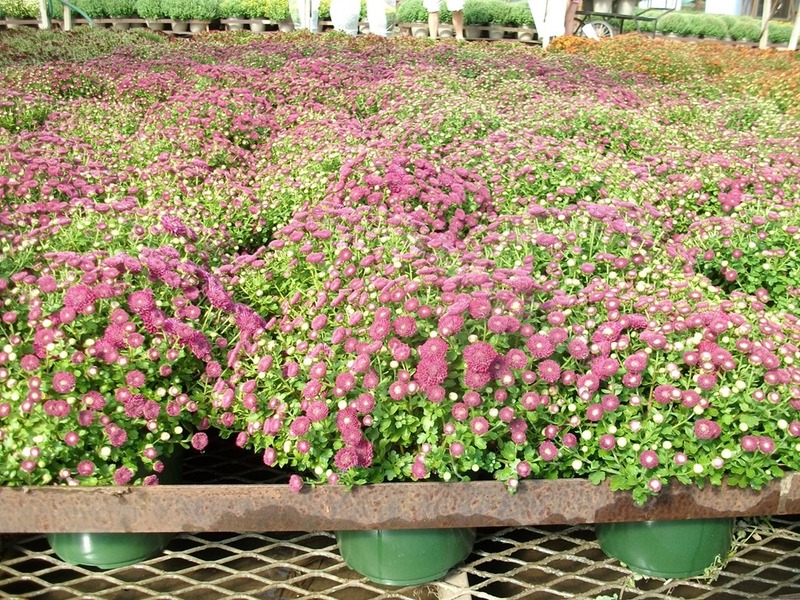 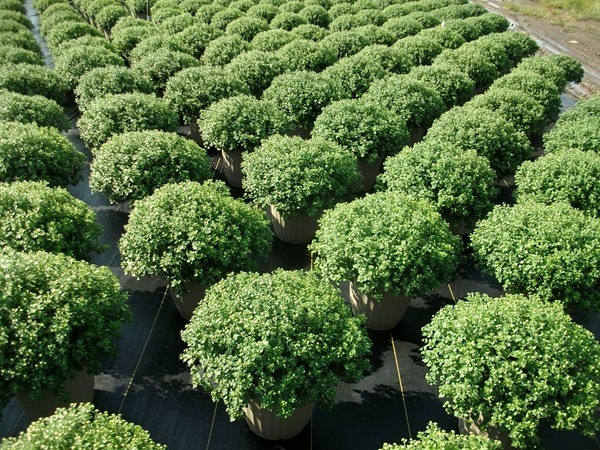 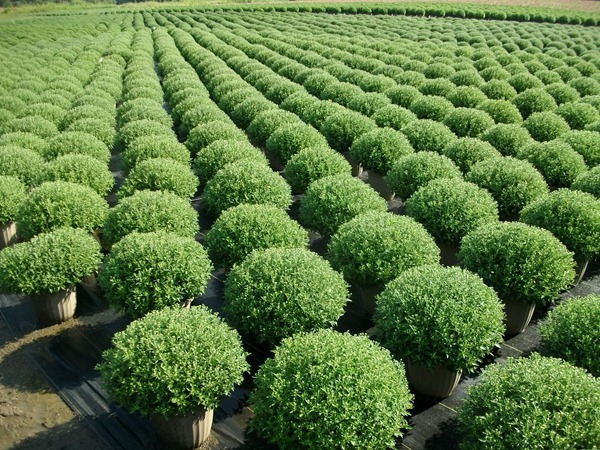 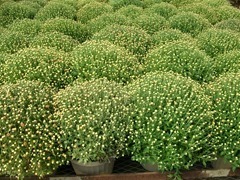 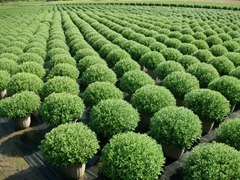 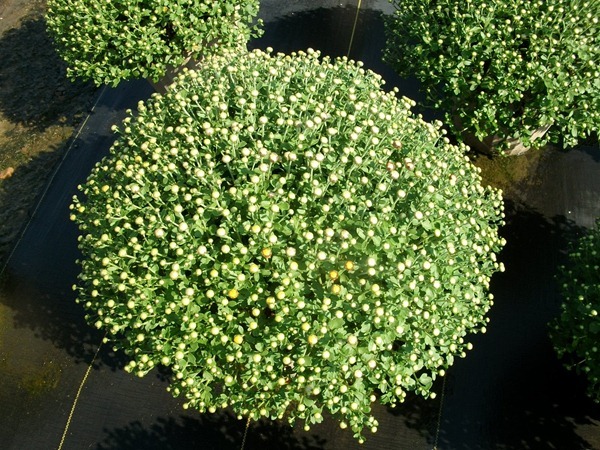 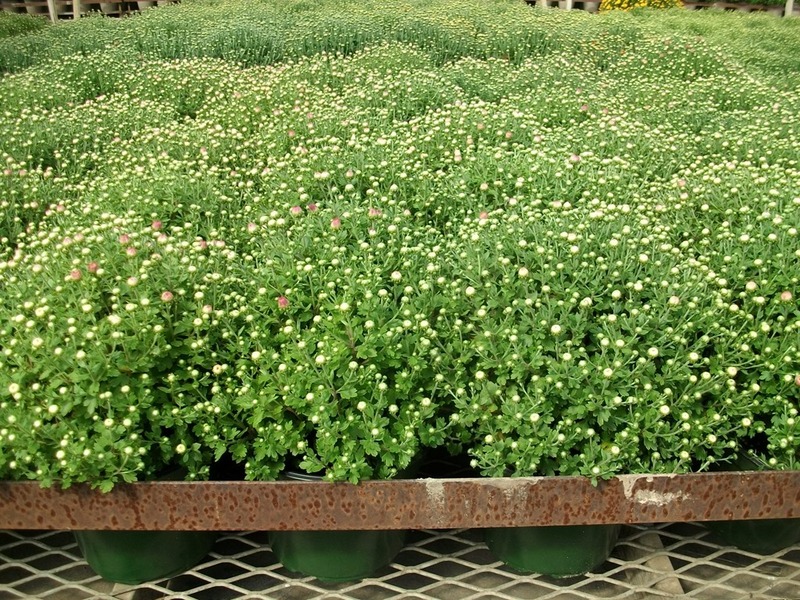 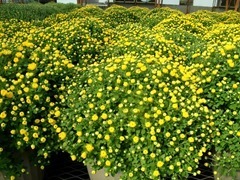 If you need 12” mums or anything in short supply, make sure you get your order to us right away. 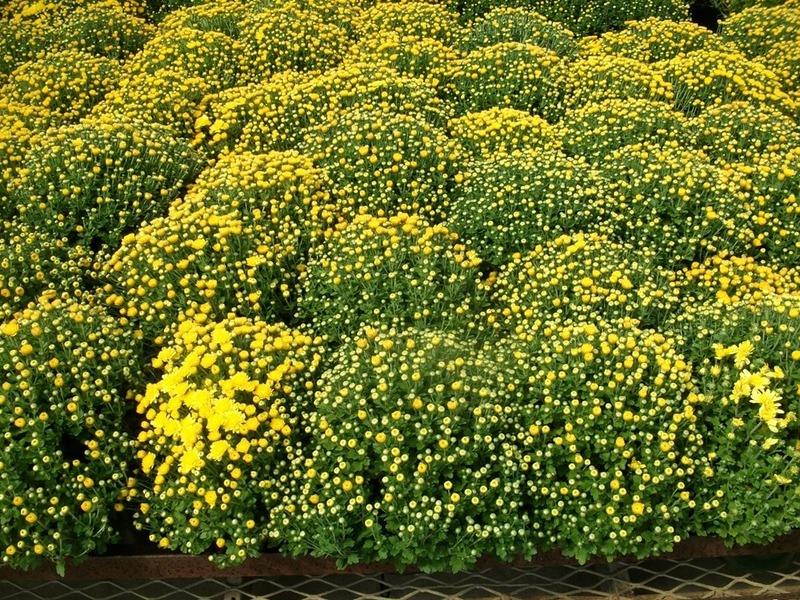 Next week it will officially become fall. 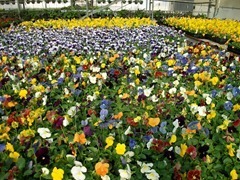 What a great time of year! 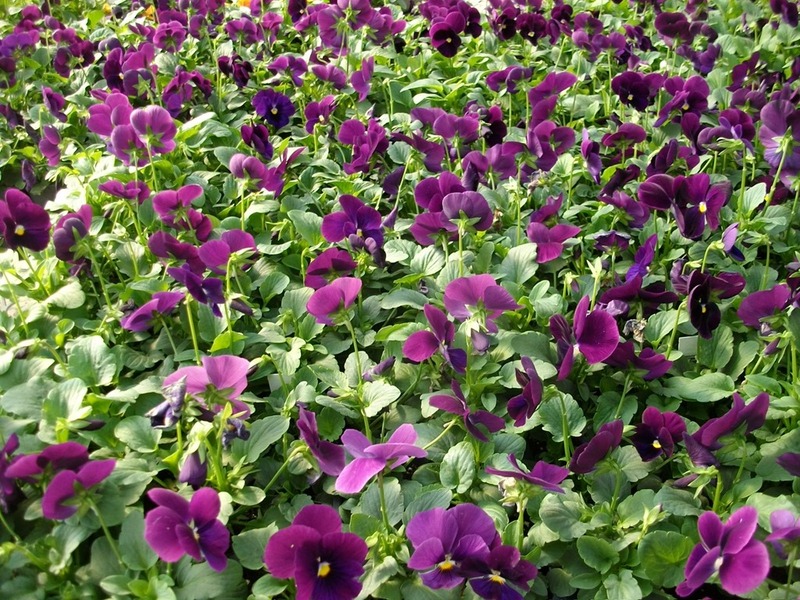 It is, by far, my favorite season. 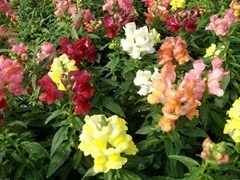 I can’t wait to get caught up around the house so that I can plant some of these beautiful flowers and veggies. 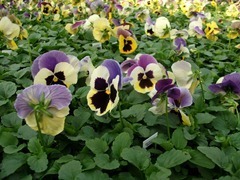 Here are some pictures of the latest offerings to put on your shelves. 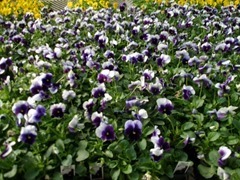 Things are really looking great. 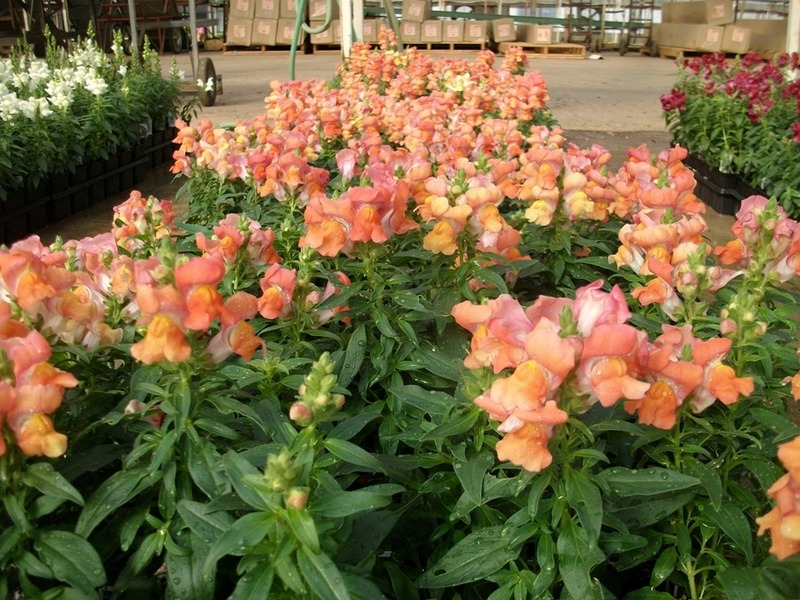 It is so nice to see all this color back in the greenhouses. 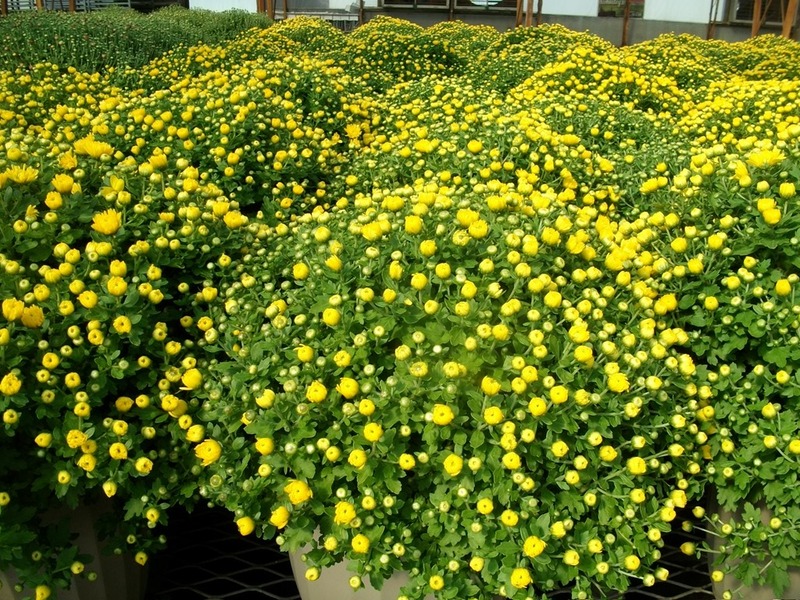 This is Jason writing this. 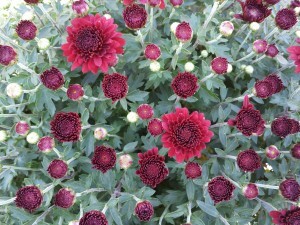 It’s been a while since I have written a blog post. 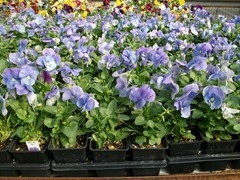 Dwight has been doing them for me. No matter how hard I try, I never seem to have enough time to get everything done. 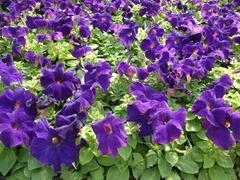 So last spring Dwight helped me out by handling the blog posts. 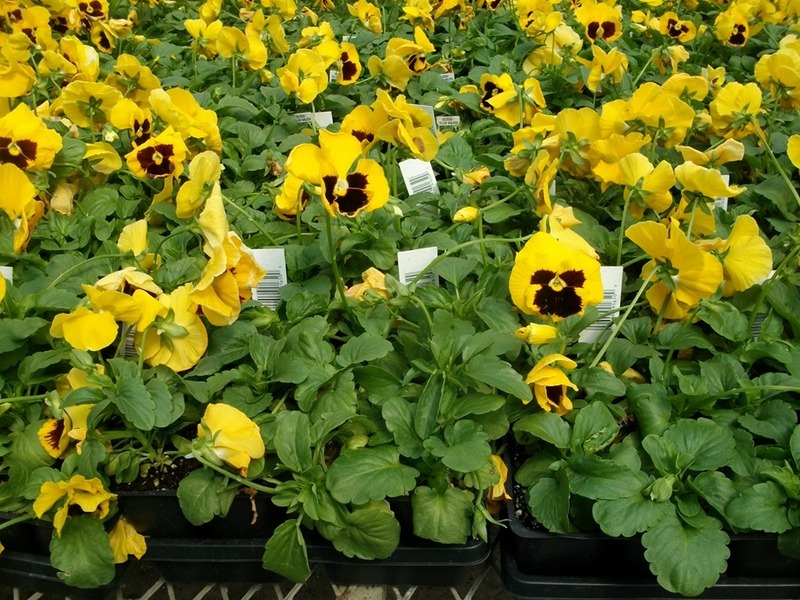 He’ll probably take back over for me next week, but I wanted to do this first one. 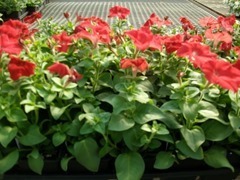 Before we get to the mums and pansies, the poinsettias are planted and pinched and look great. 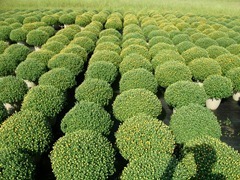 We will be spacing them next week. 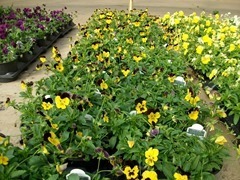 We are taking pre-booked orders for them and have good availability for now but when they start selling they go quick. We usually sell out around the first of November. 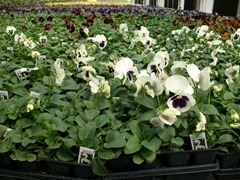 New for fall are some variety changes in our pansies. We dropped the Delta colors and replaced them with Matrix. Matrix Beaconsfield and Matrix Lavender Shades are new colors this year. 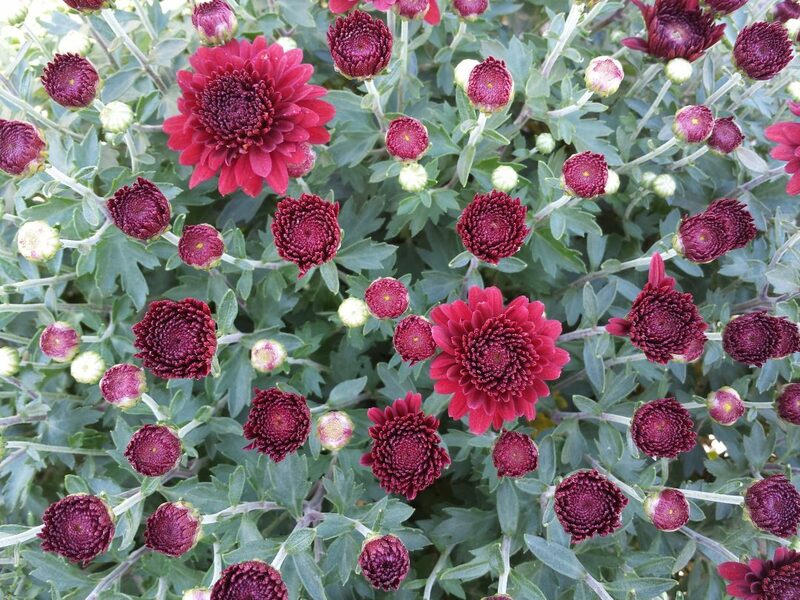 The Matrix Scarlet replaced the Delta Red, but it does have some color variations in the blooms like the Delta Red did but not as much. 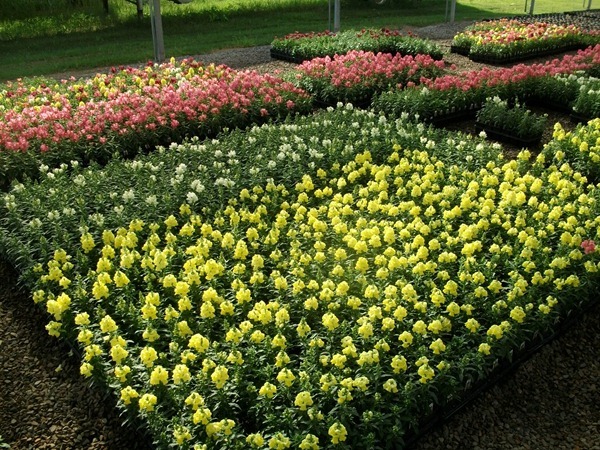 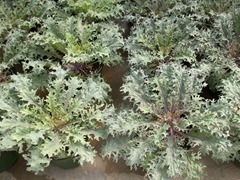 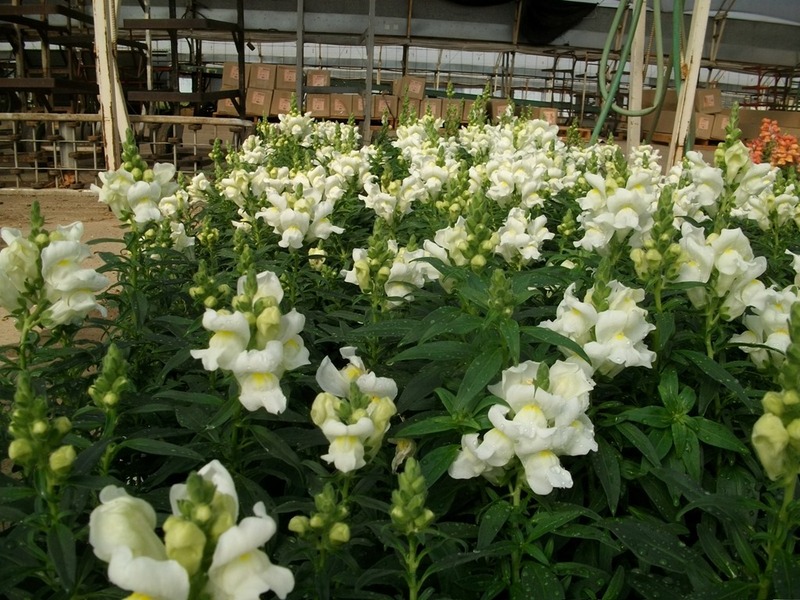 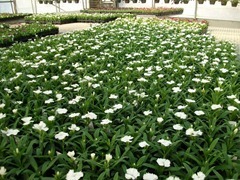 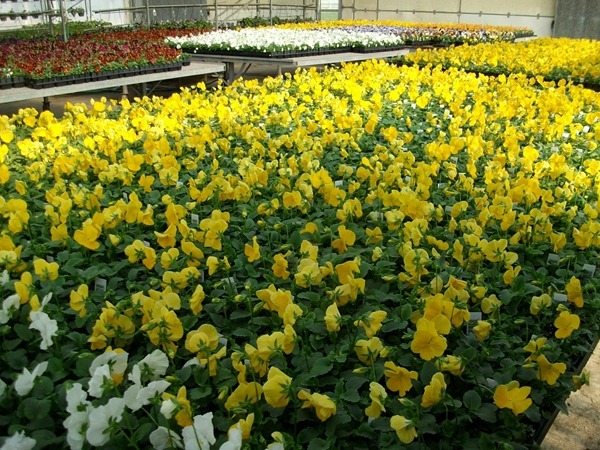 The Matrix plants have a much better habit then the Deltas, and they bloom at the same time as the other Matrix pansies. 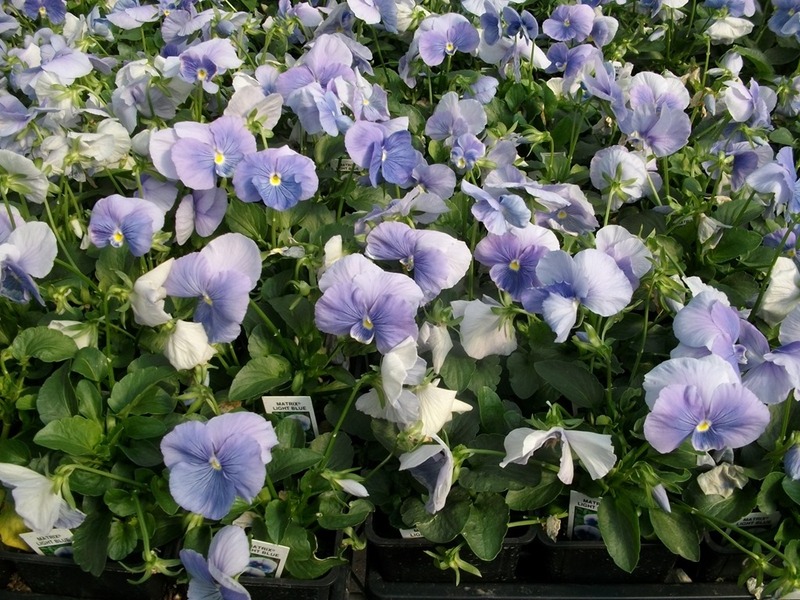 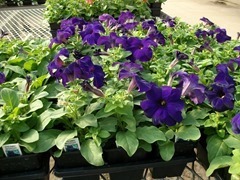 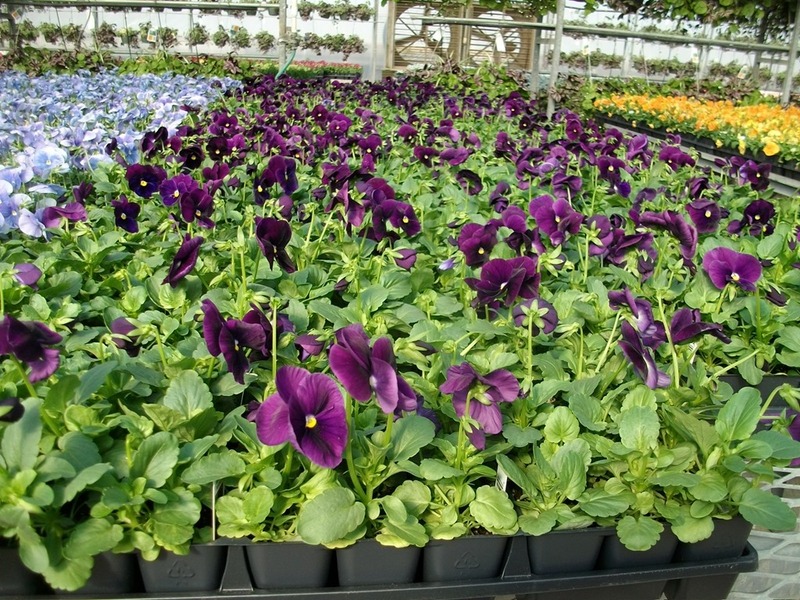 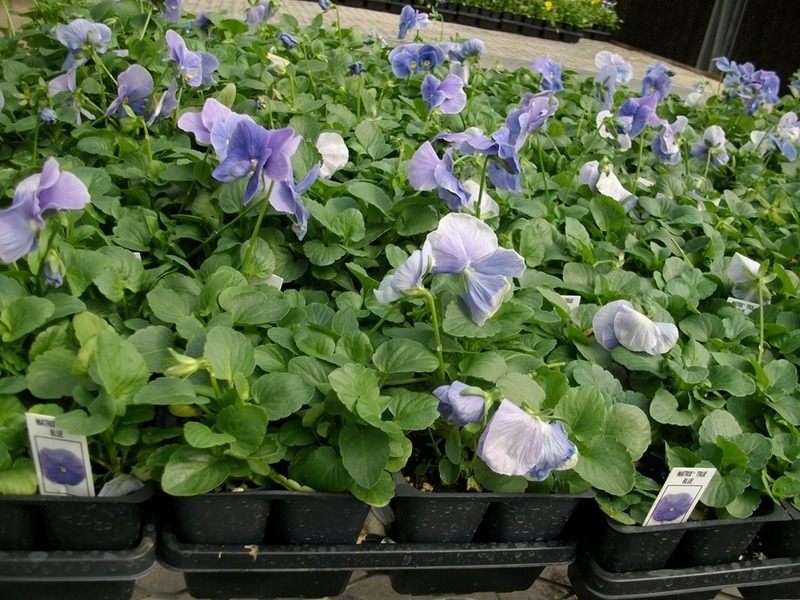 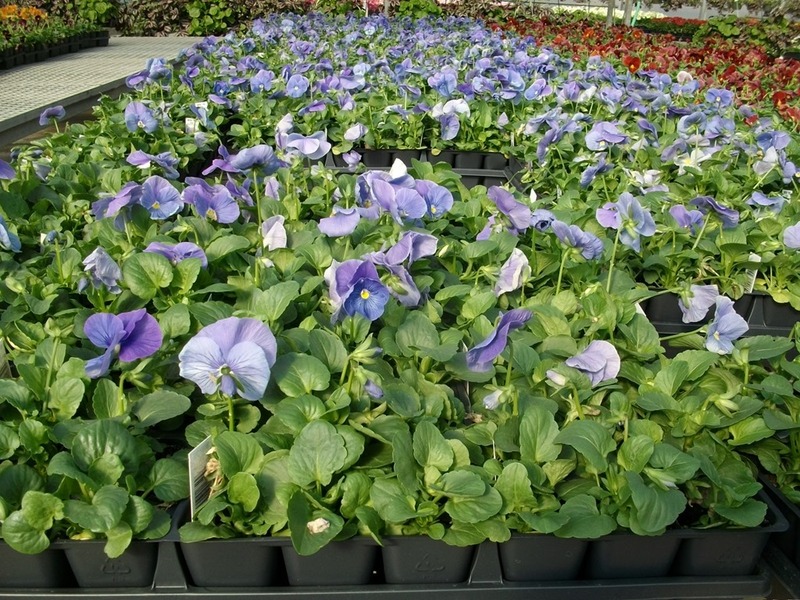 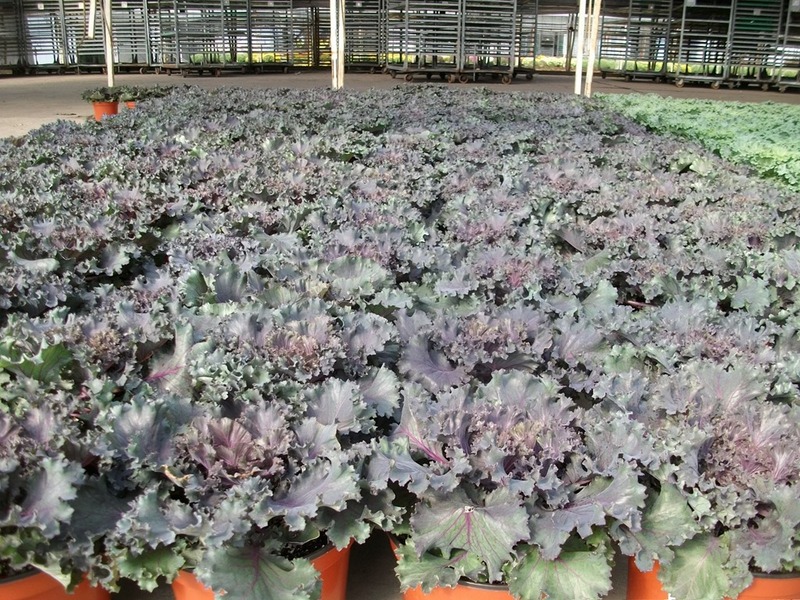 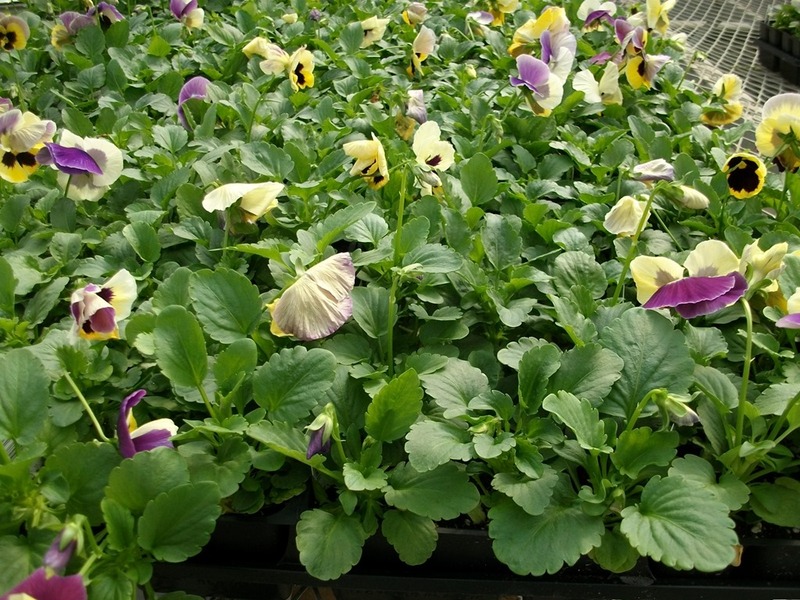 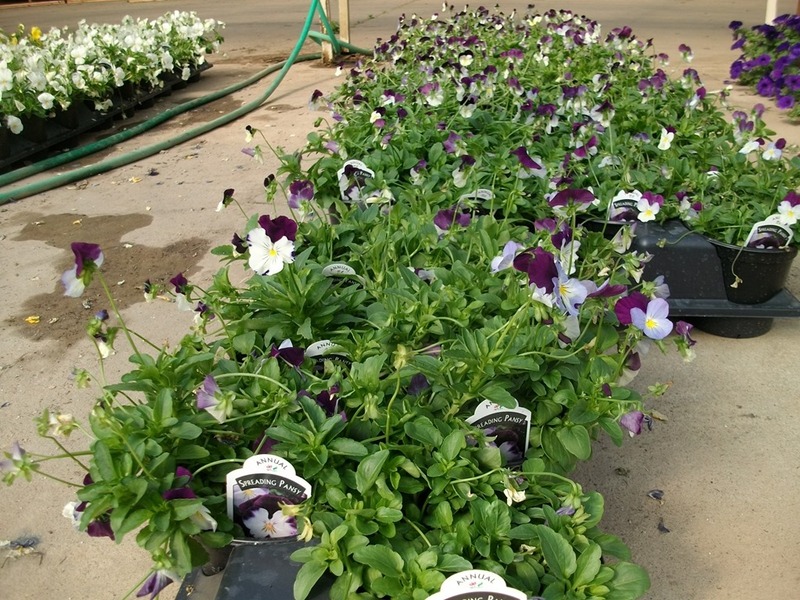 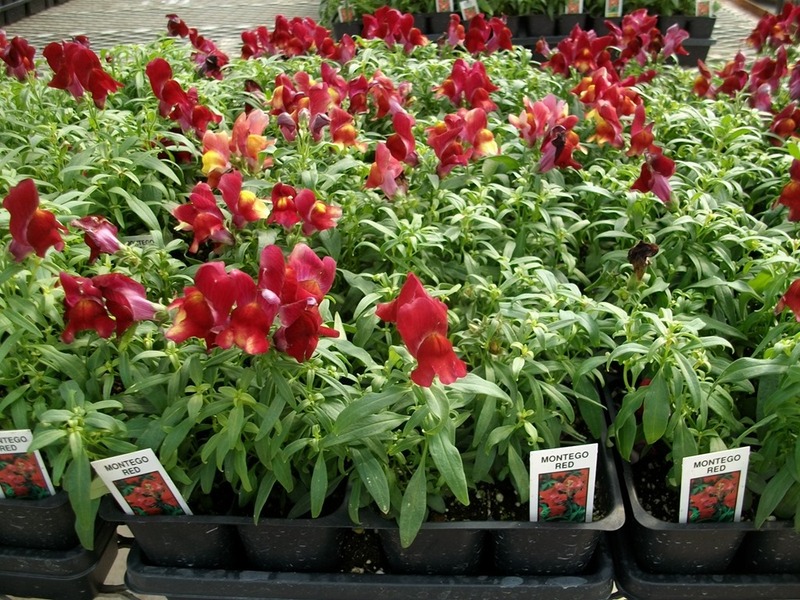 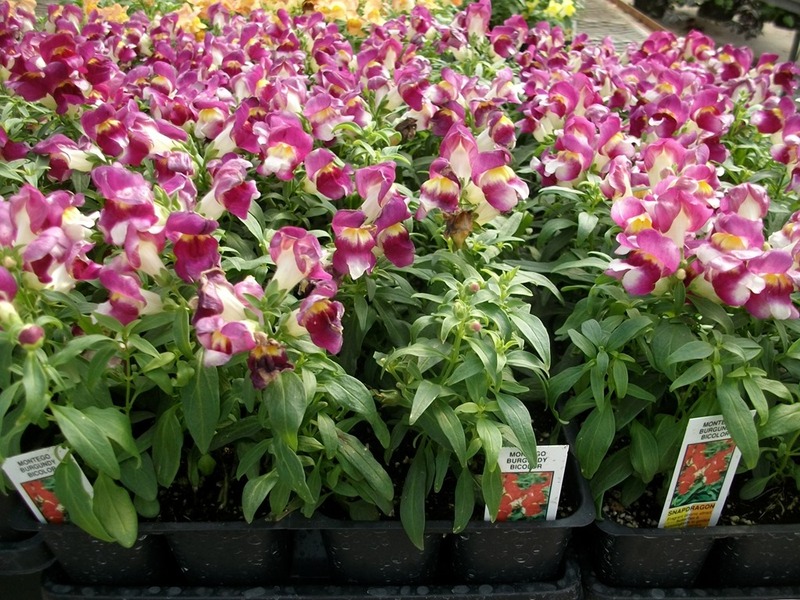 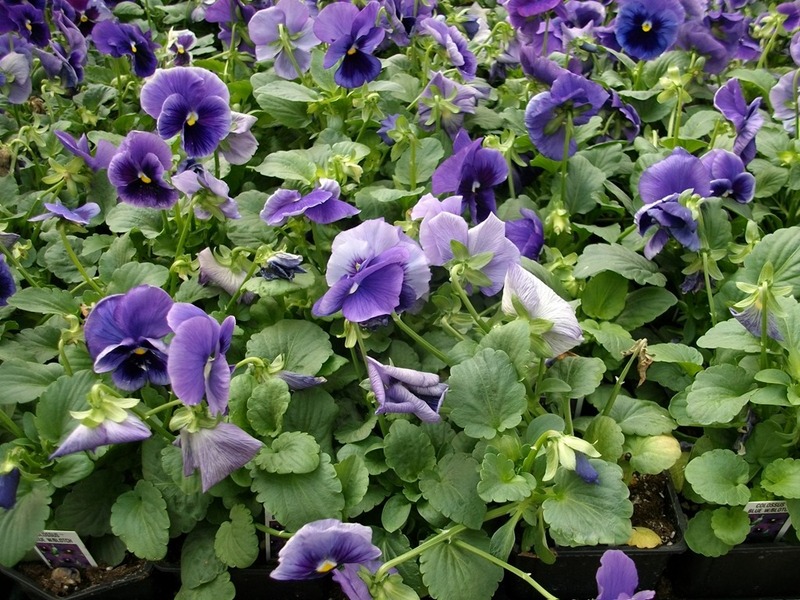 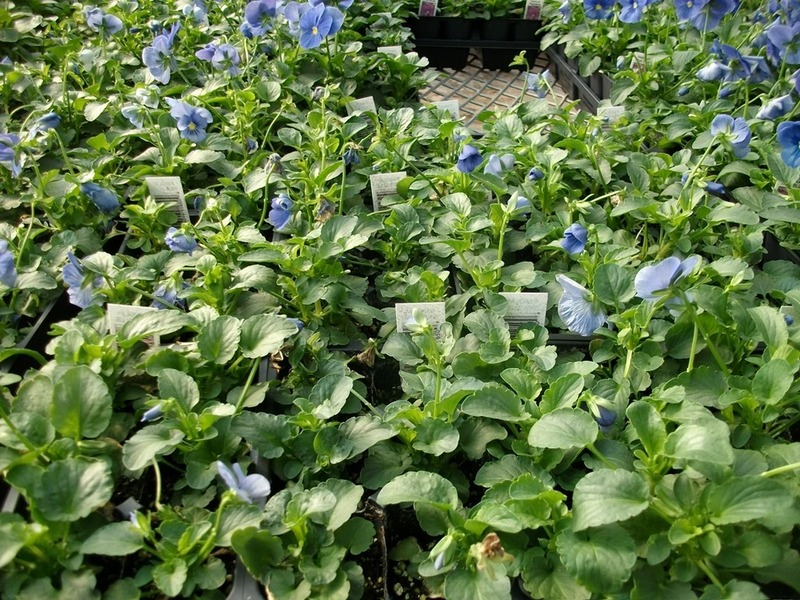 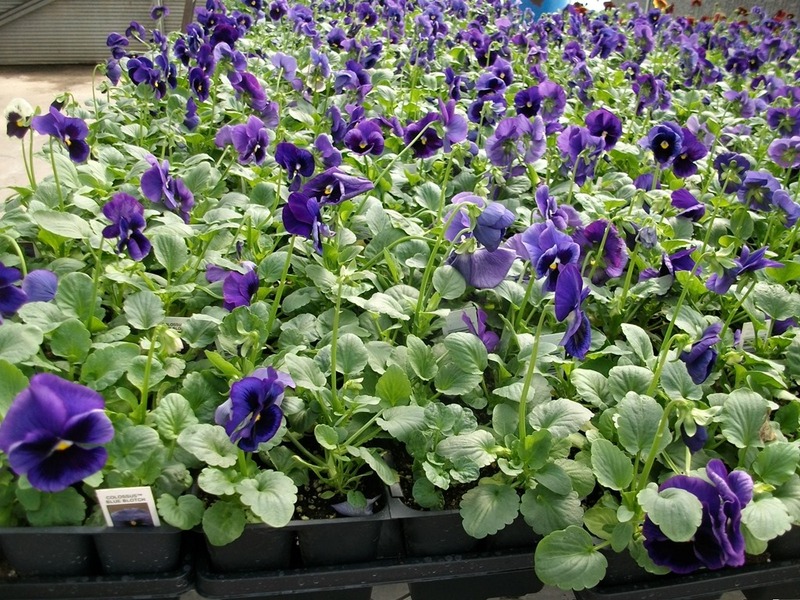 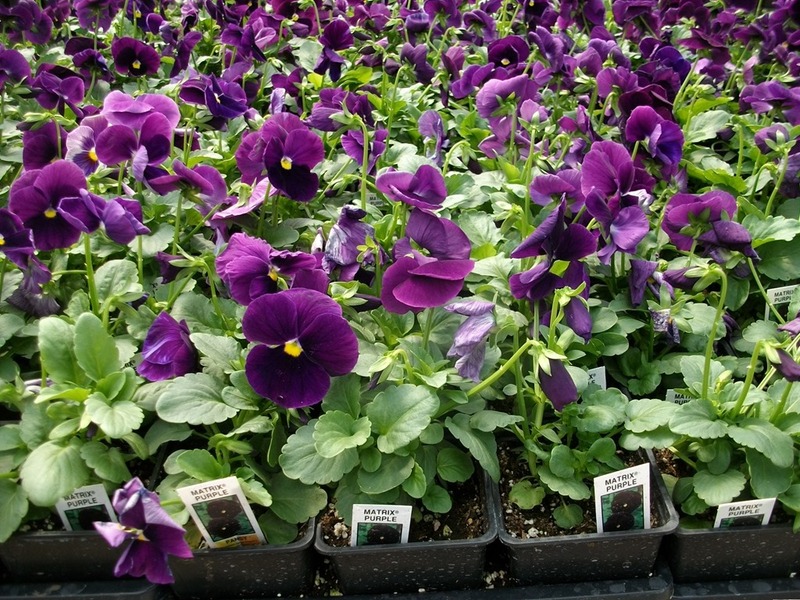 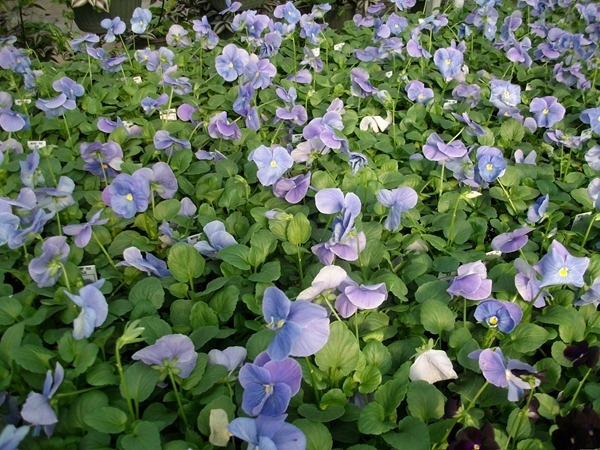 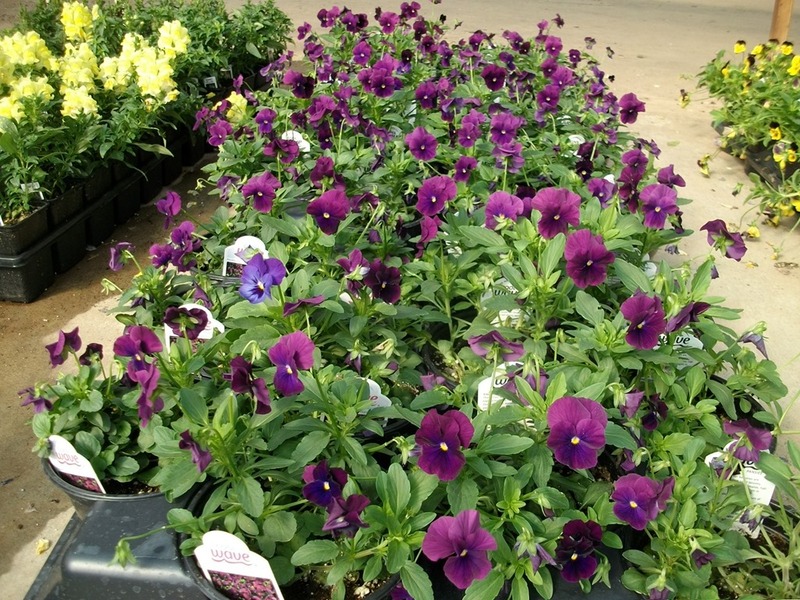 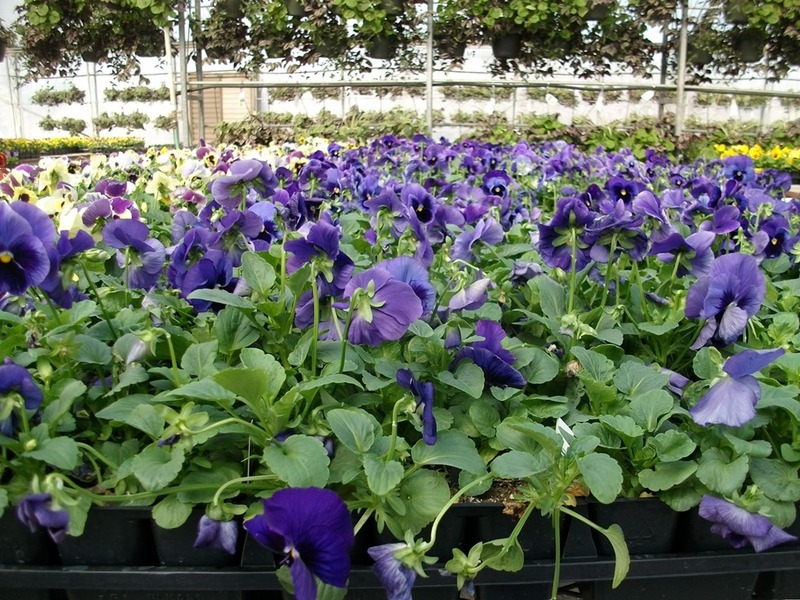 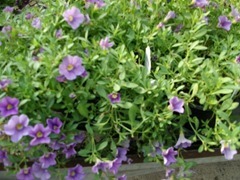 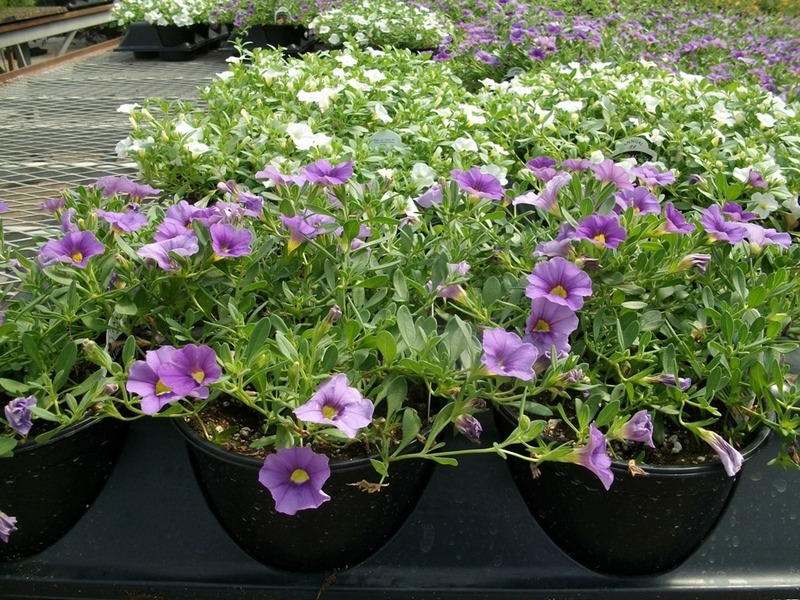 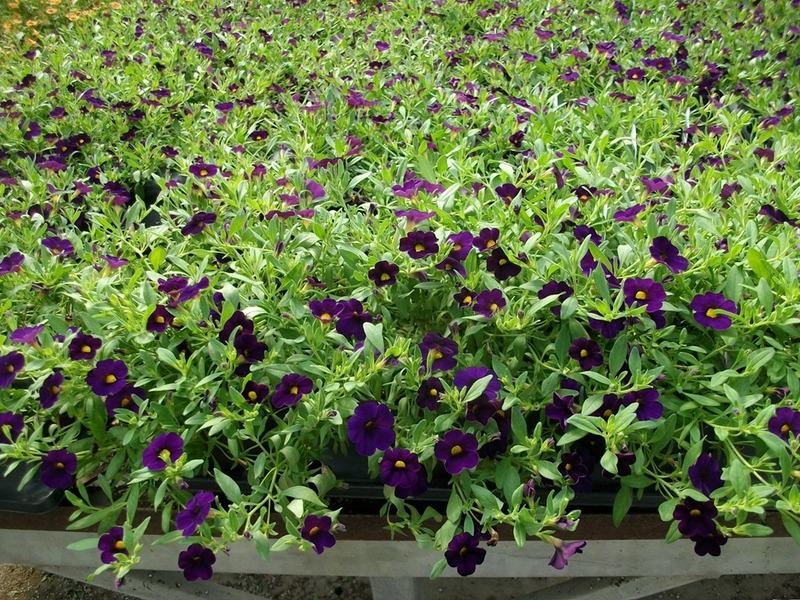 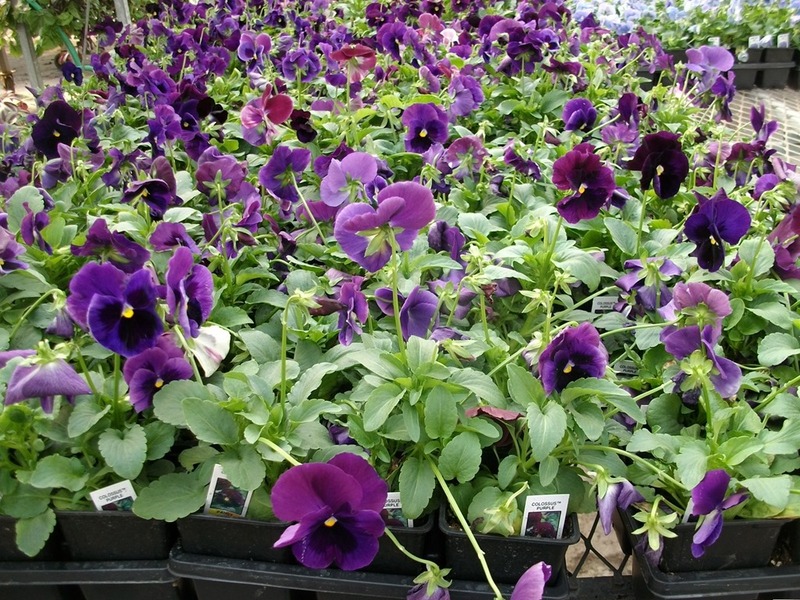 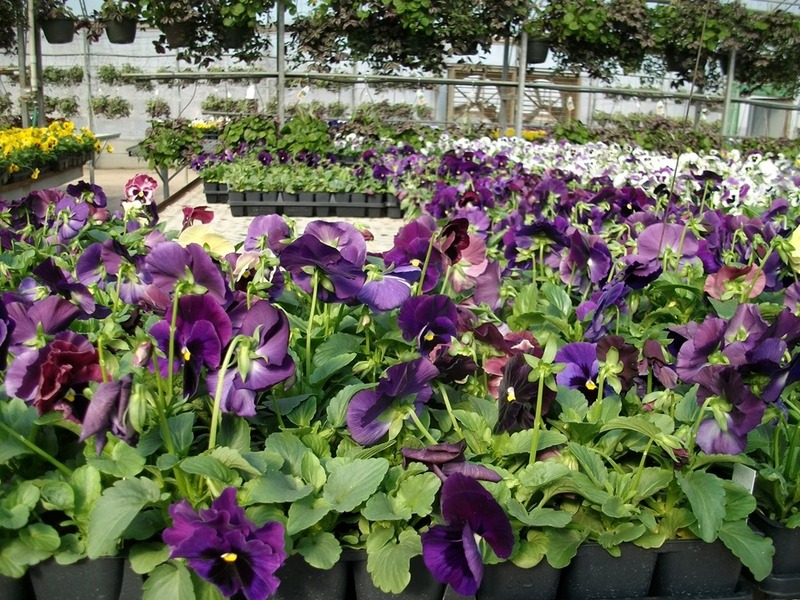 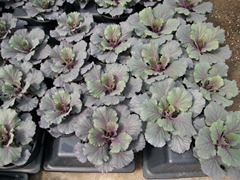 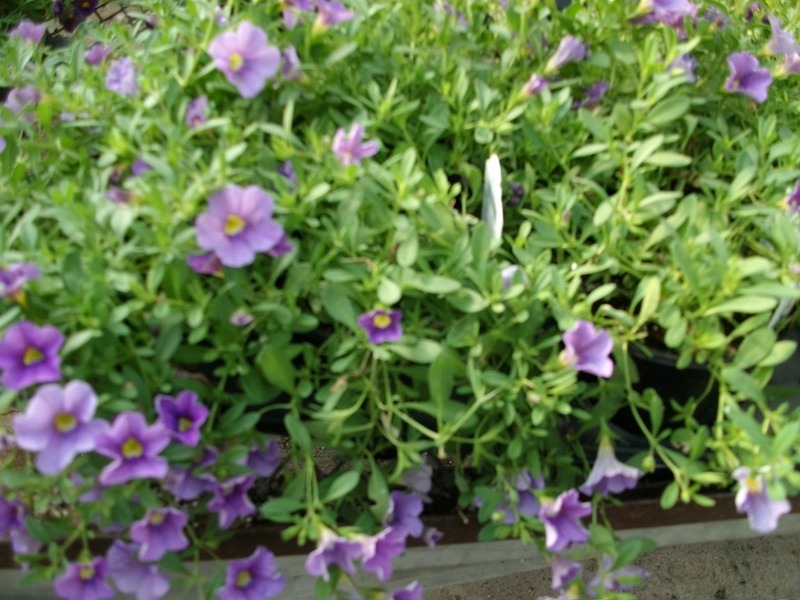 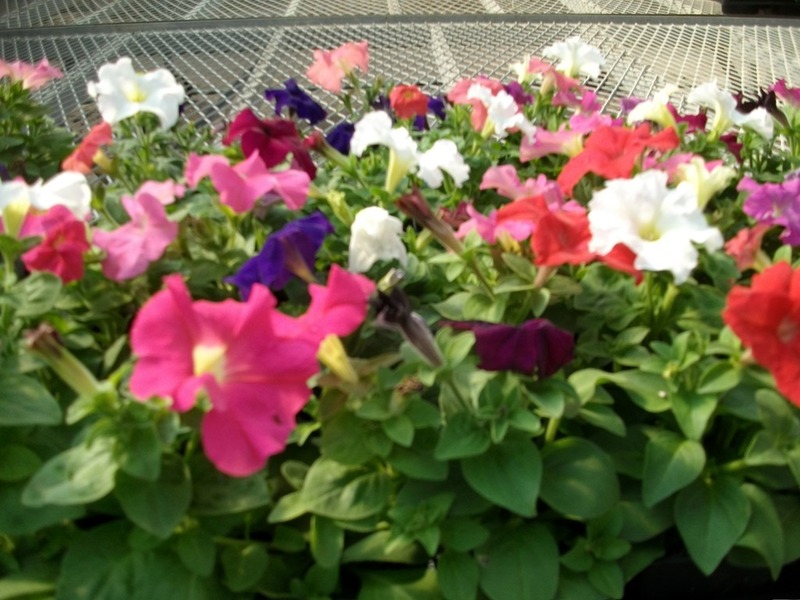 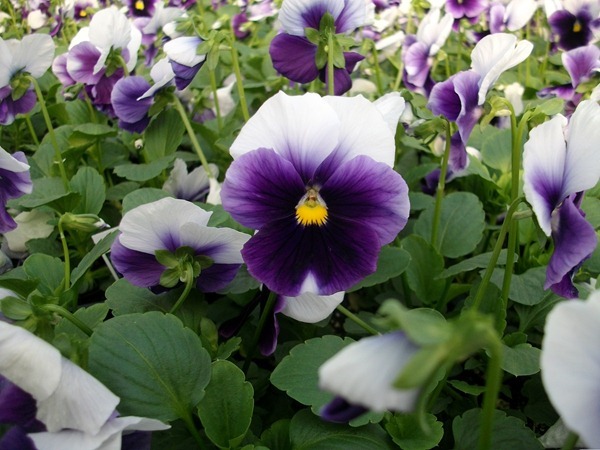 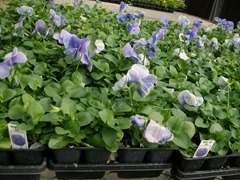 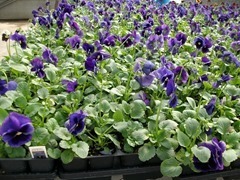 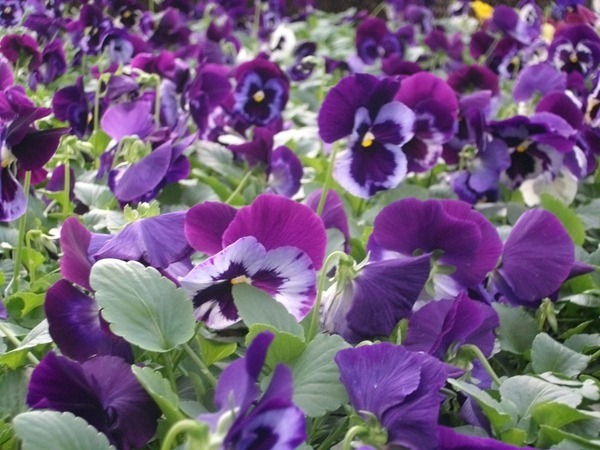 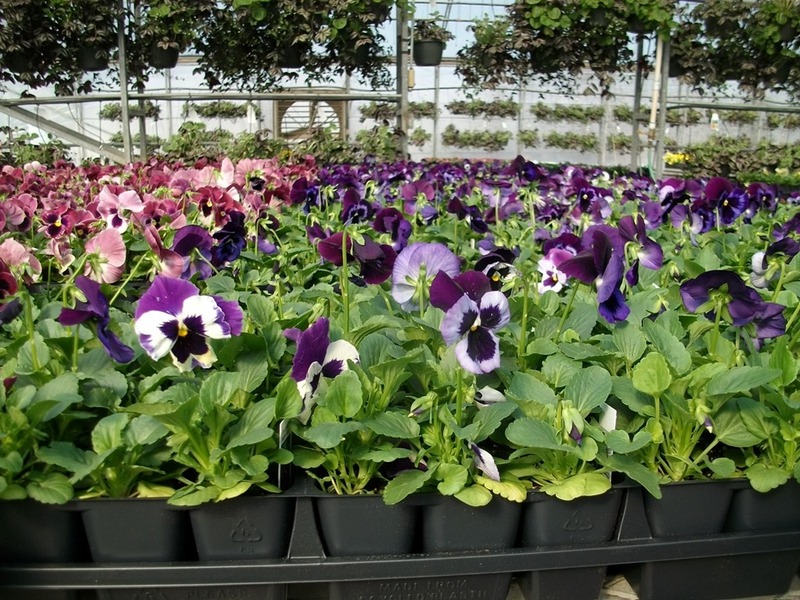 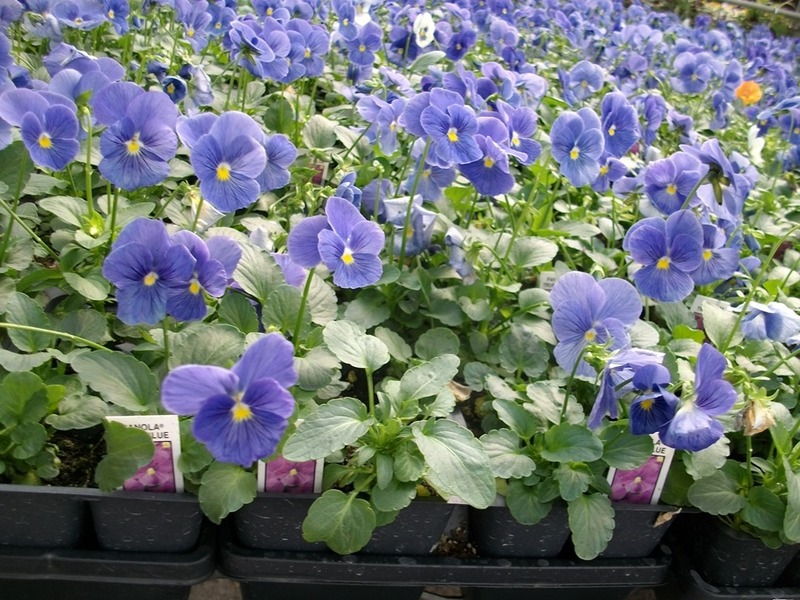 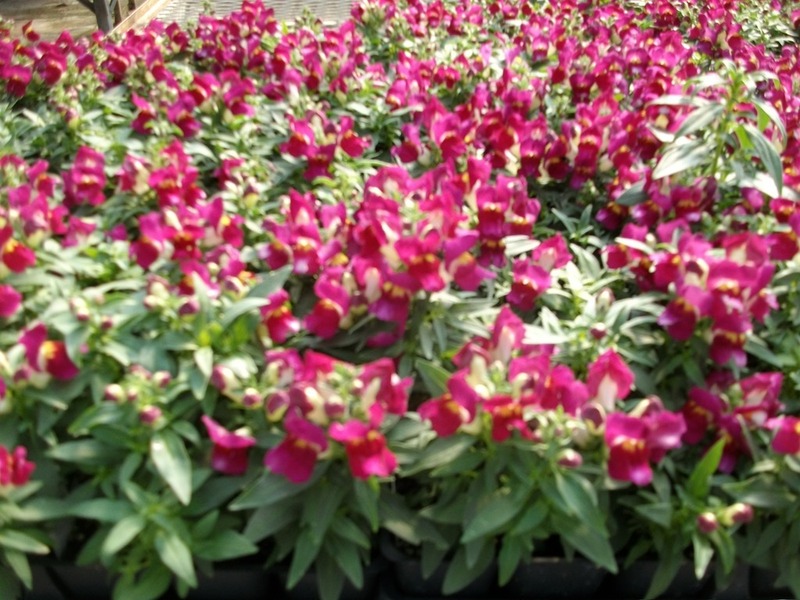 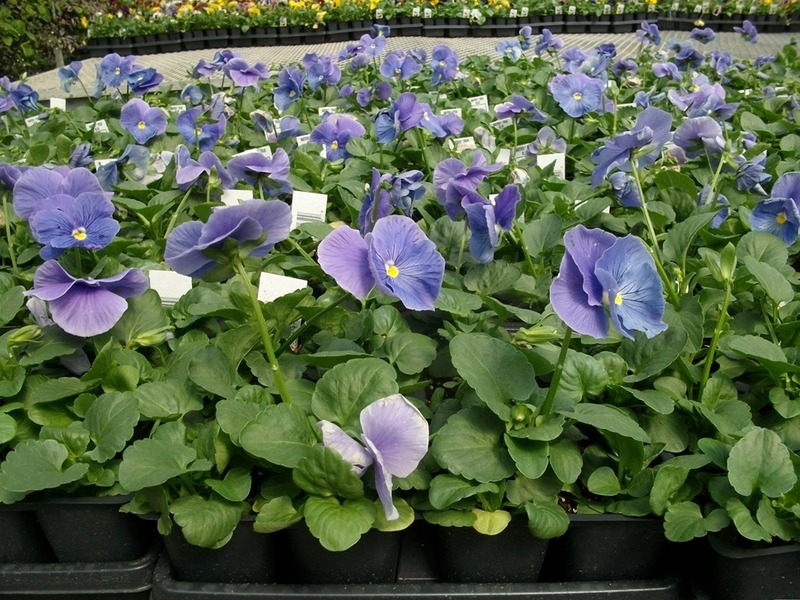 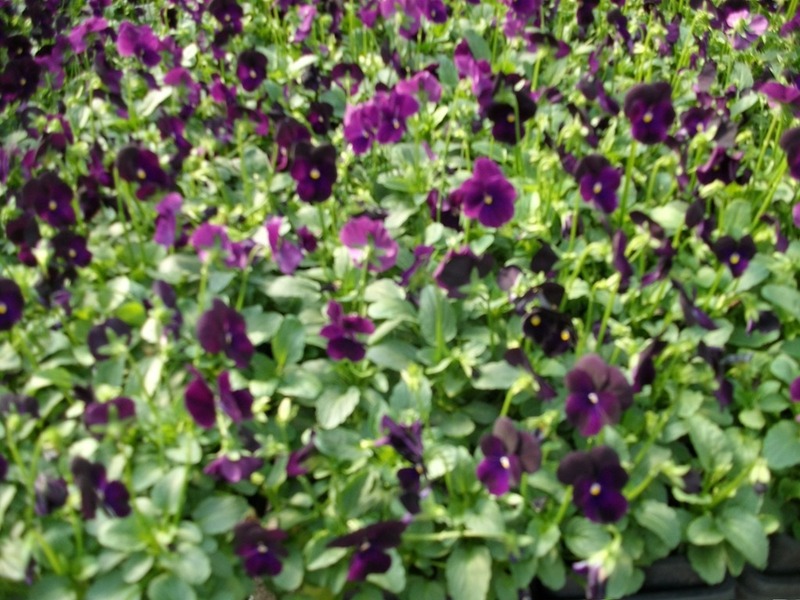 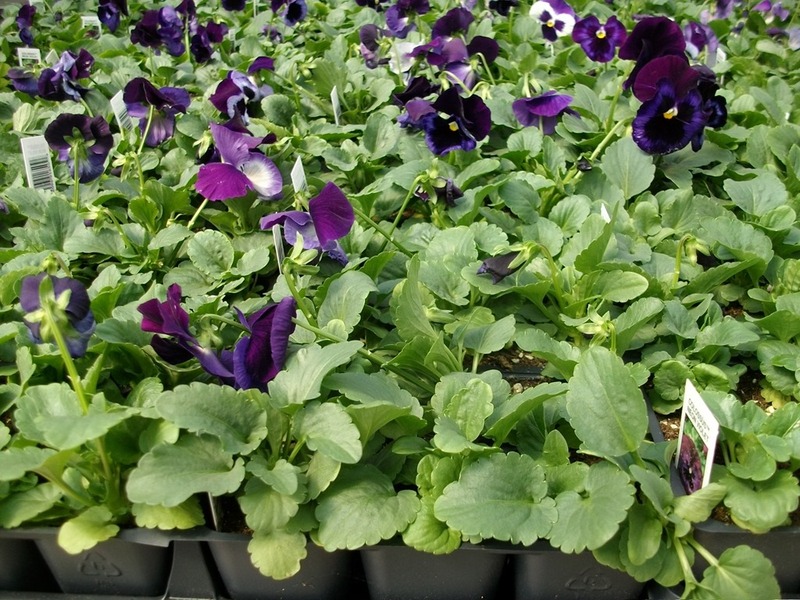 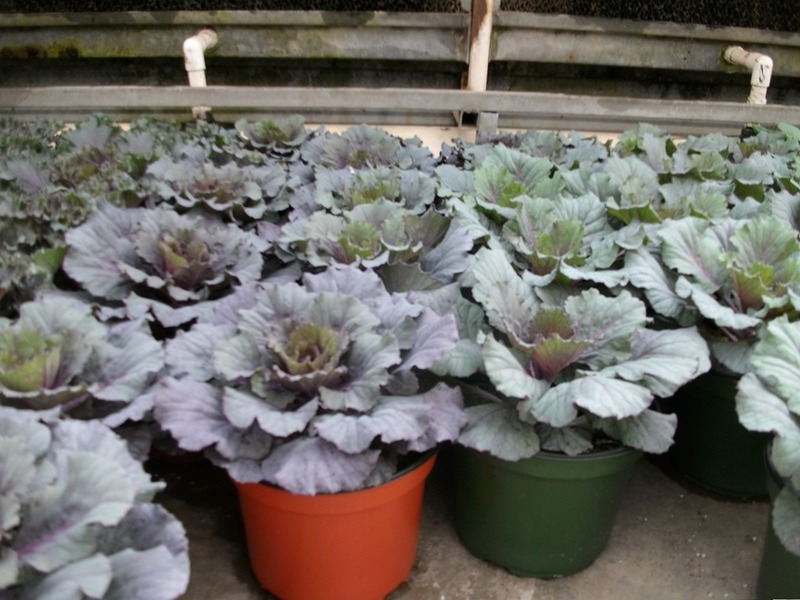 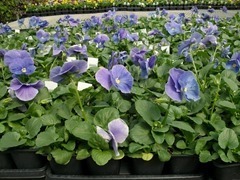 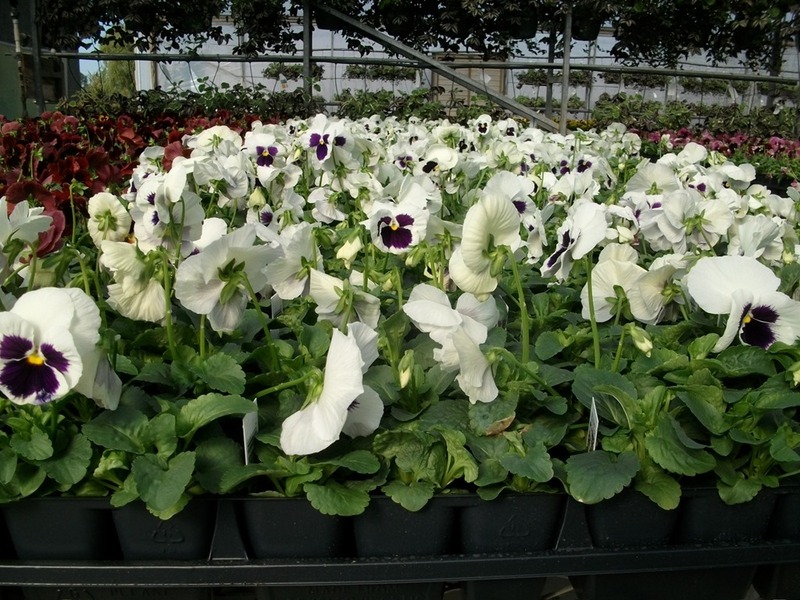 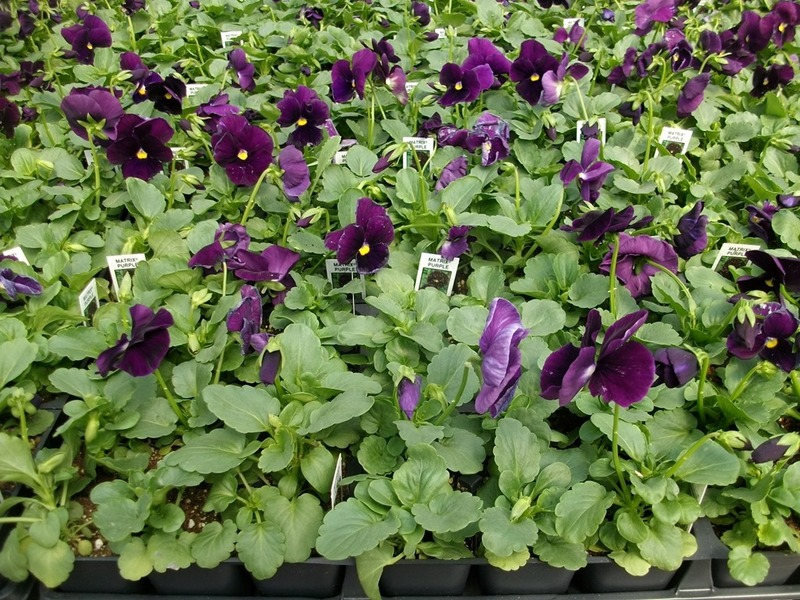 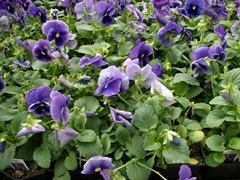 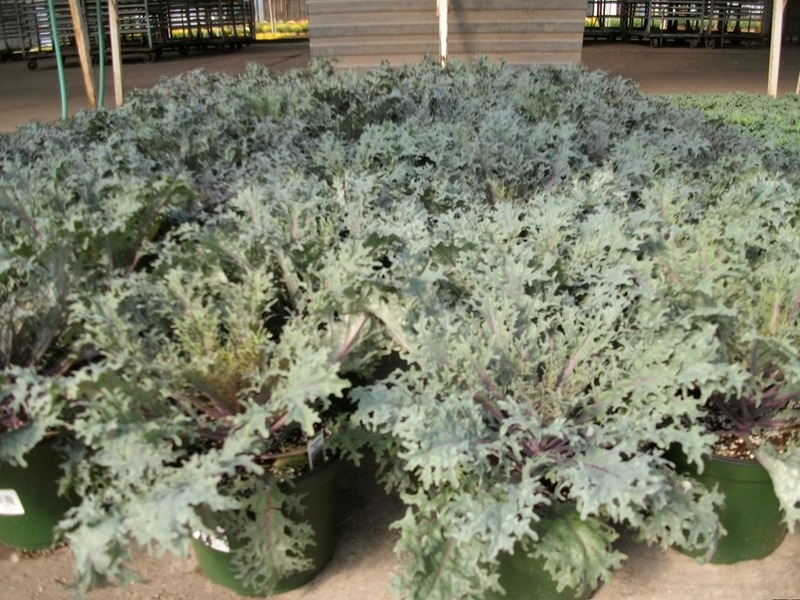 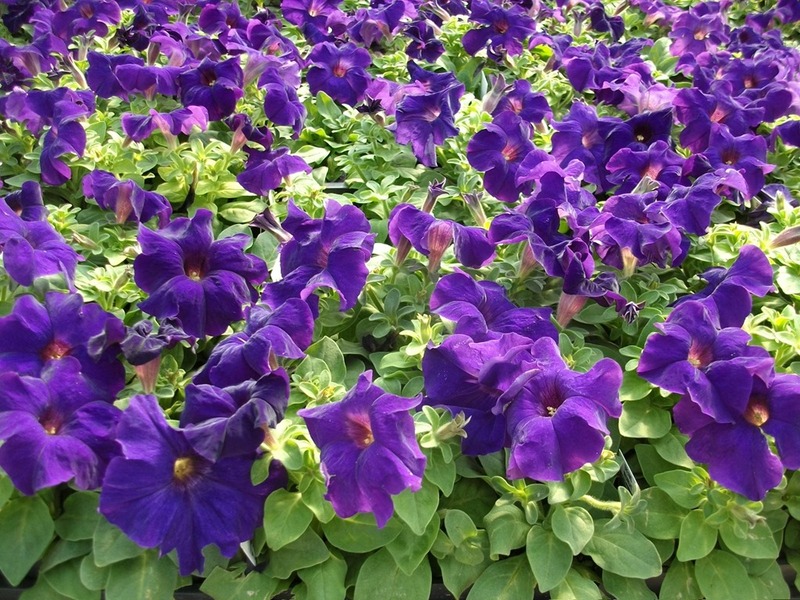 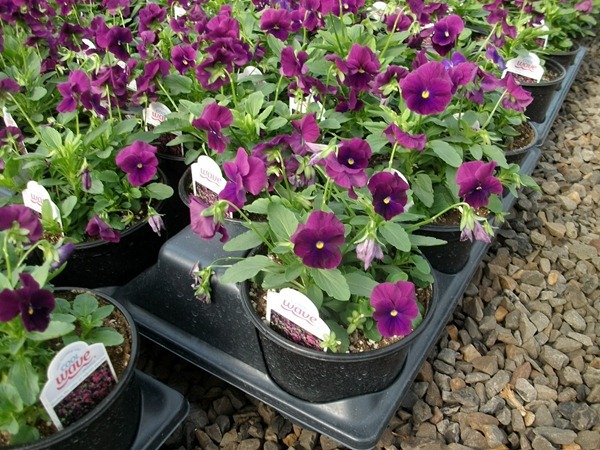 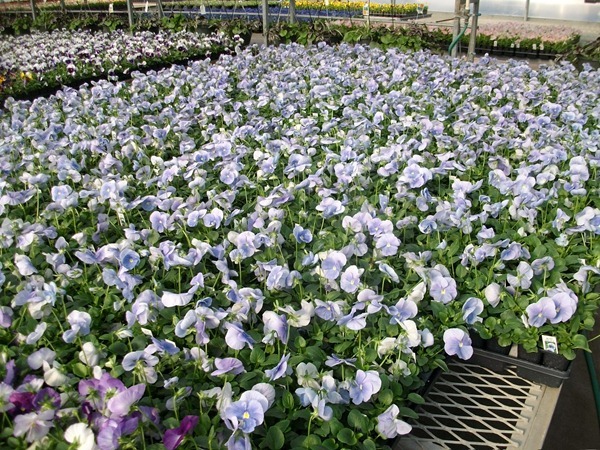 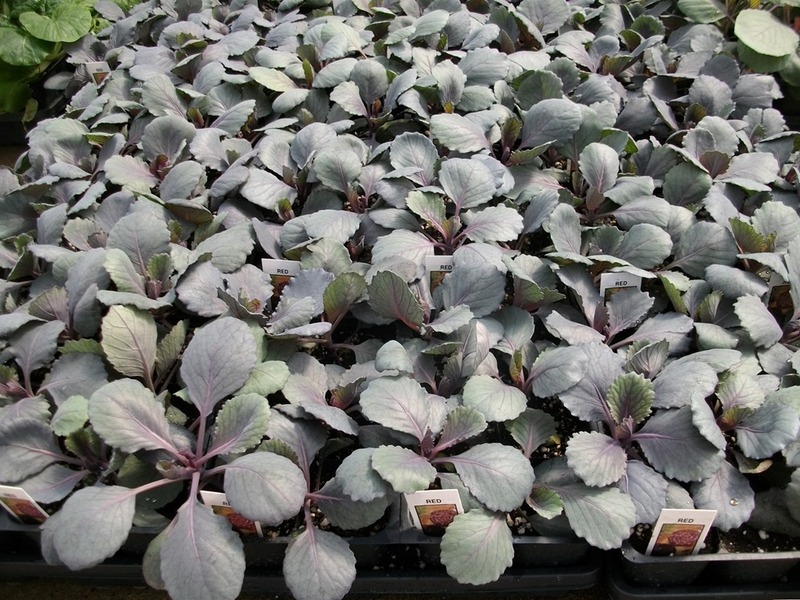 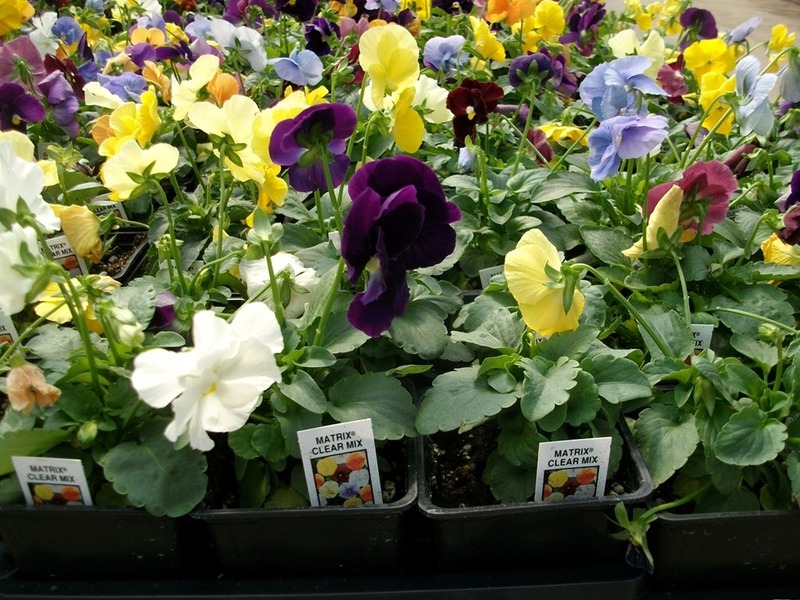 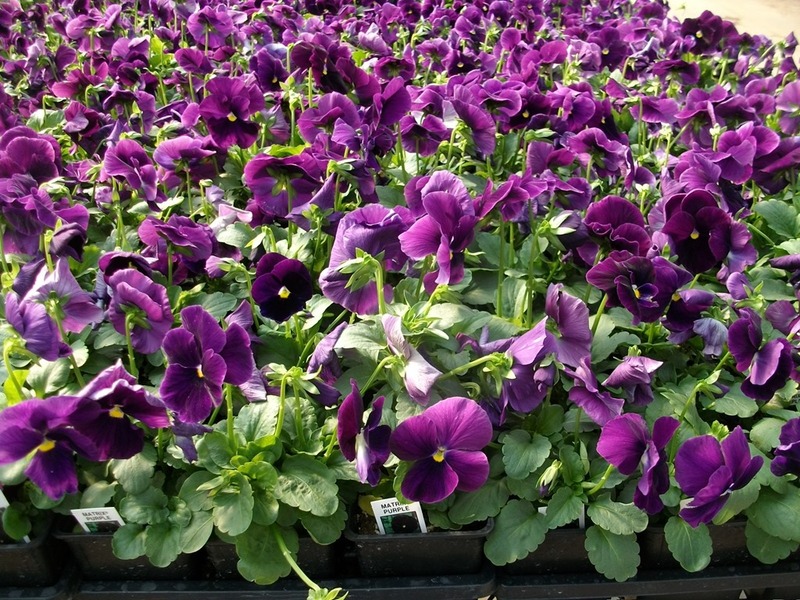 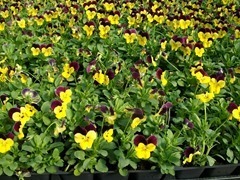 We also added another color to our #6 Cool Wave Pansies this year – Cool Wave Purple Pansy. 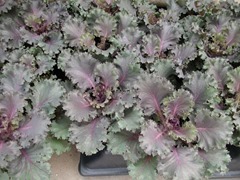 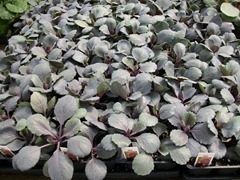 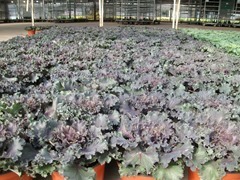 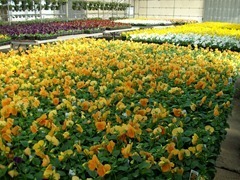 It is more vigorous than the other colors and we have some ready now. 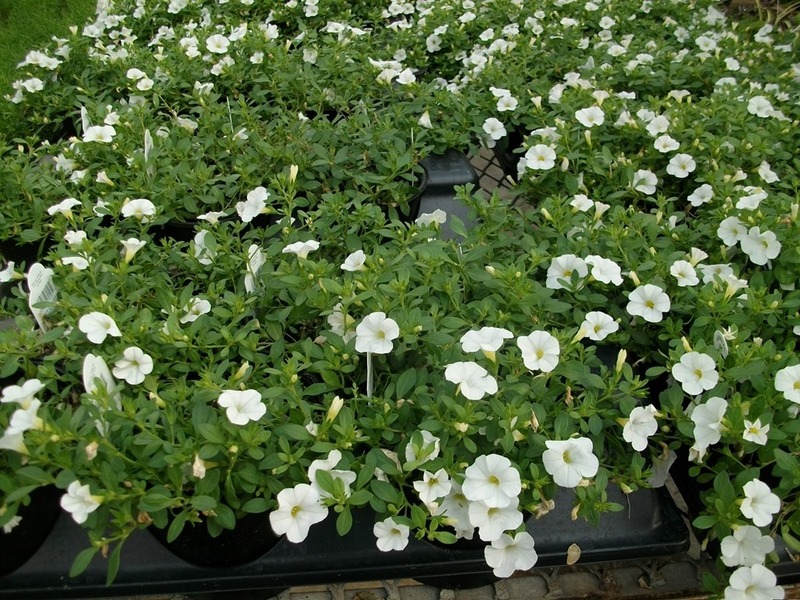 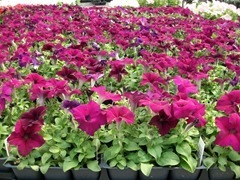 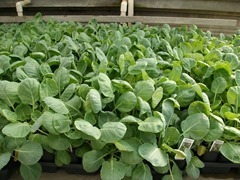 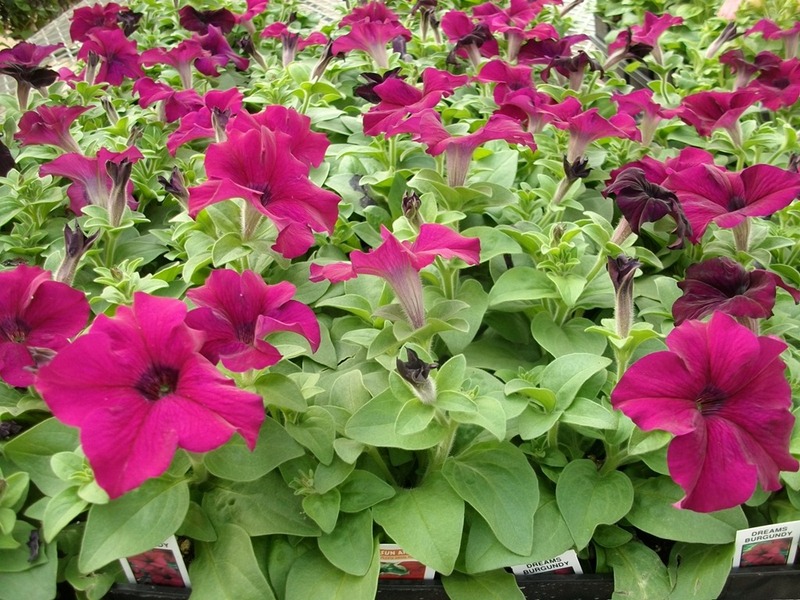 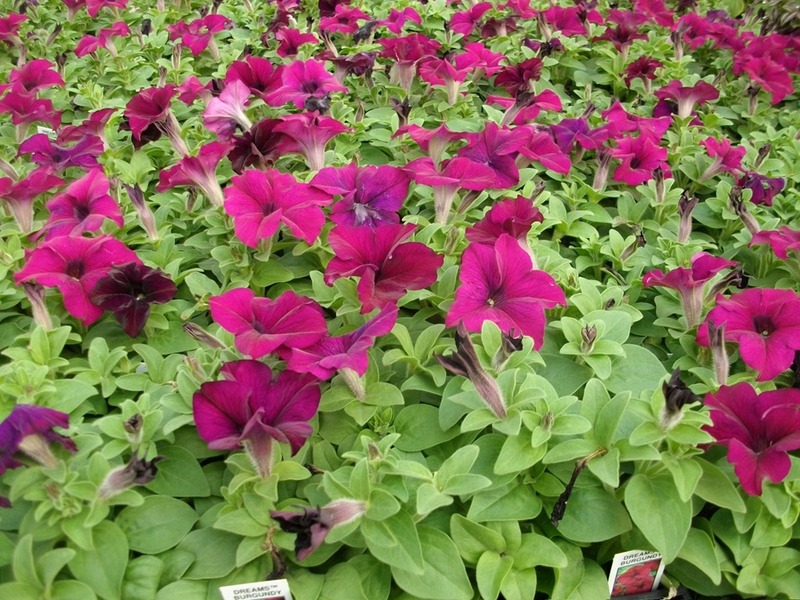 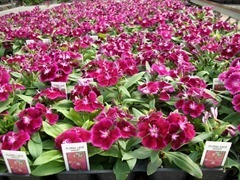 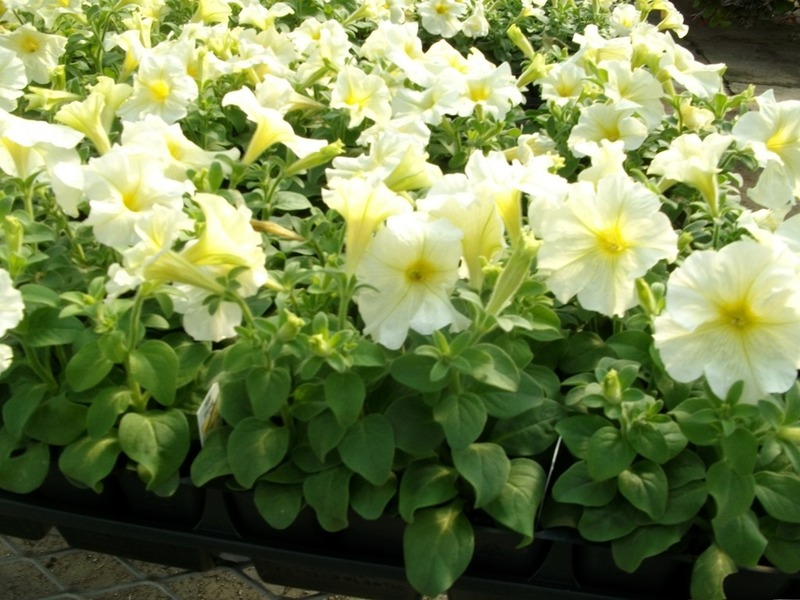 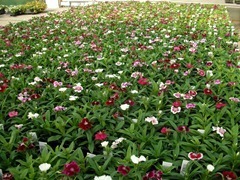 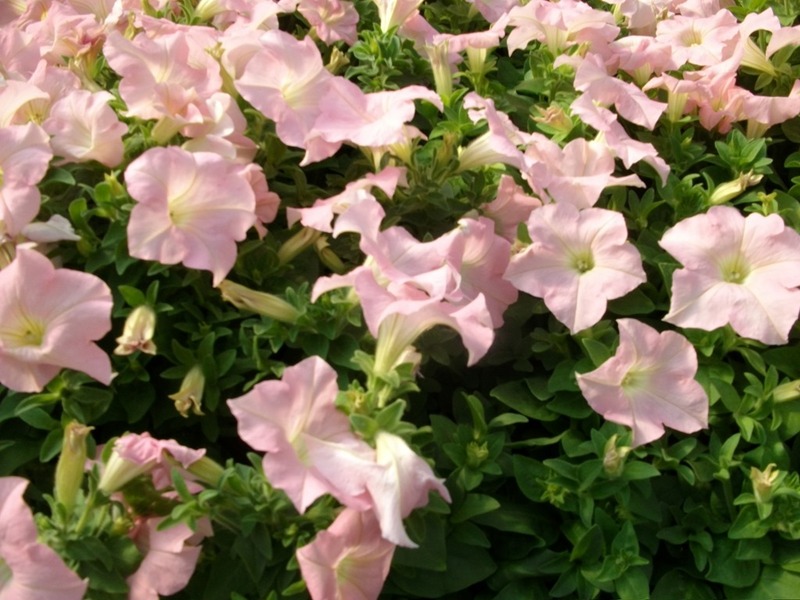 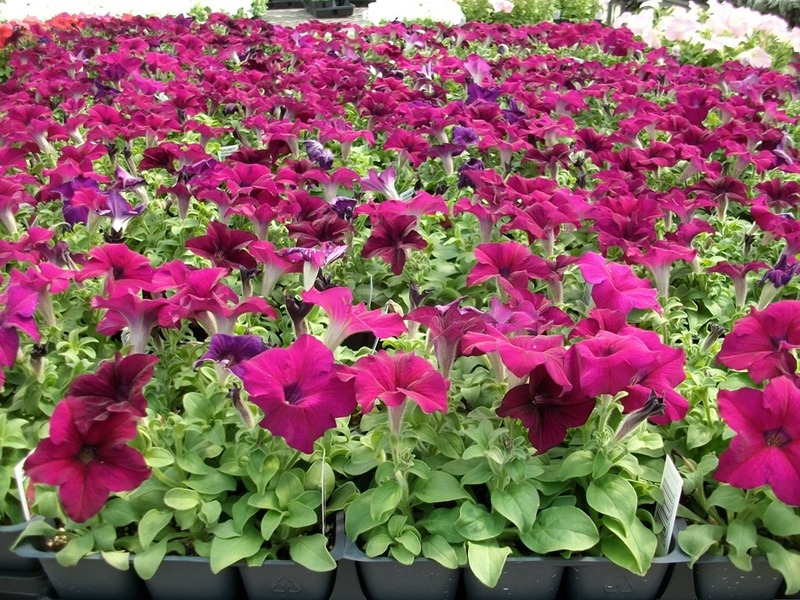 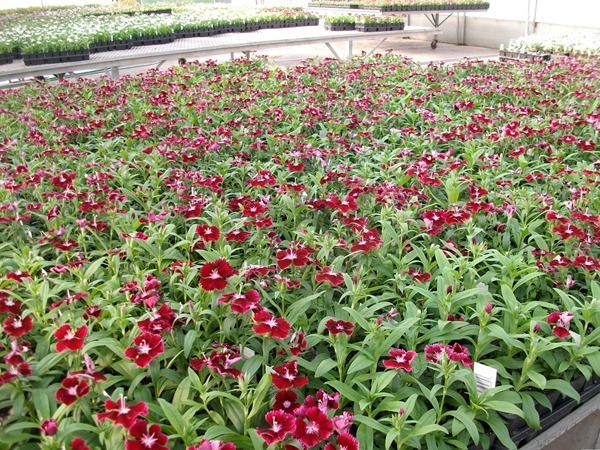 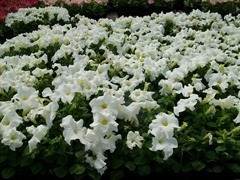 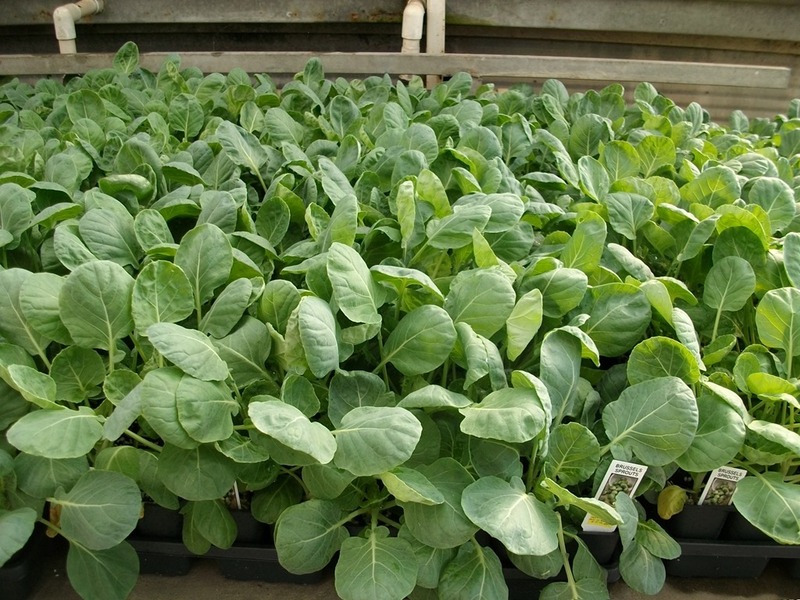 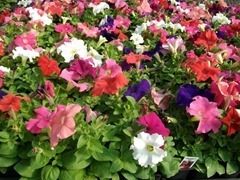 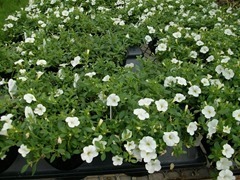 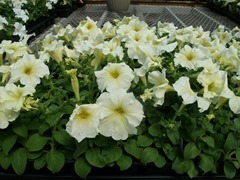 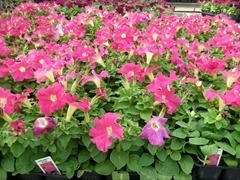 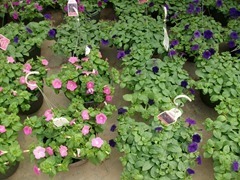 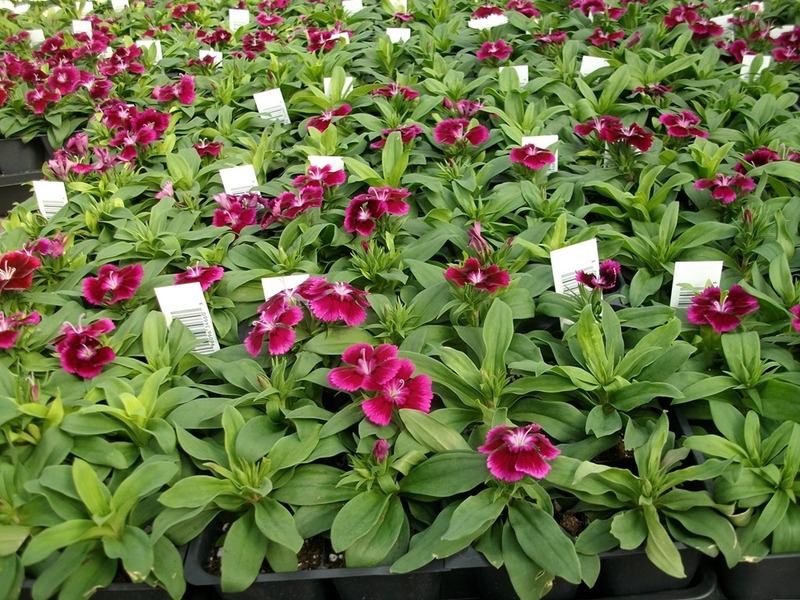 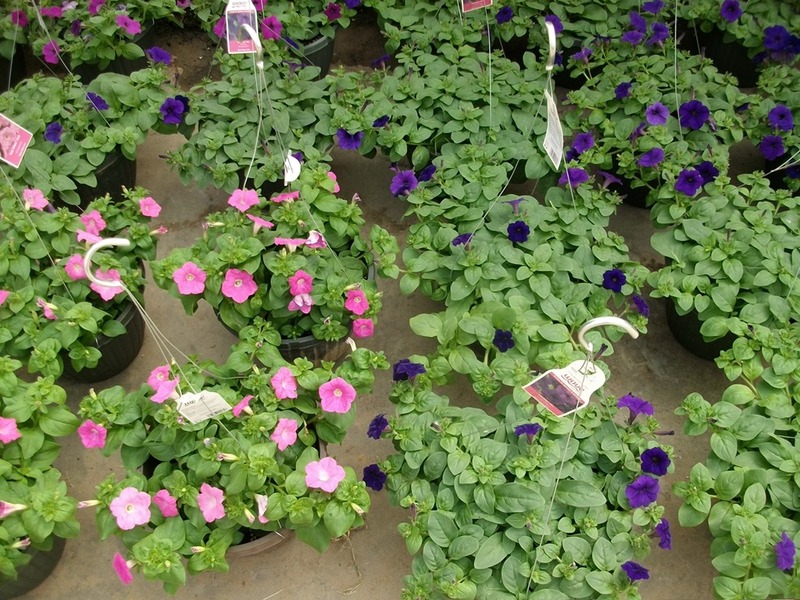 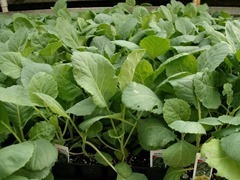 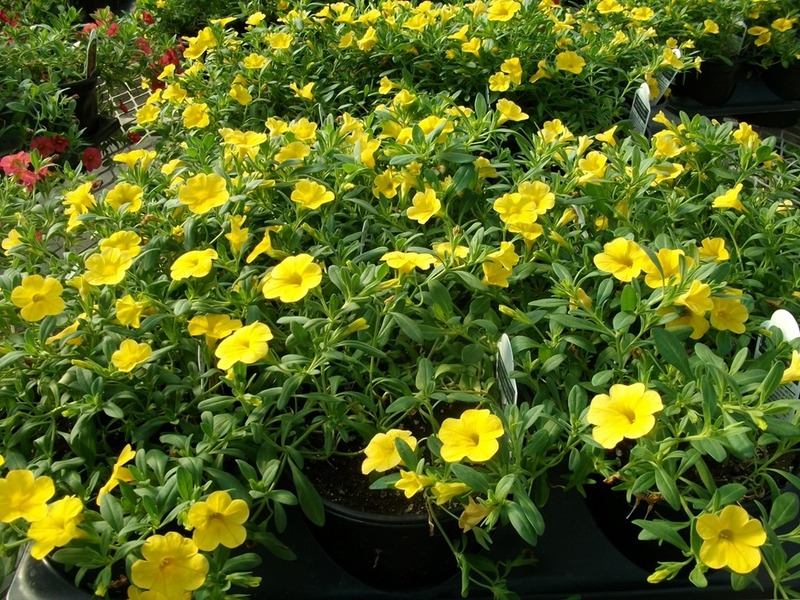 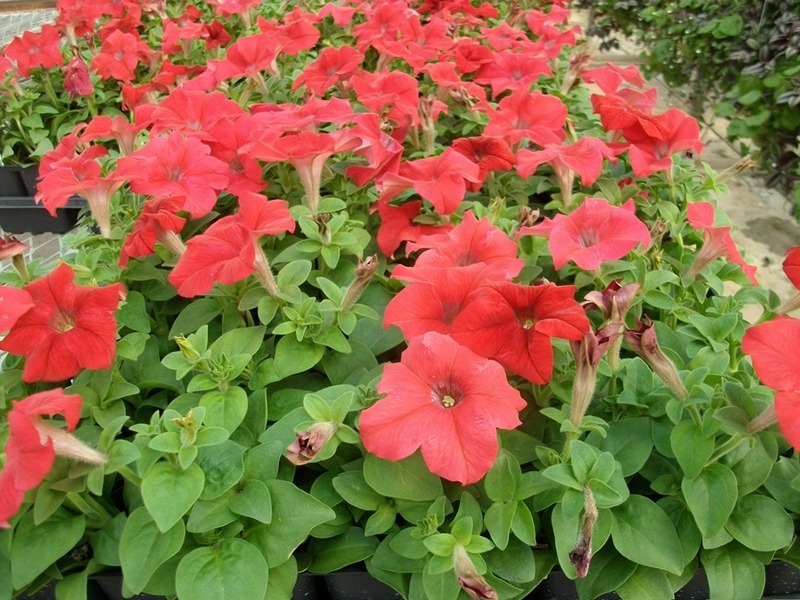 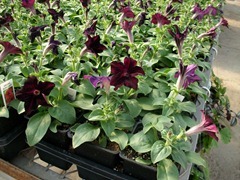 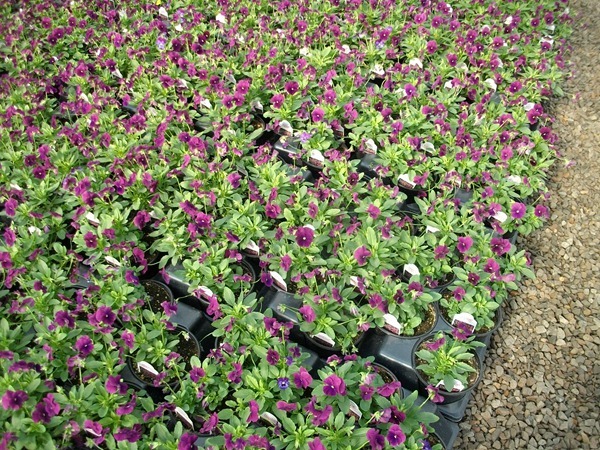 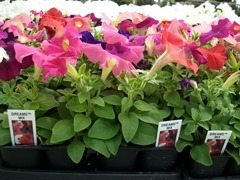 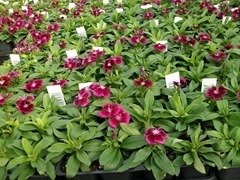 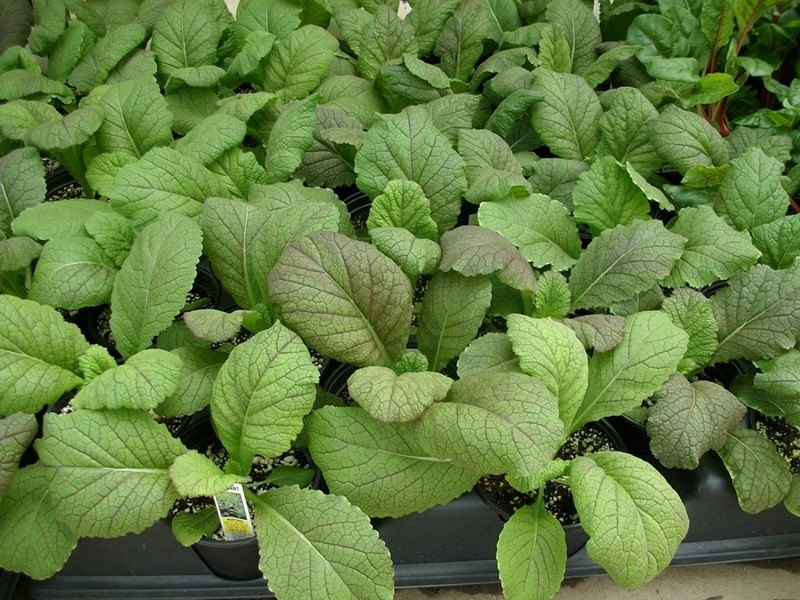 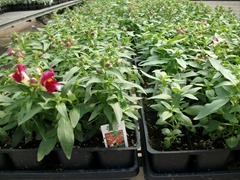 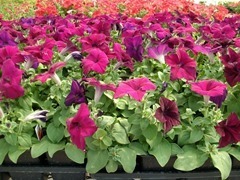 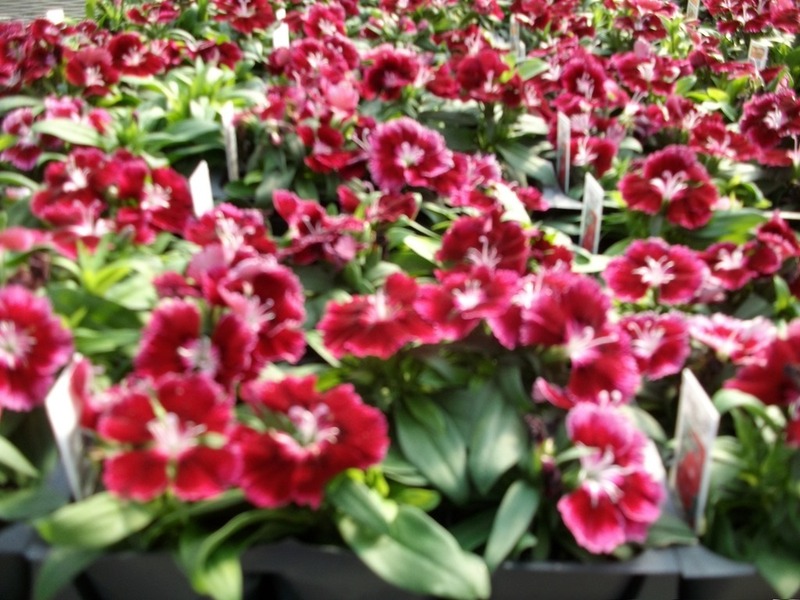 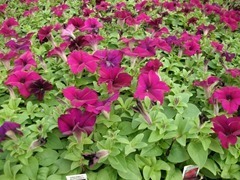 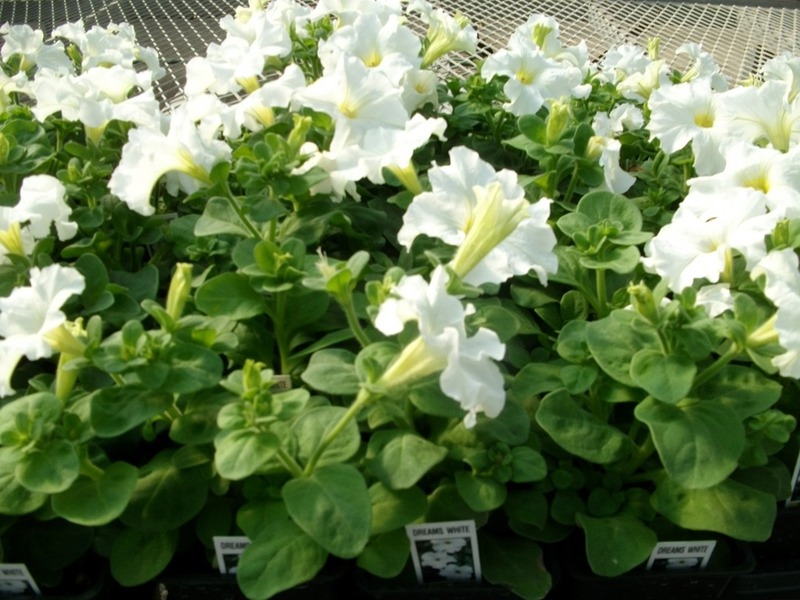 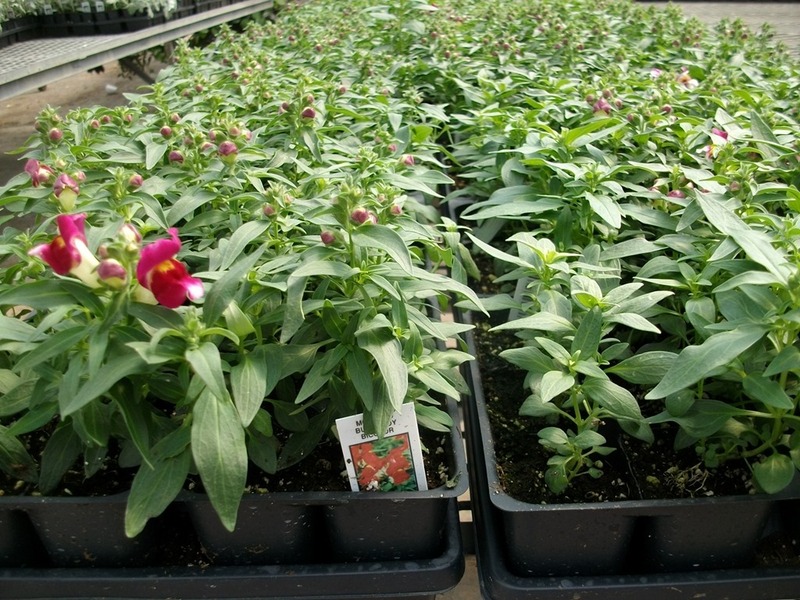 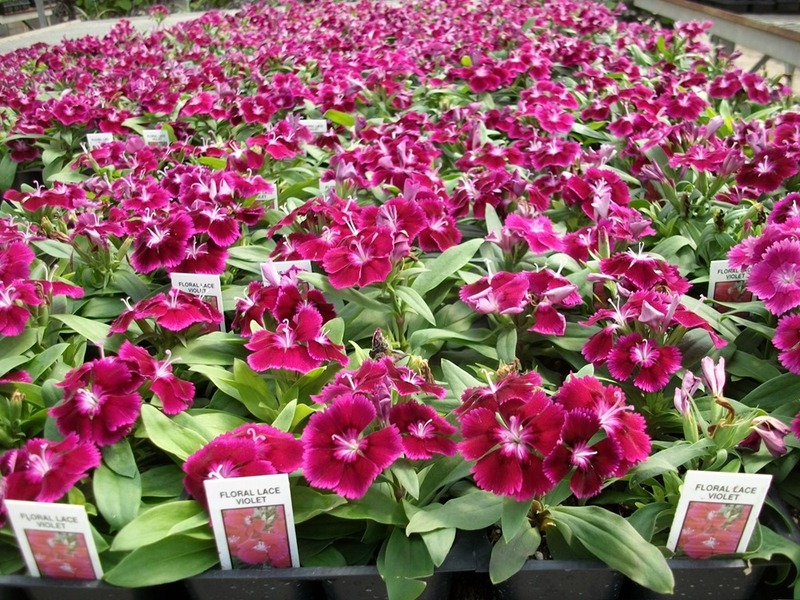 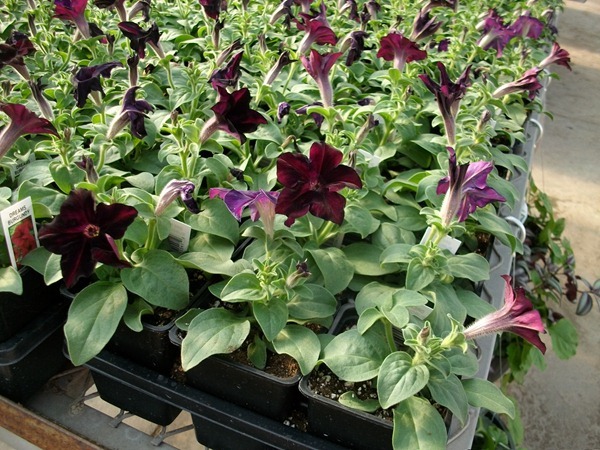 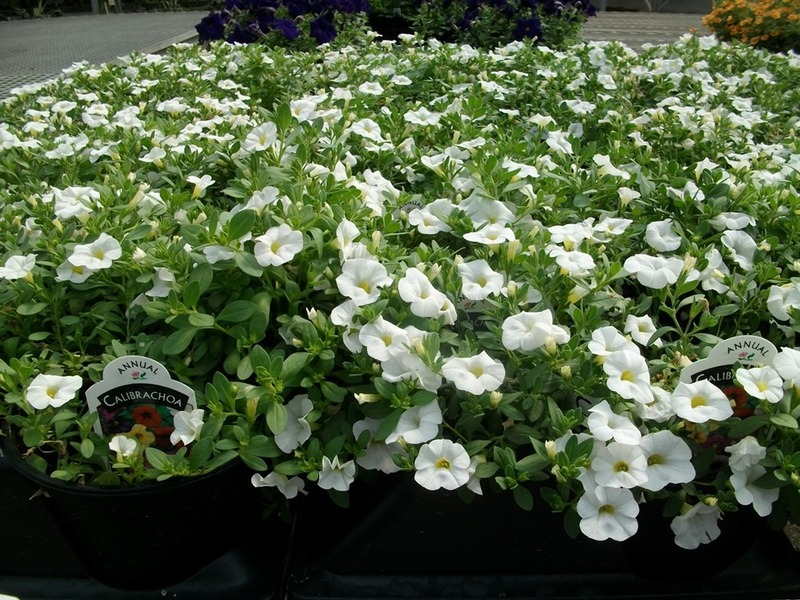 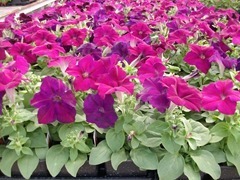 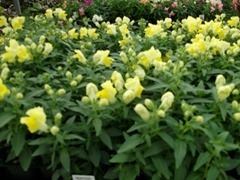 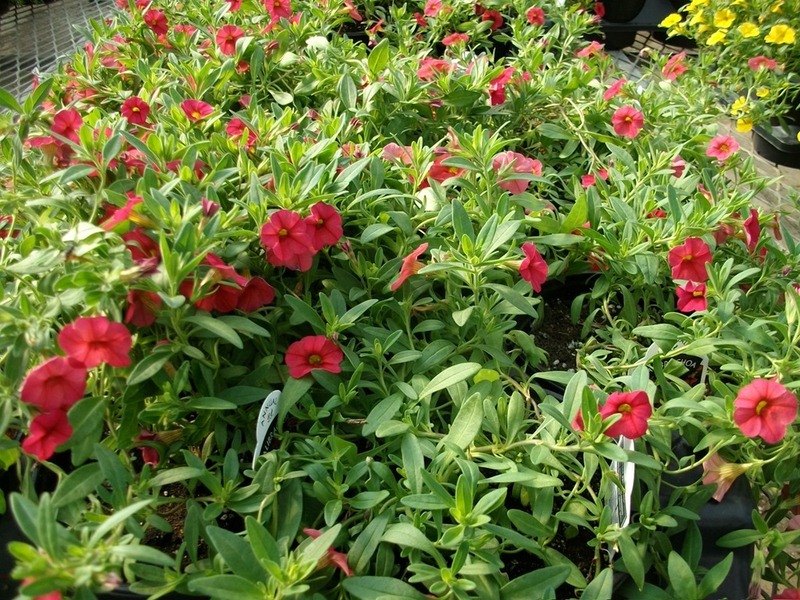 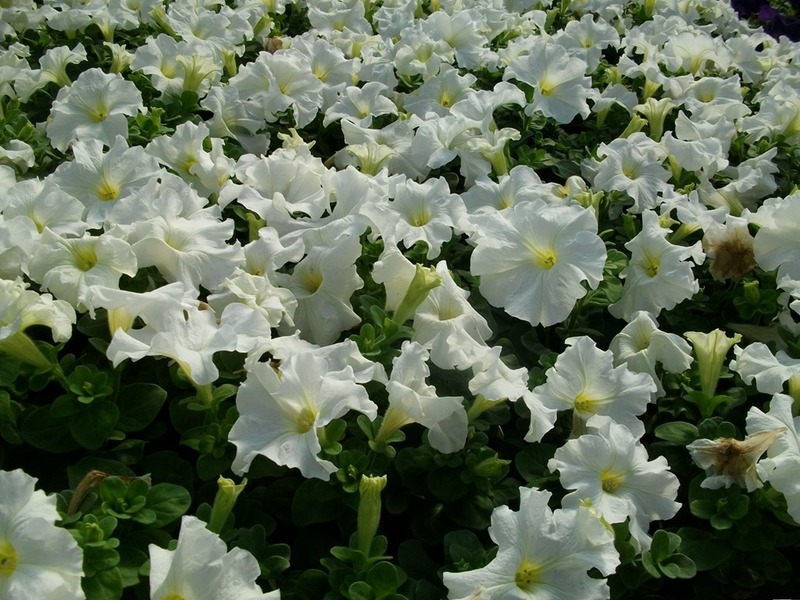 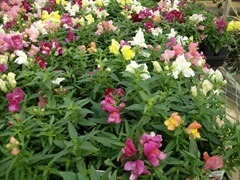 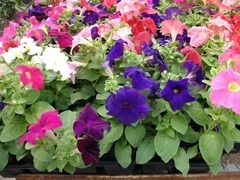 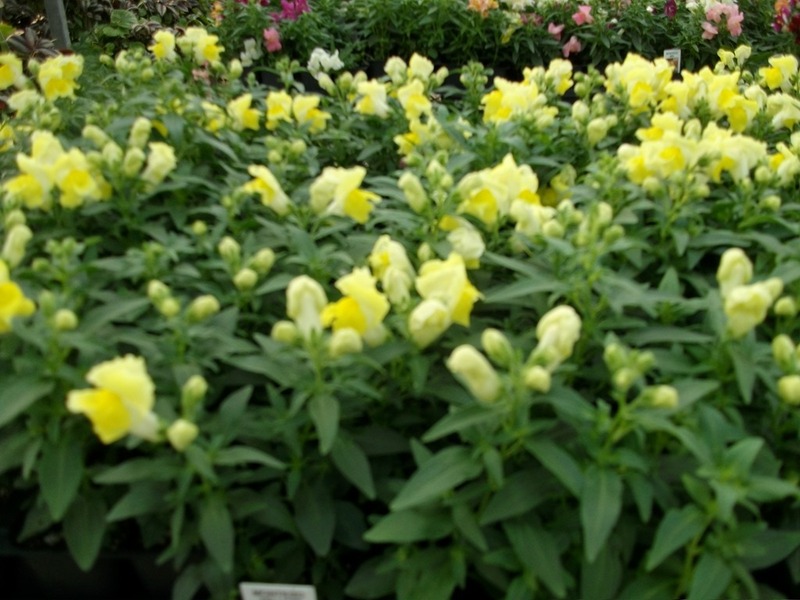 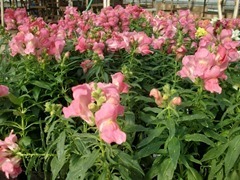 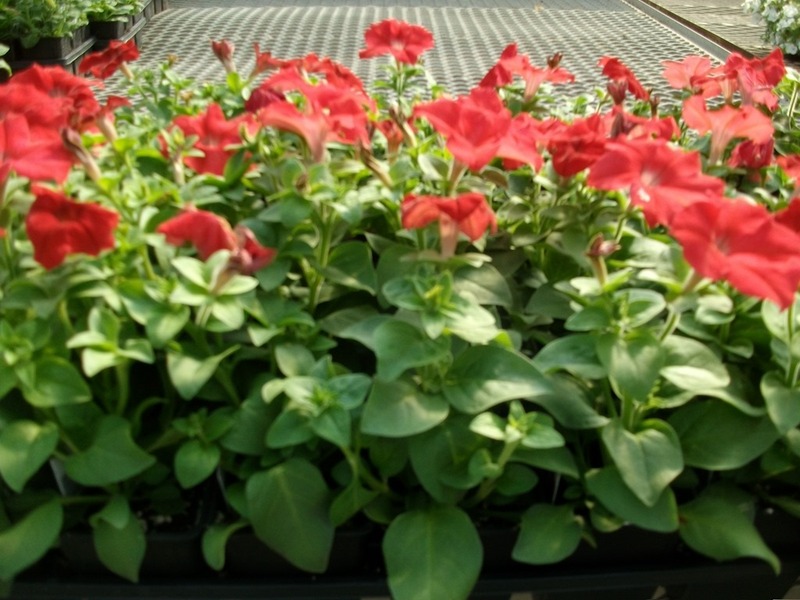 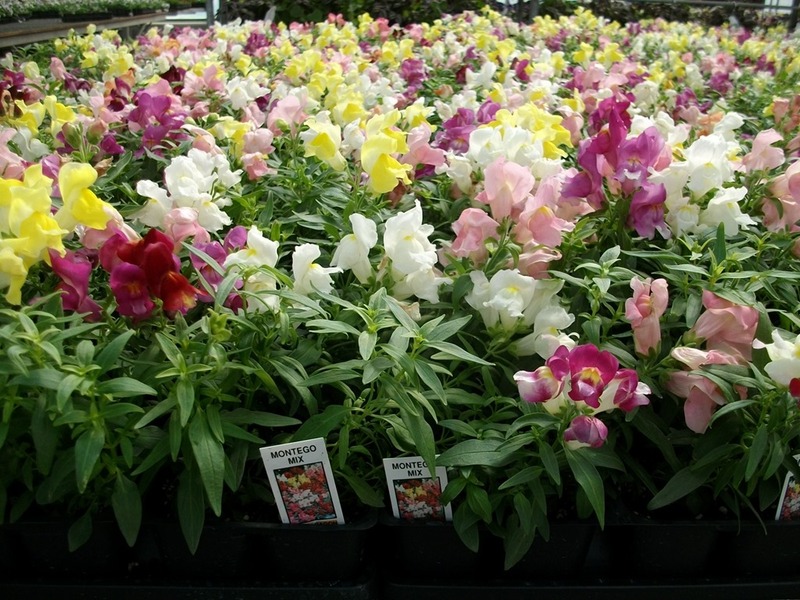 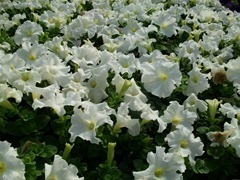 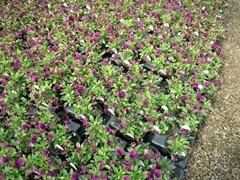 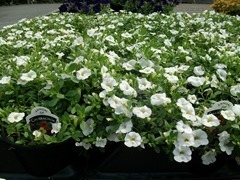 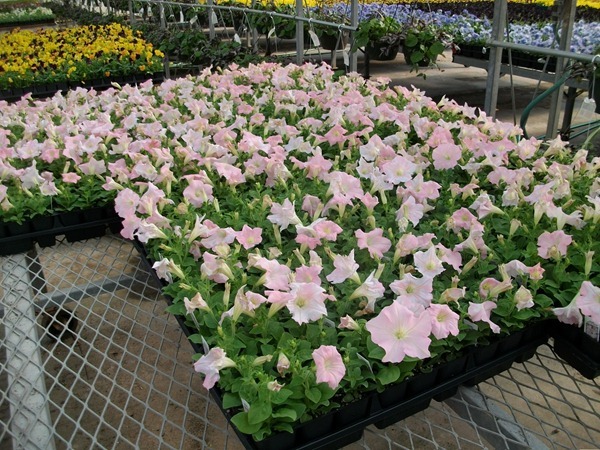 We also have J6 and 1801 petunias ready. 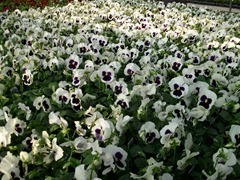 I didn’t take many pictures of them. 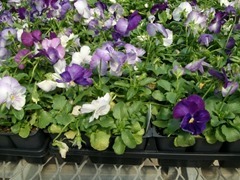 We sprayed them with a fungicide that damaged the blooms. 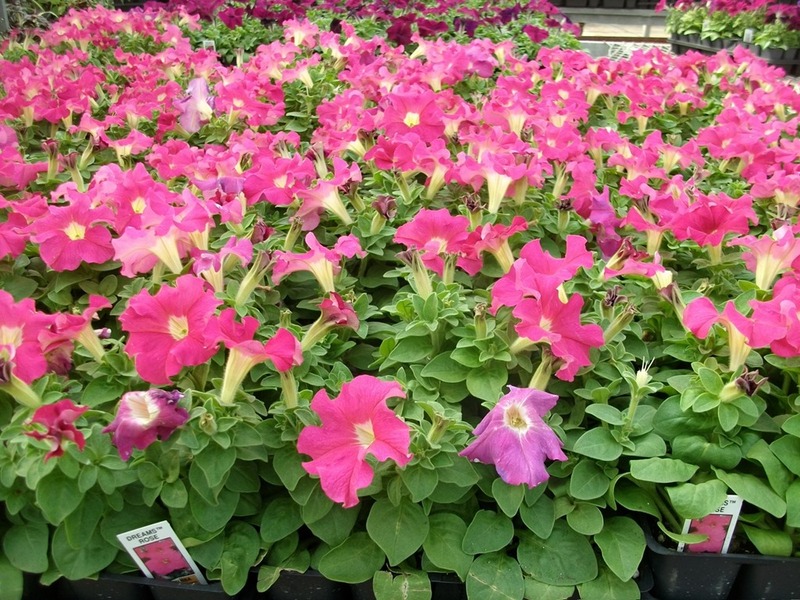 We will be picking bad blooms of them first thing Tuesday but they should still have plenty of color by the time we get to shipping them. 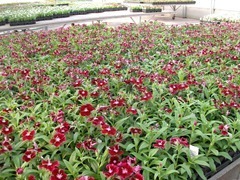 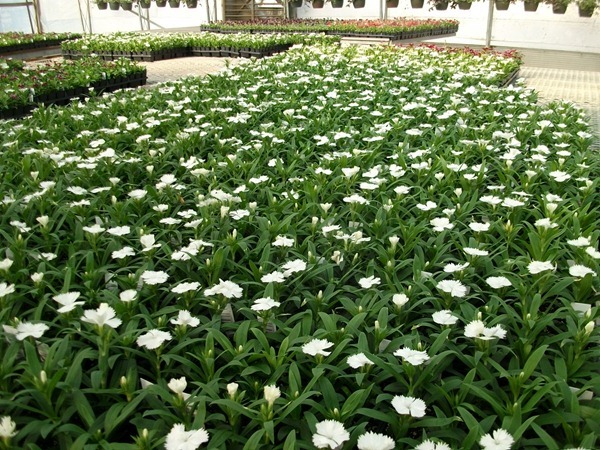 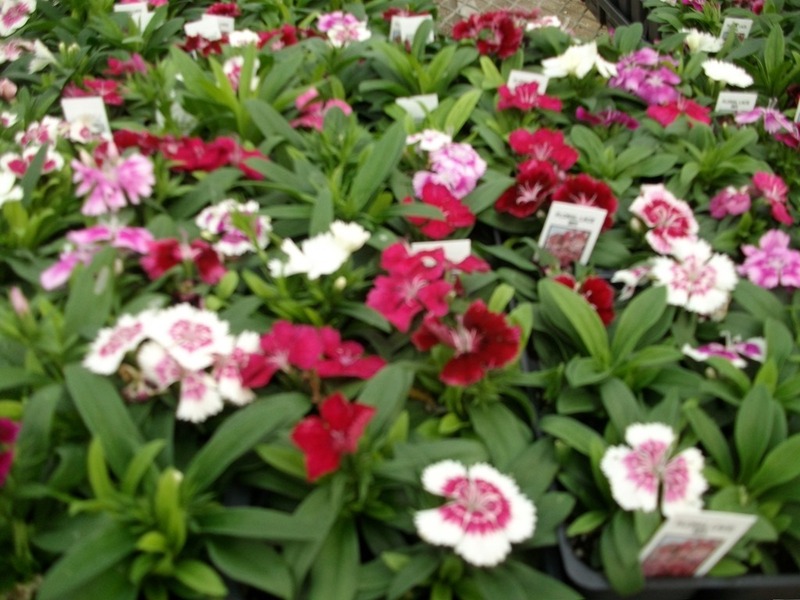 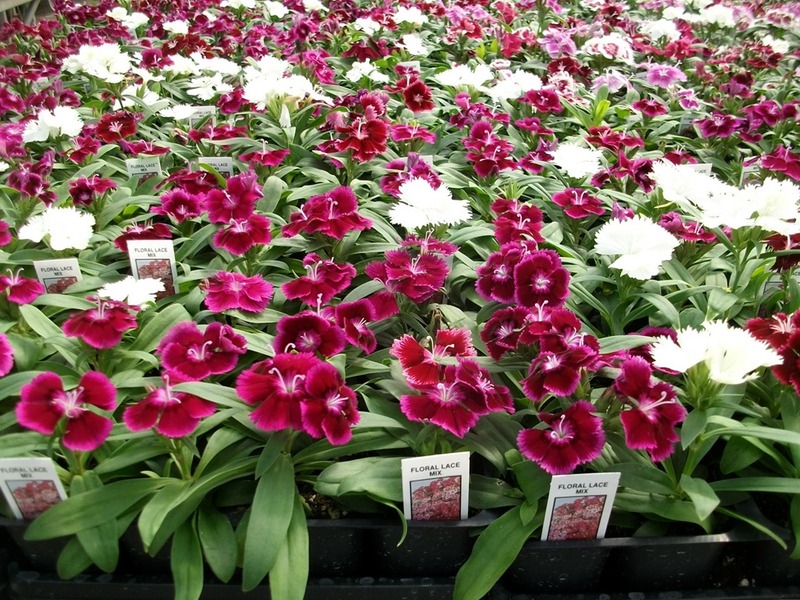 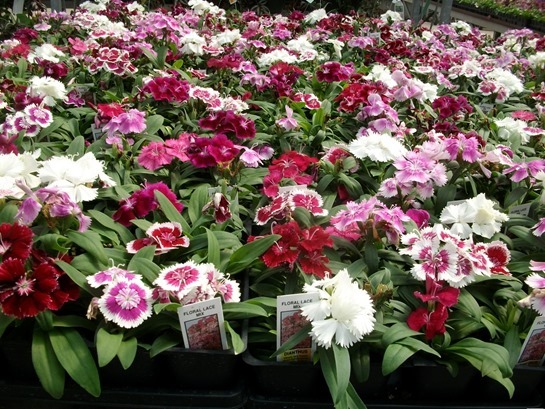 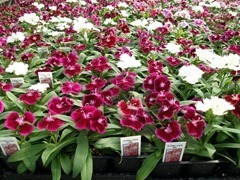 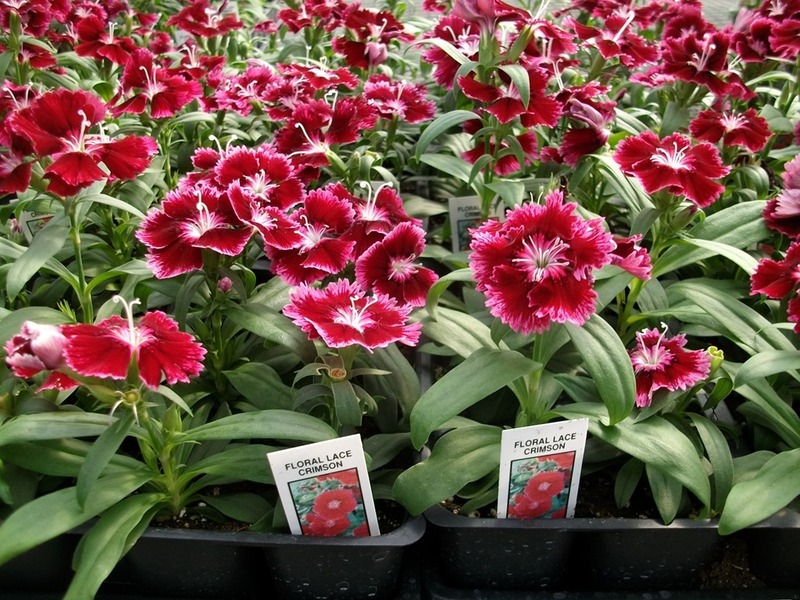 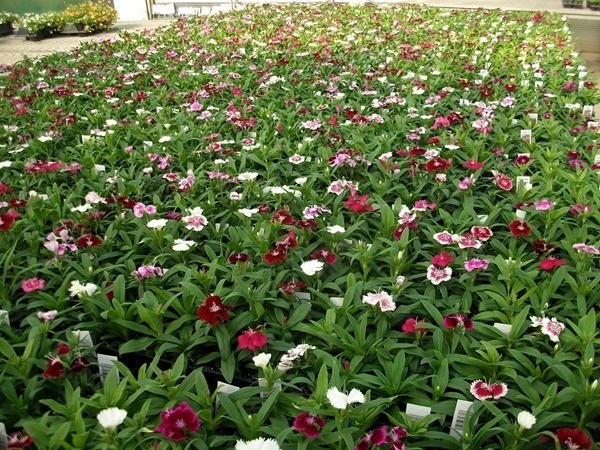 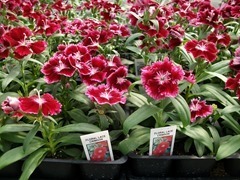 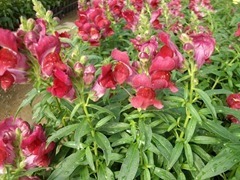 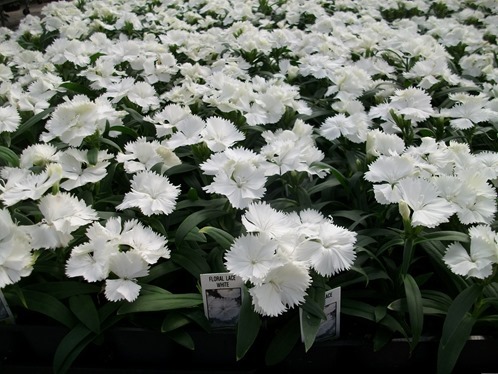 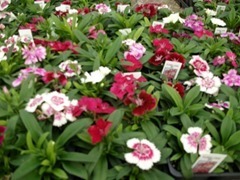 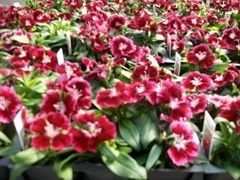 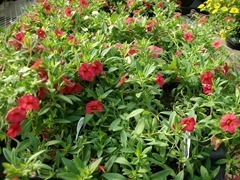 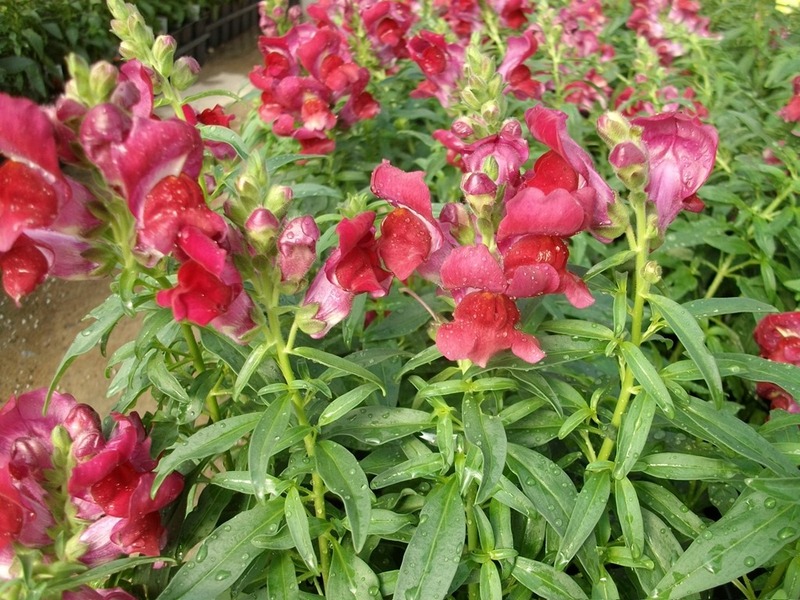 The dianthus and snapdragons have good color. 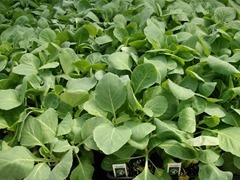 We are almost out of a couple of colors of 1801 Sonnet Snaps but the next crop might be ready by the middle of next week. 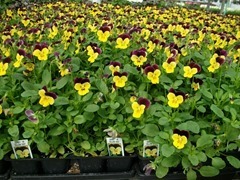 I am going to look at them Tuesday morning and make the call then. 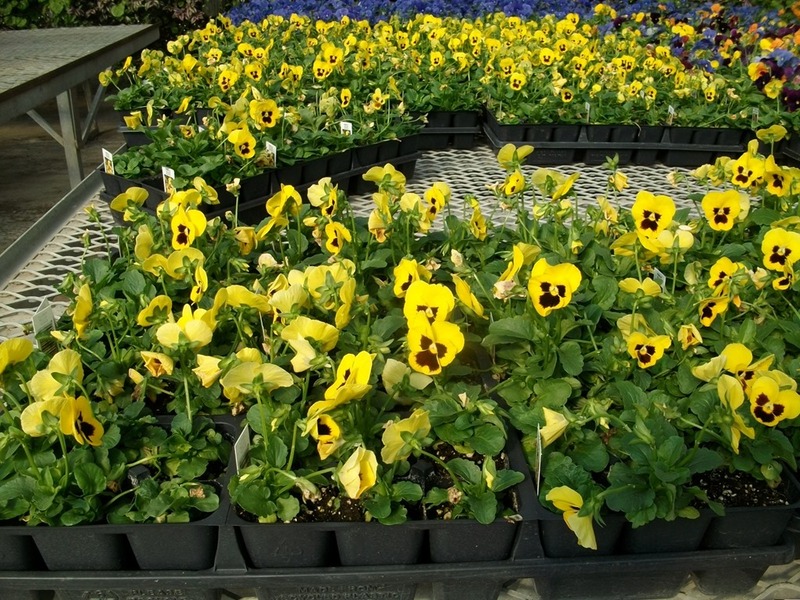 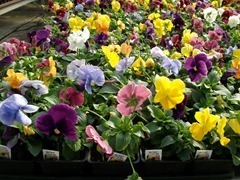 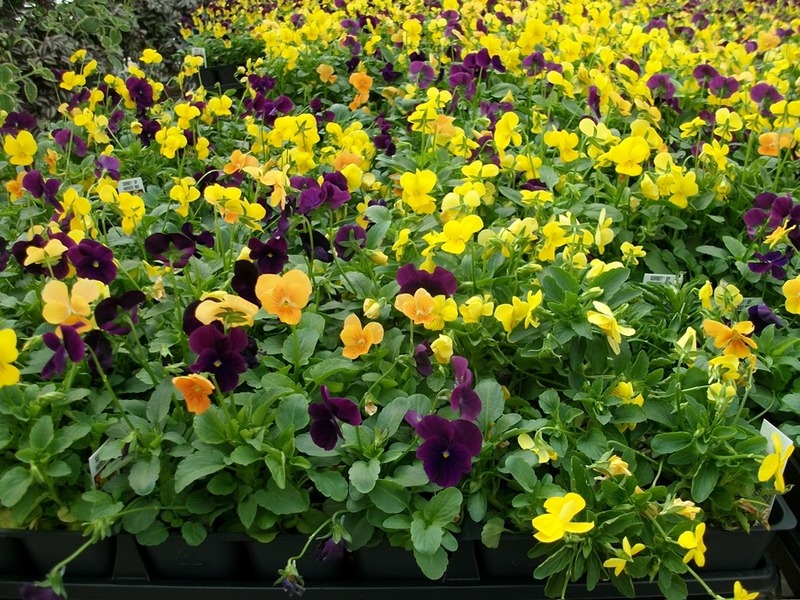 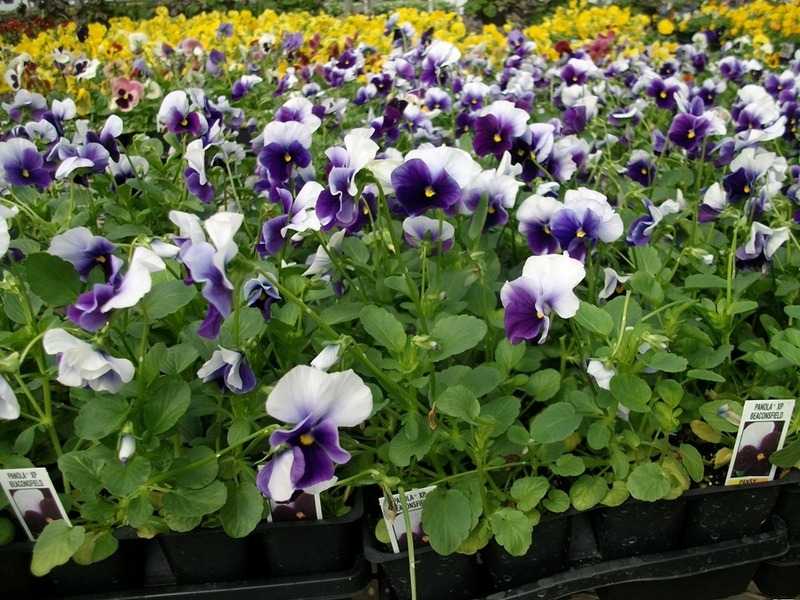 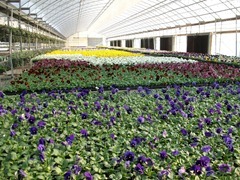 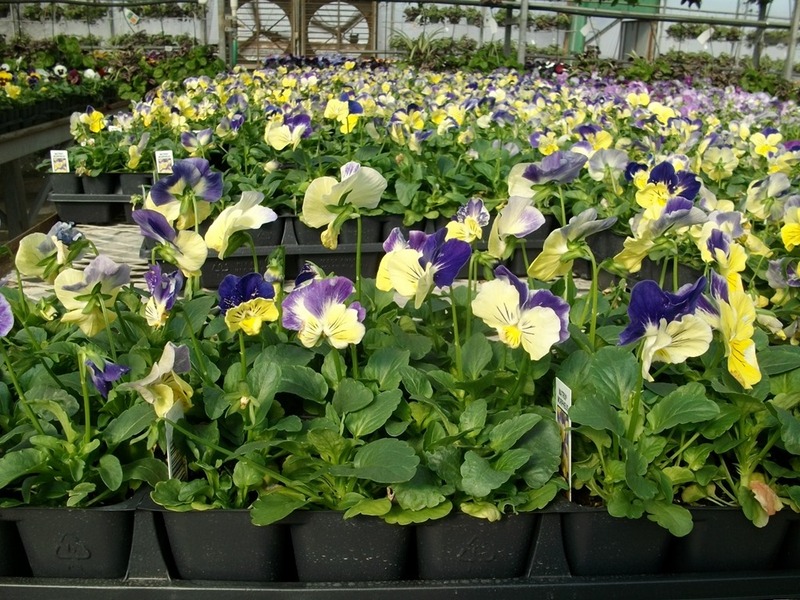 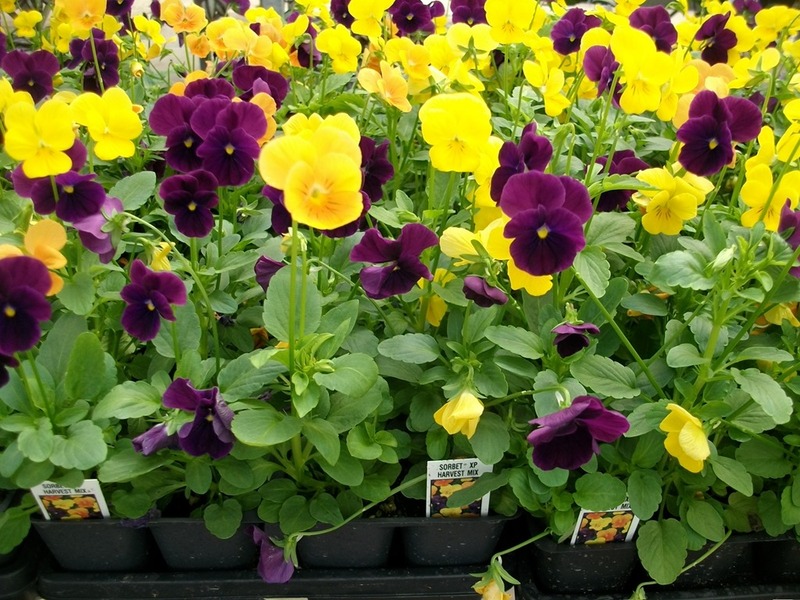 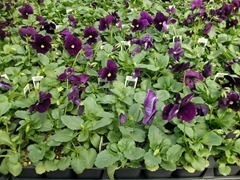 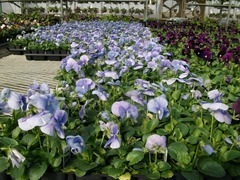 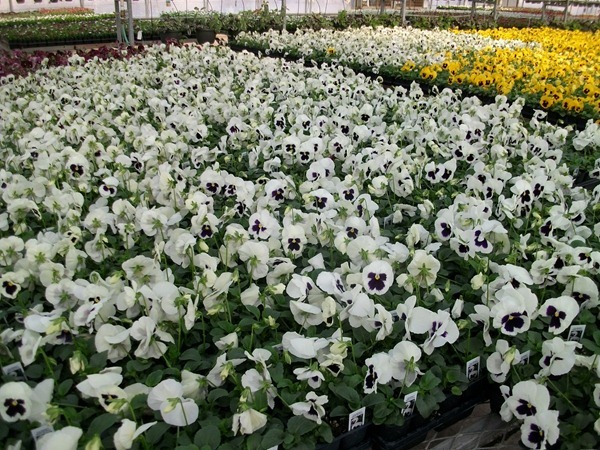 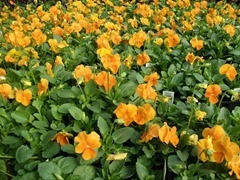 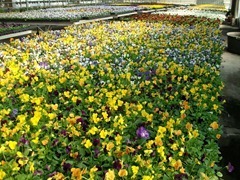 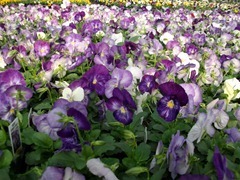 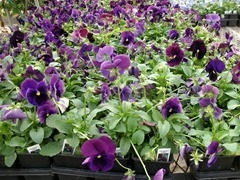 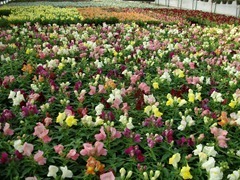 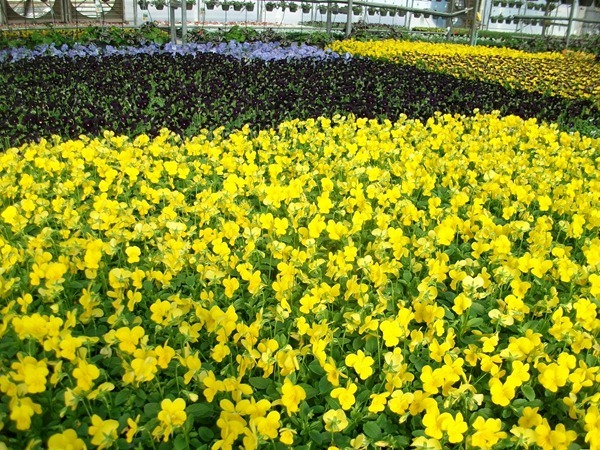 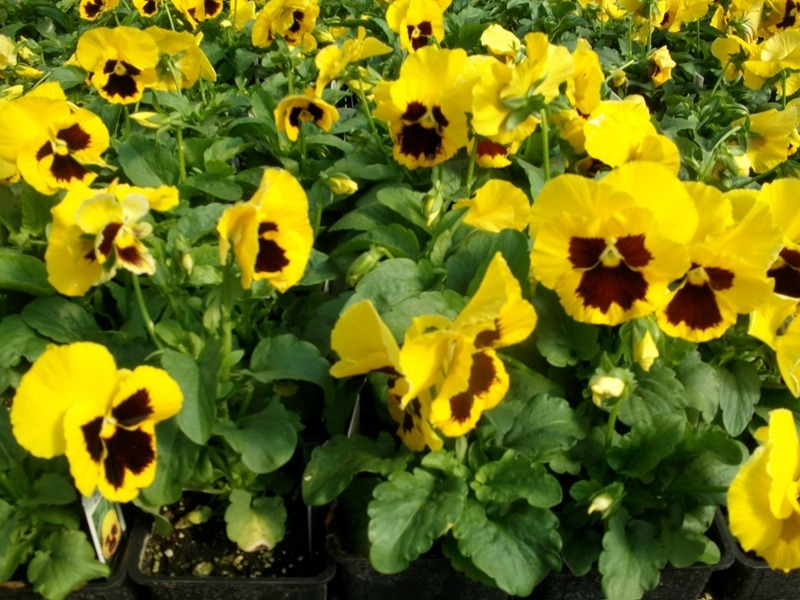 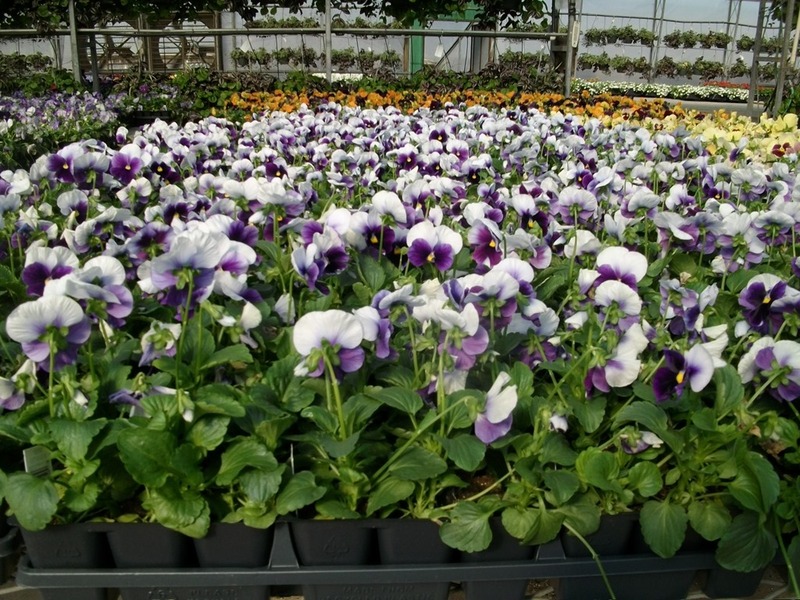 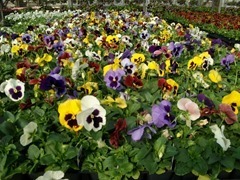 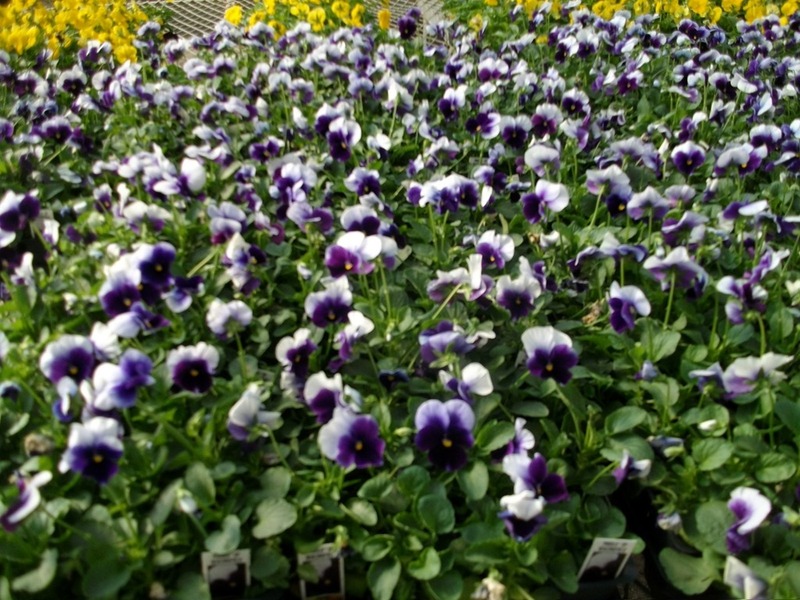 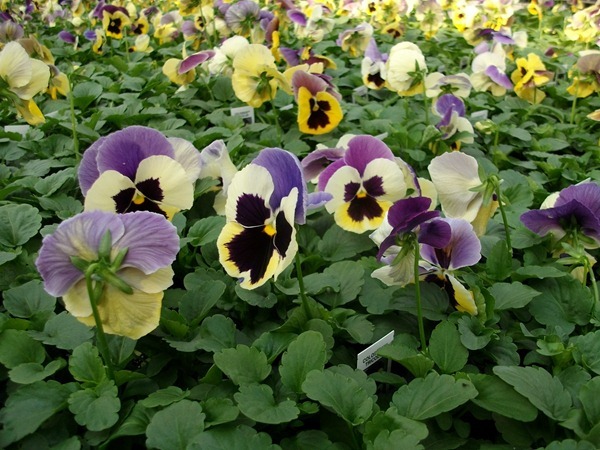 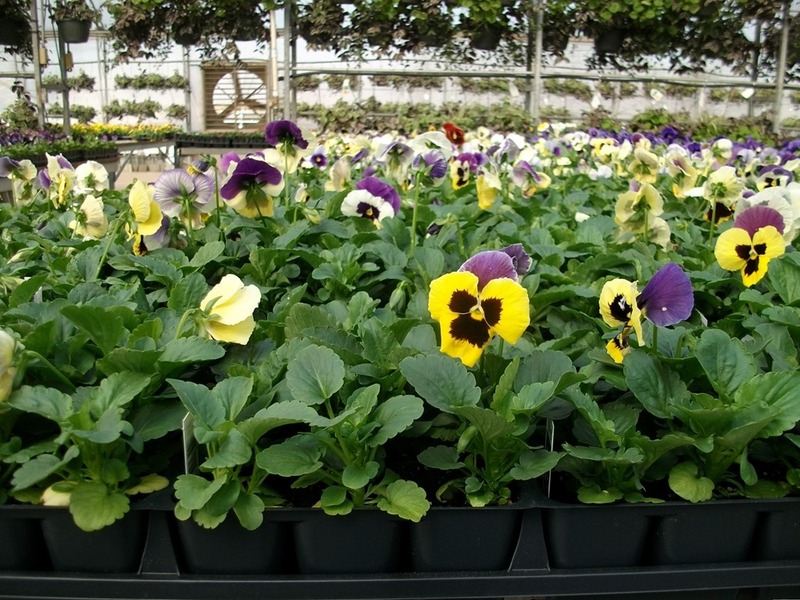 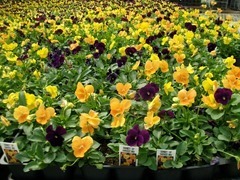 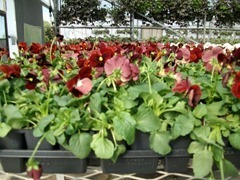 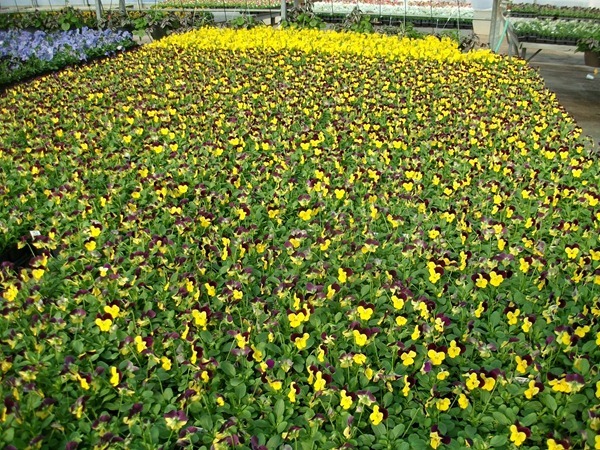 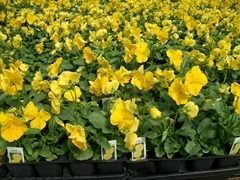 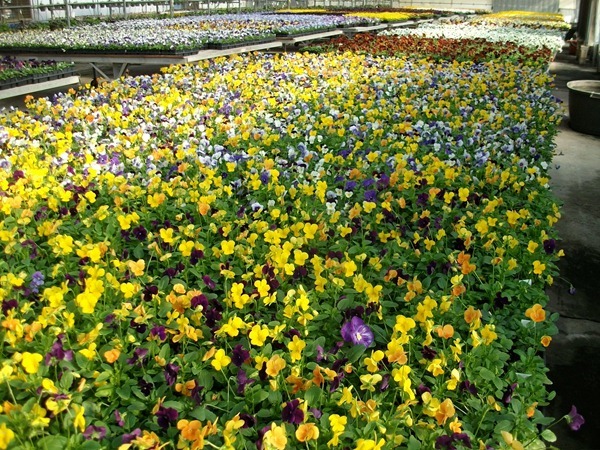 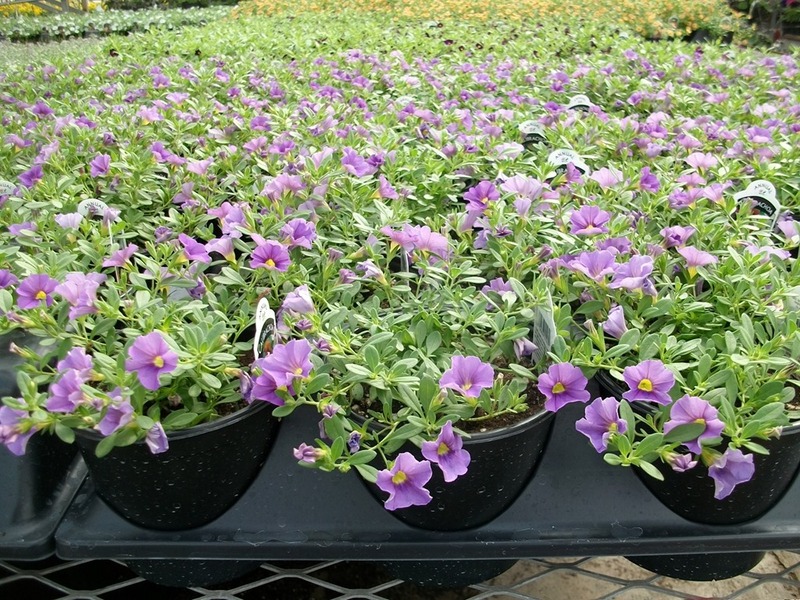 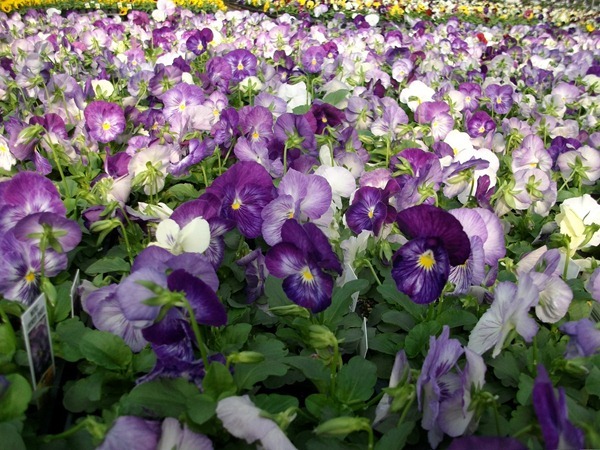 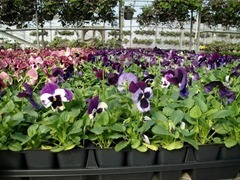 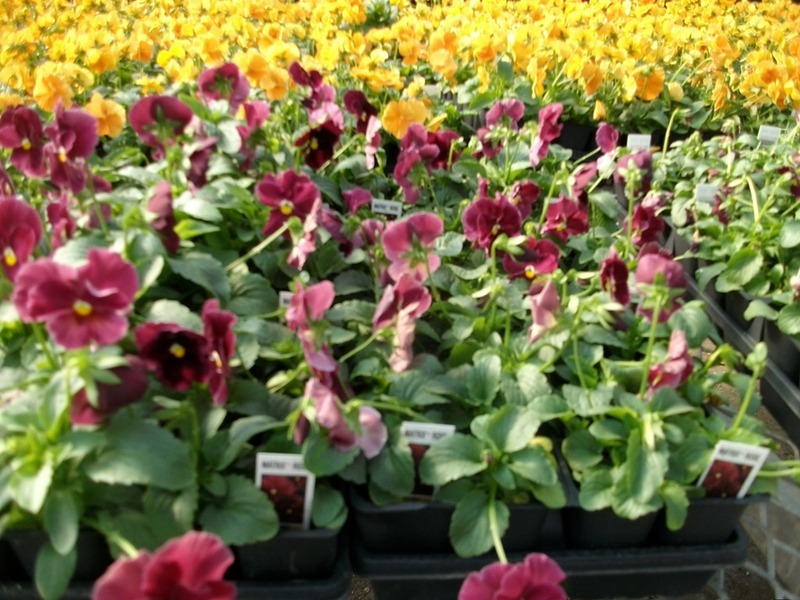 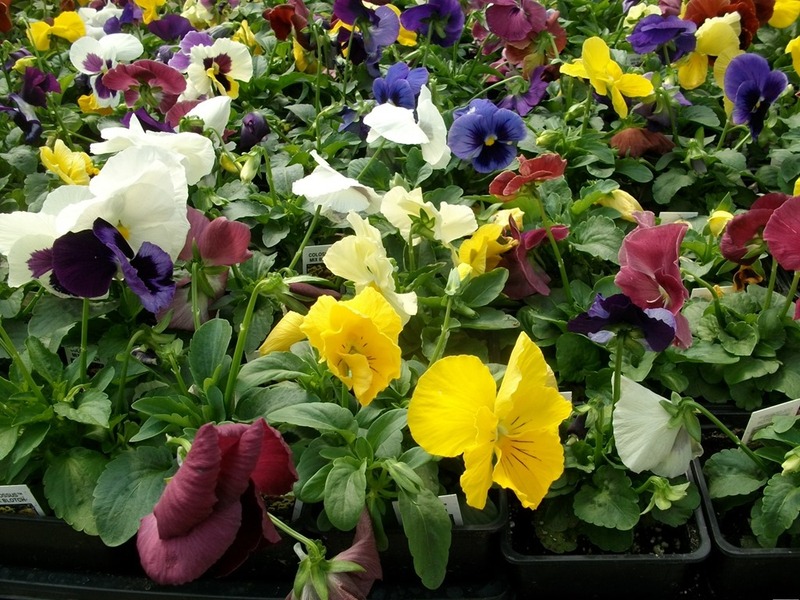 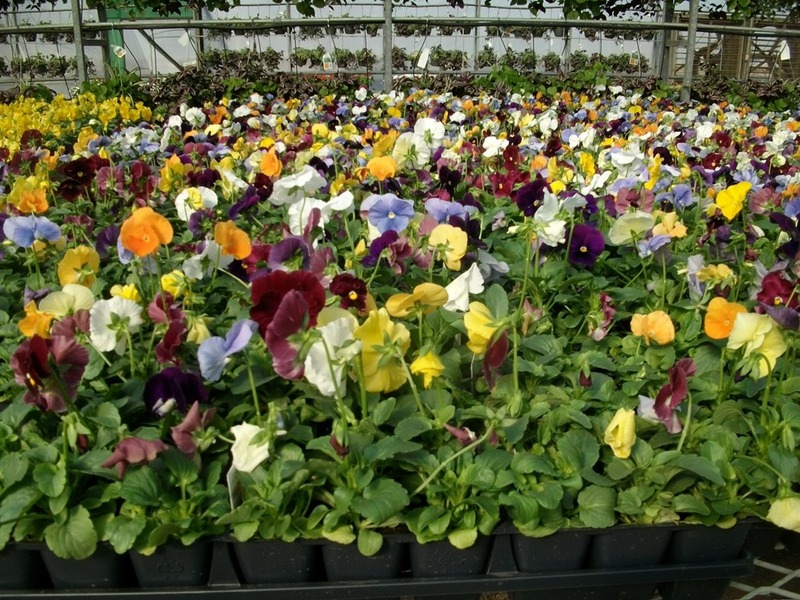 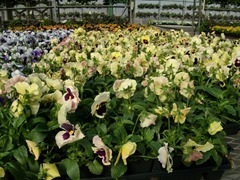 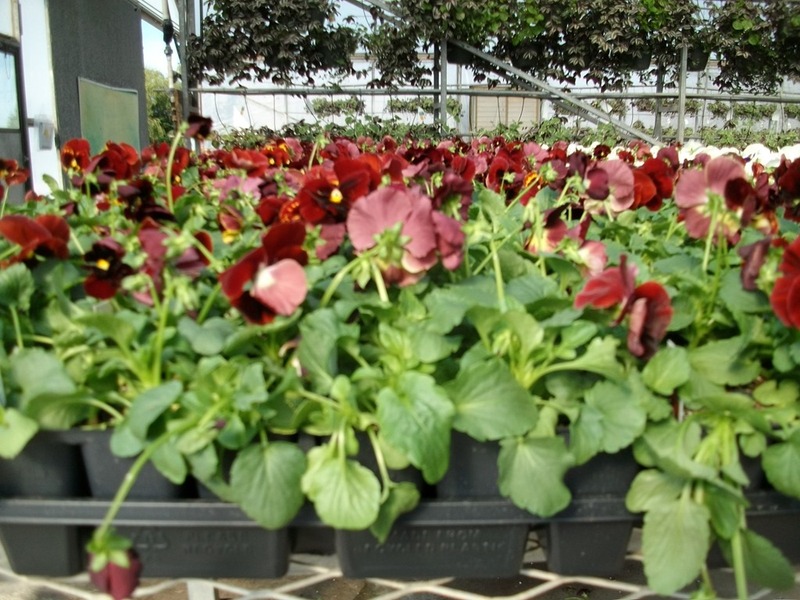 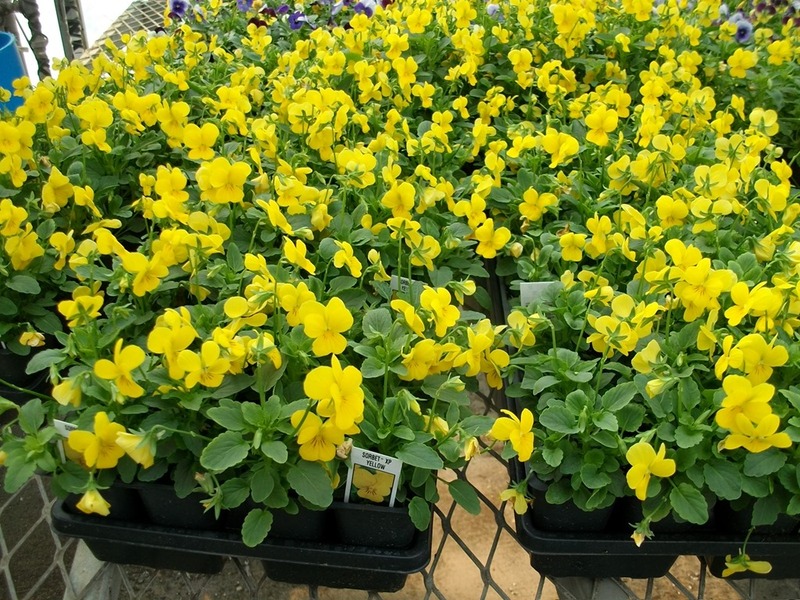 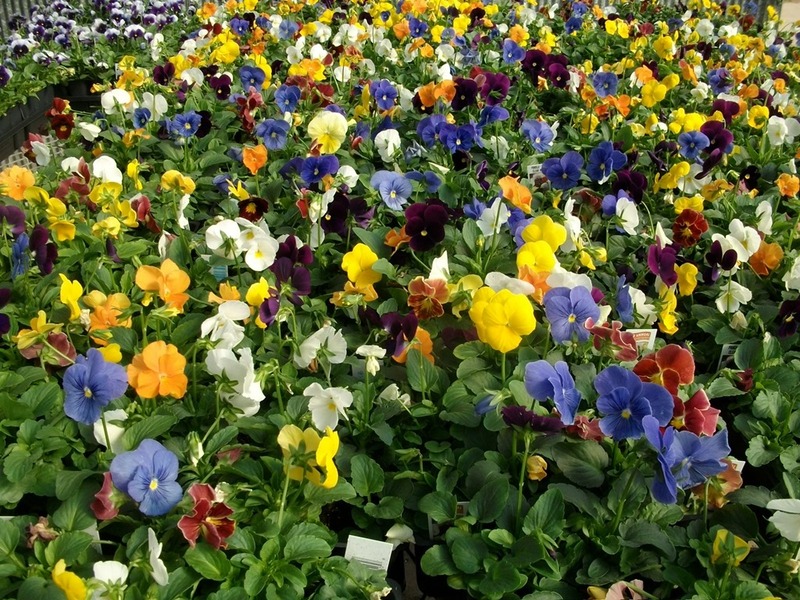 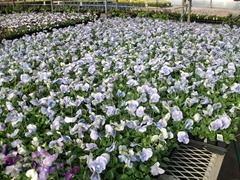 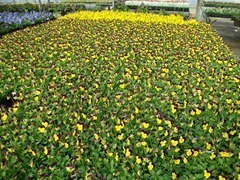 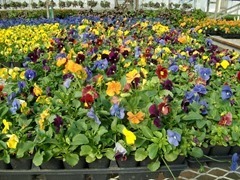 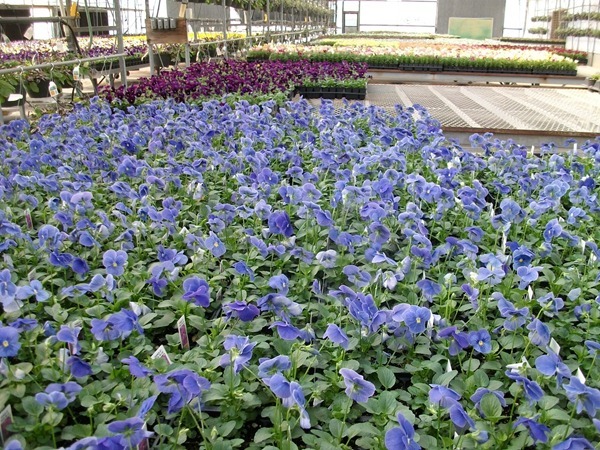 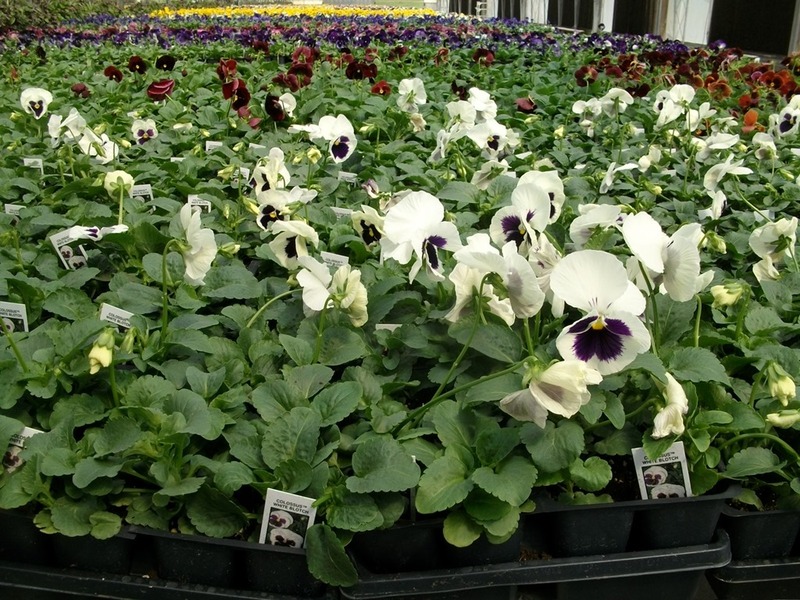 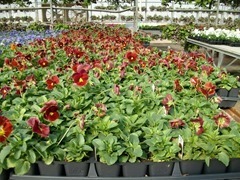 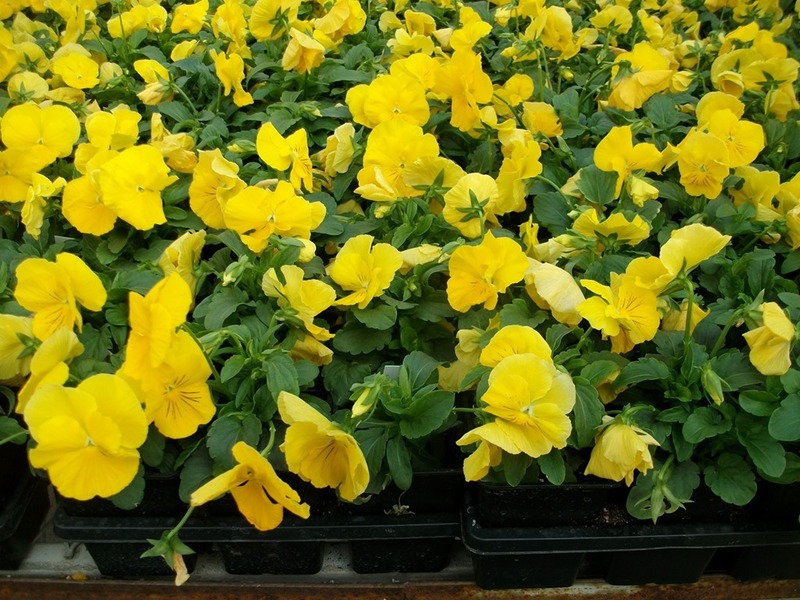 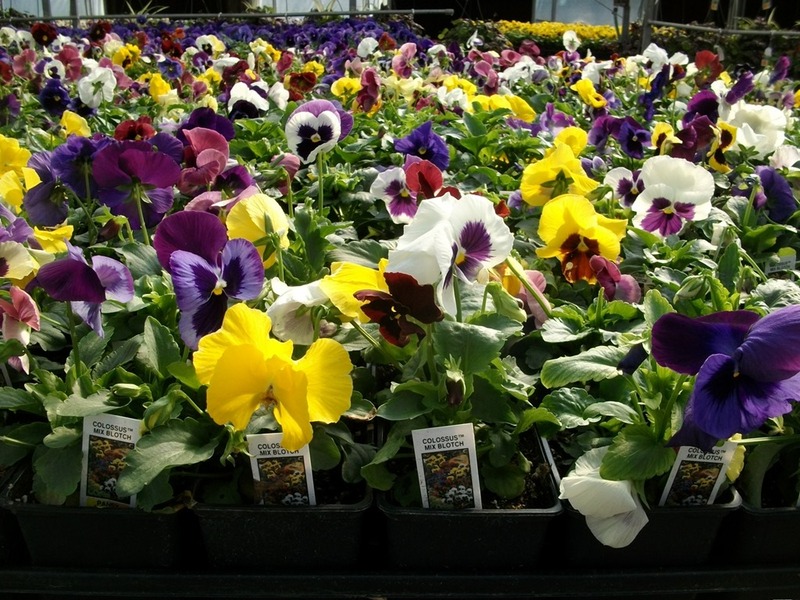 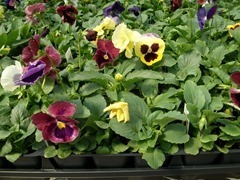 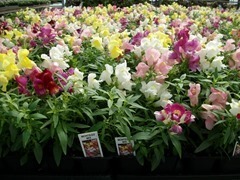 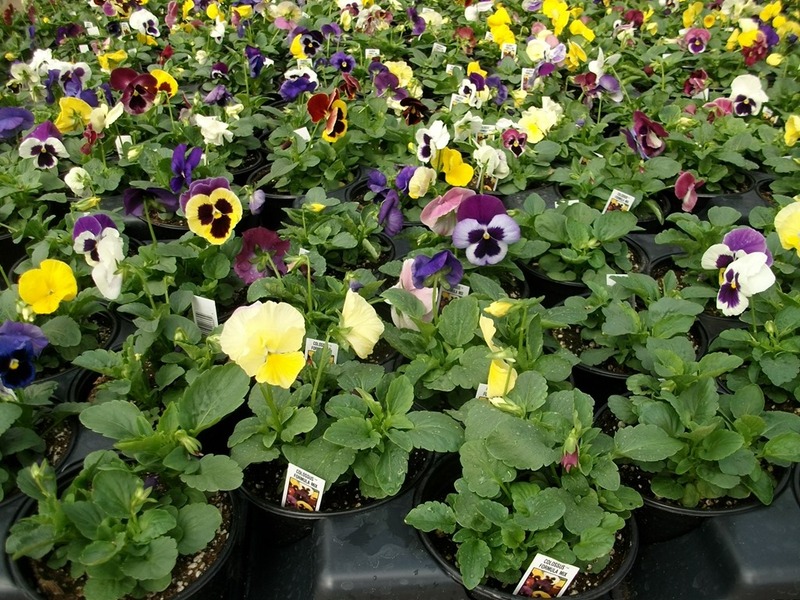 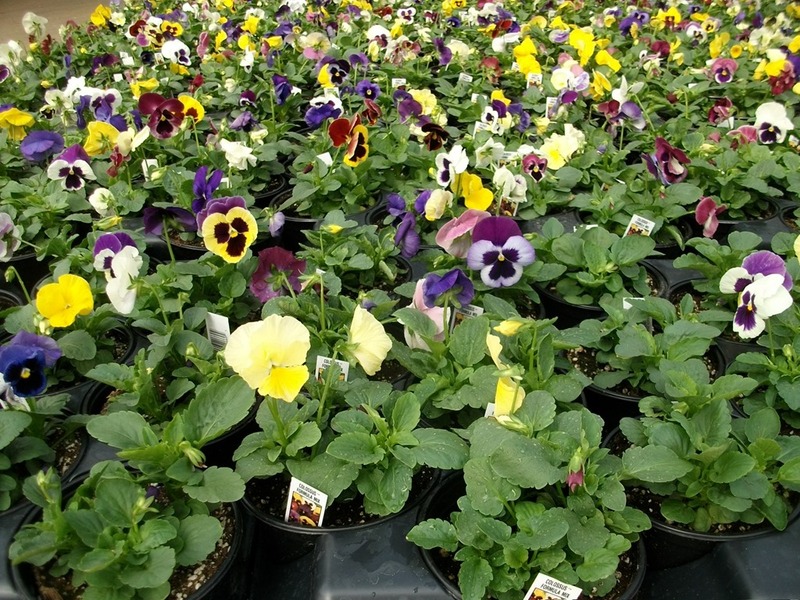 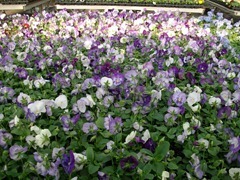 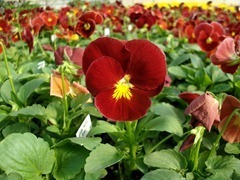 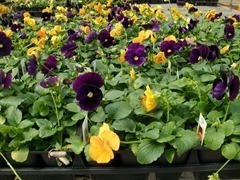 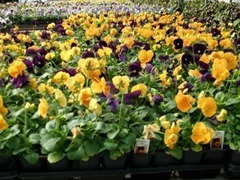 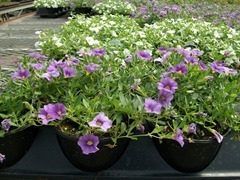 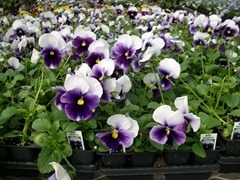 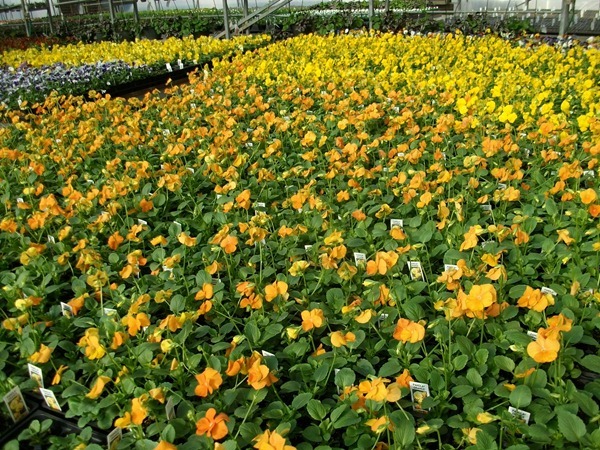 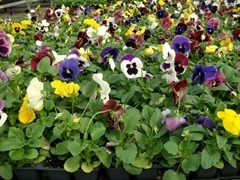 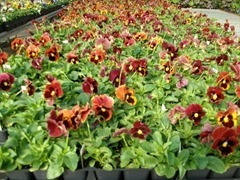 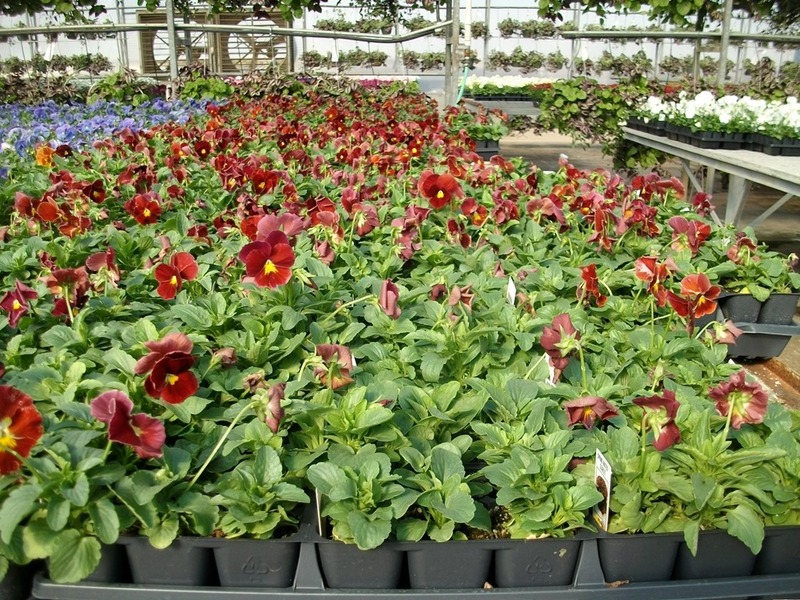 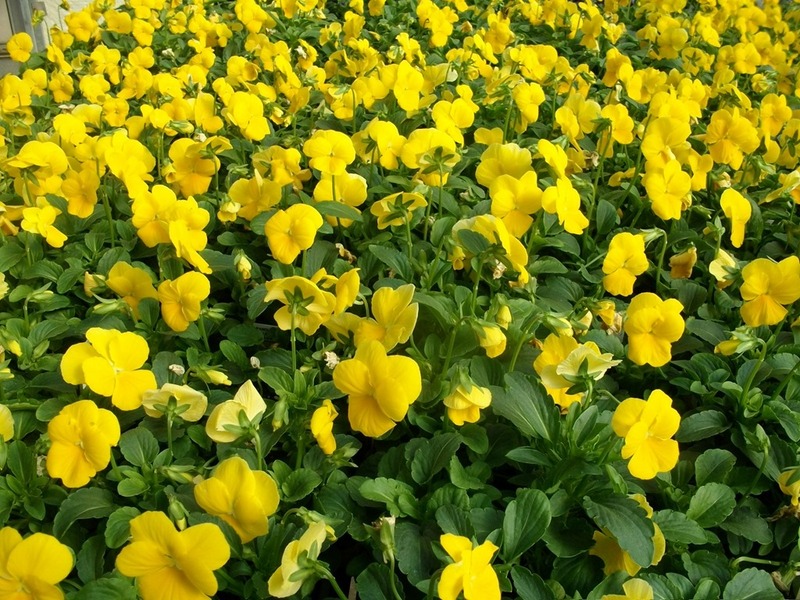 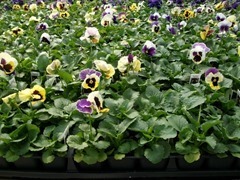 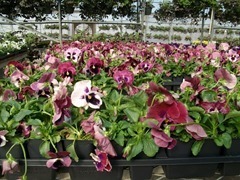 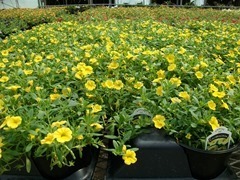 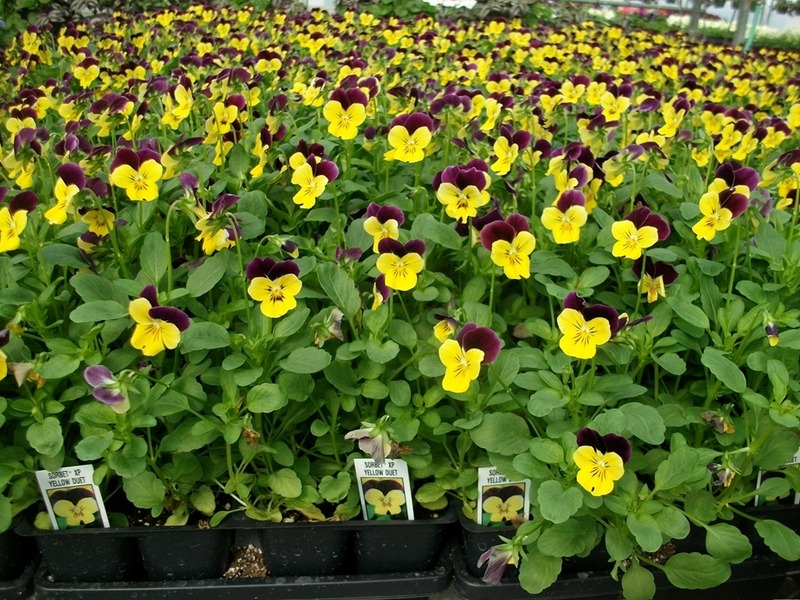 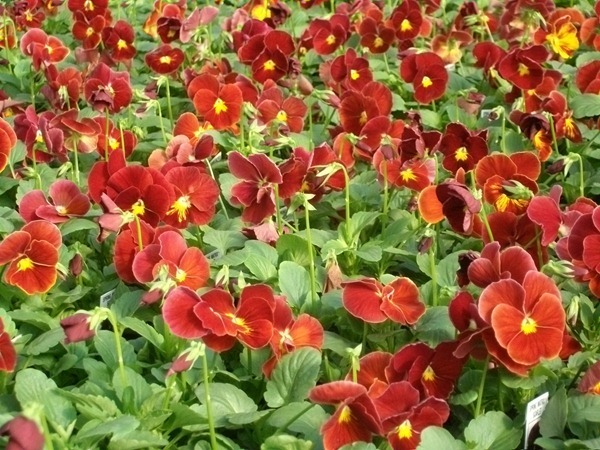 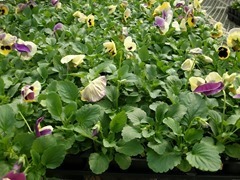 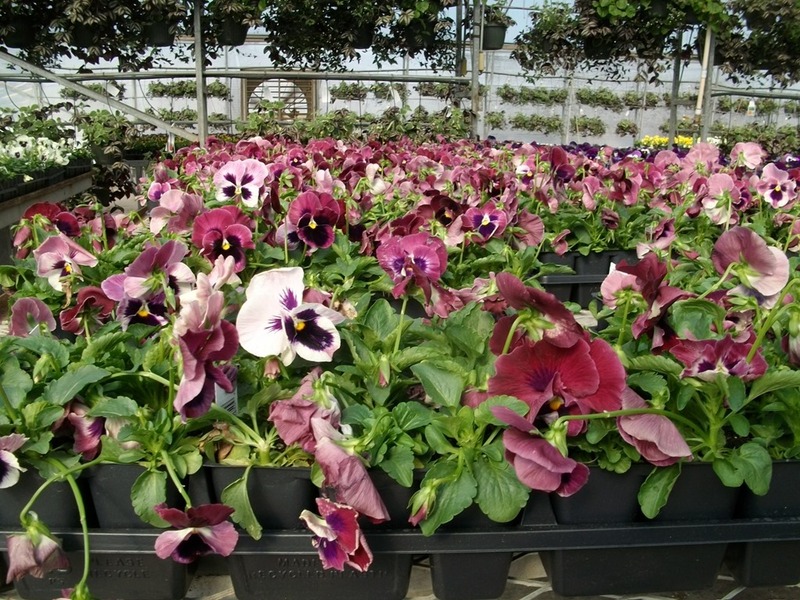 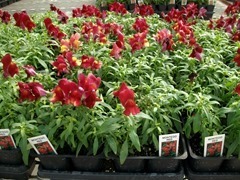 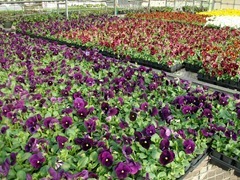 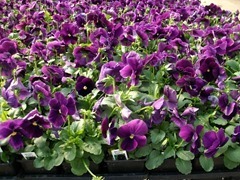 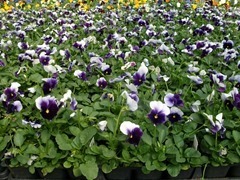 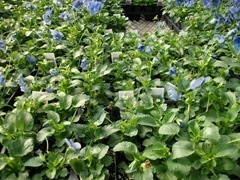 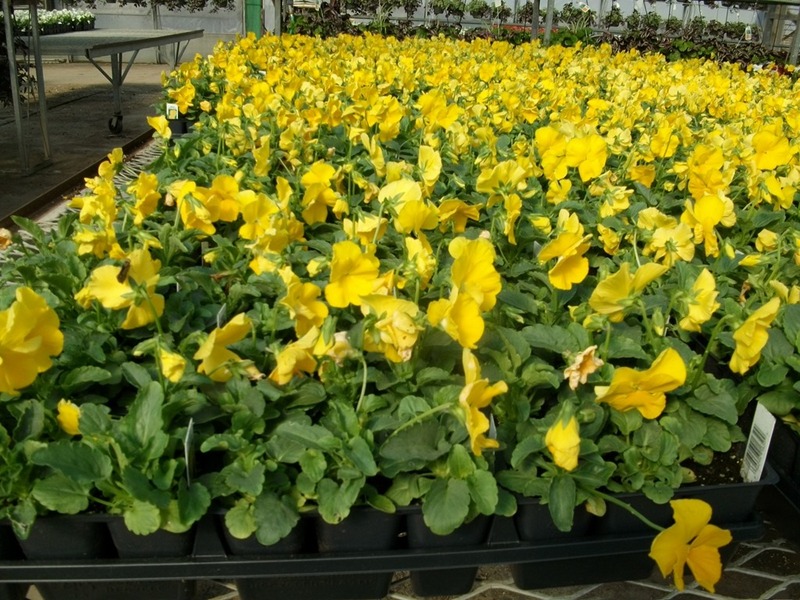 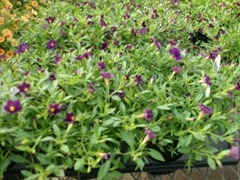 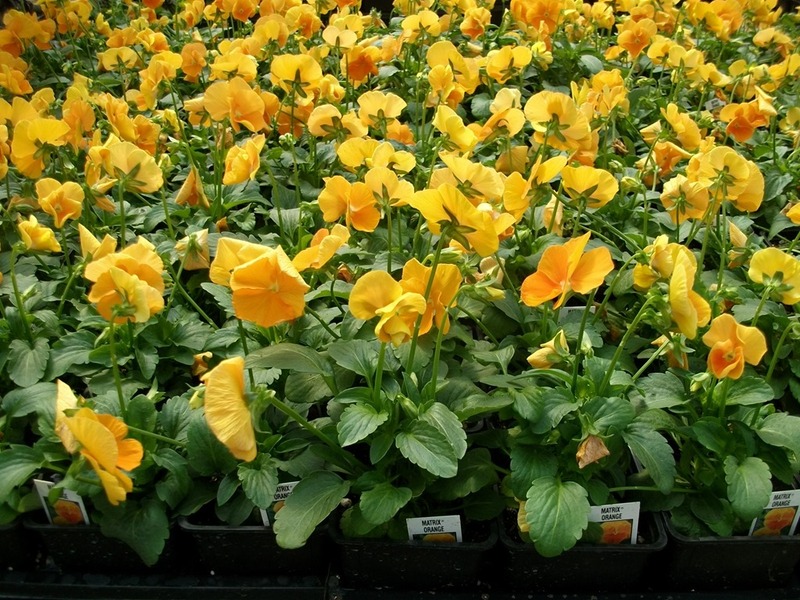 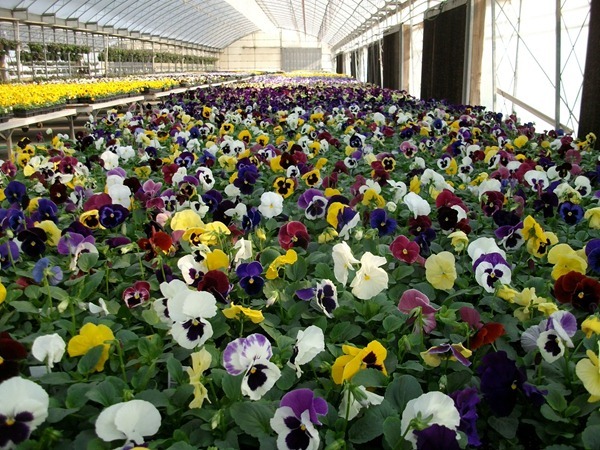 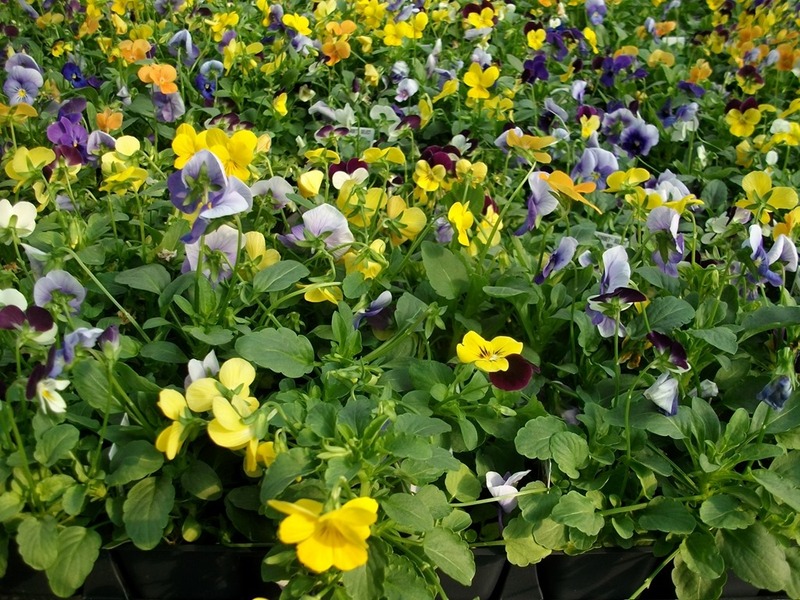 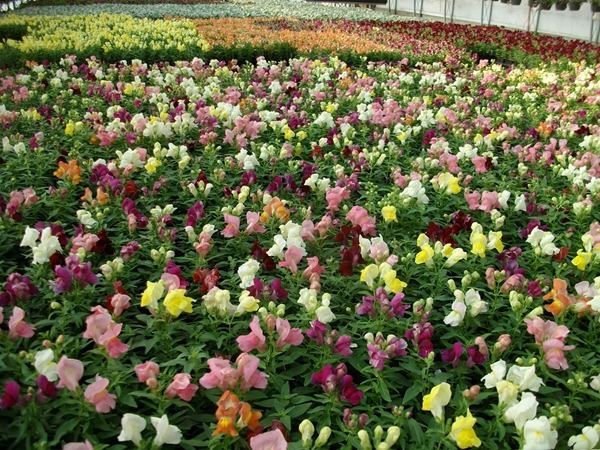 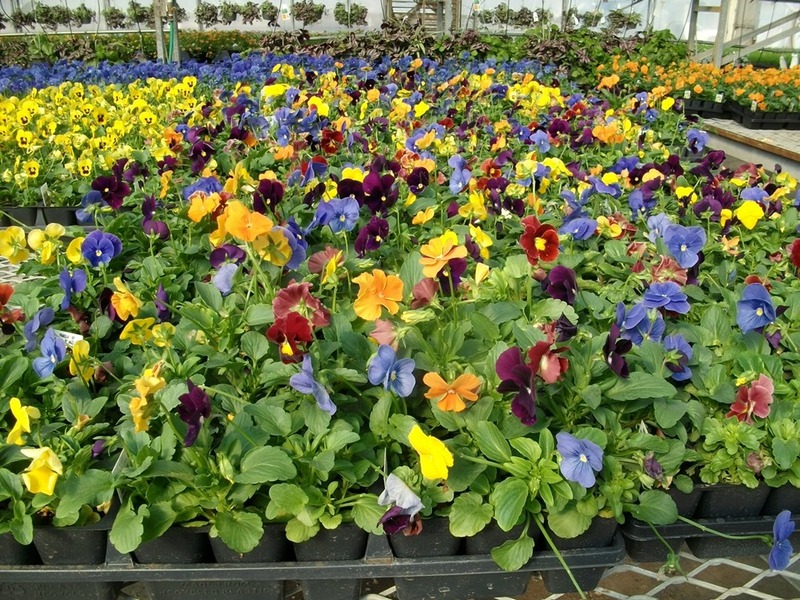 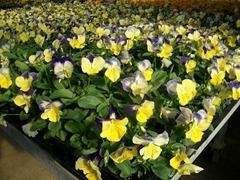 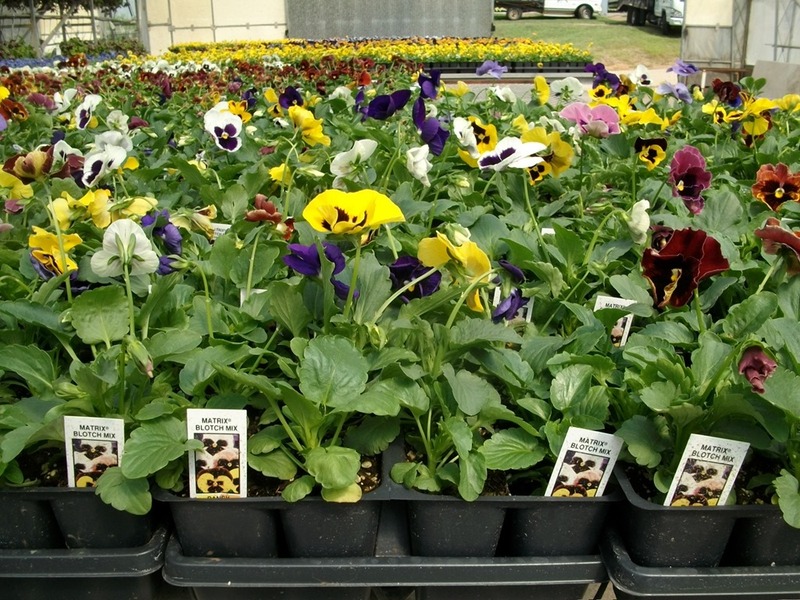 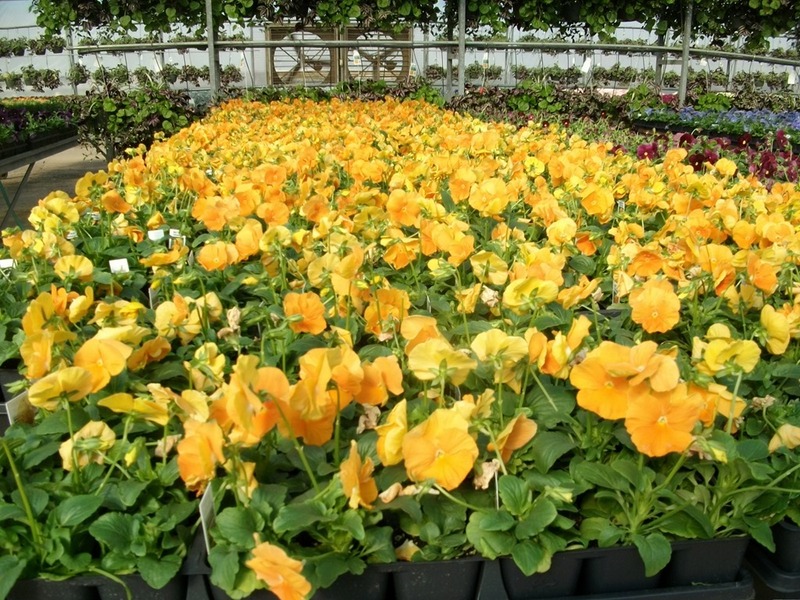 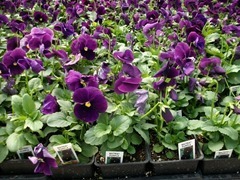 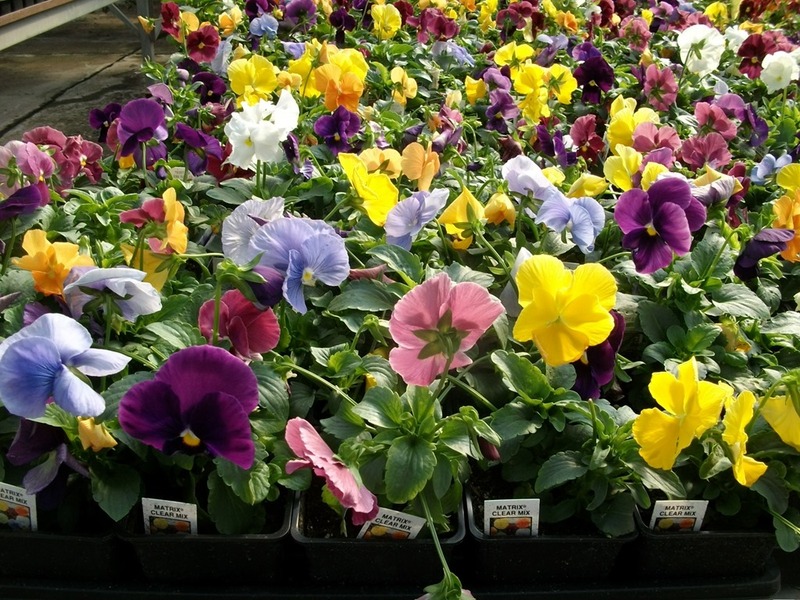 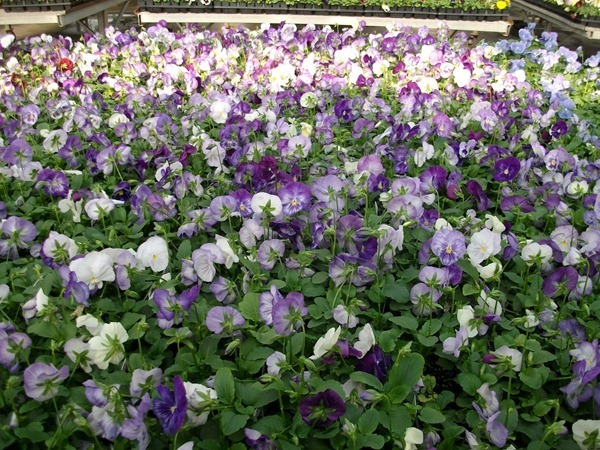 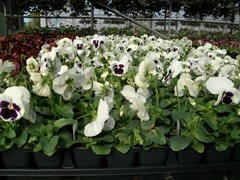 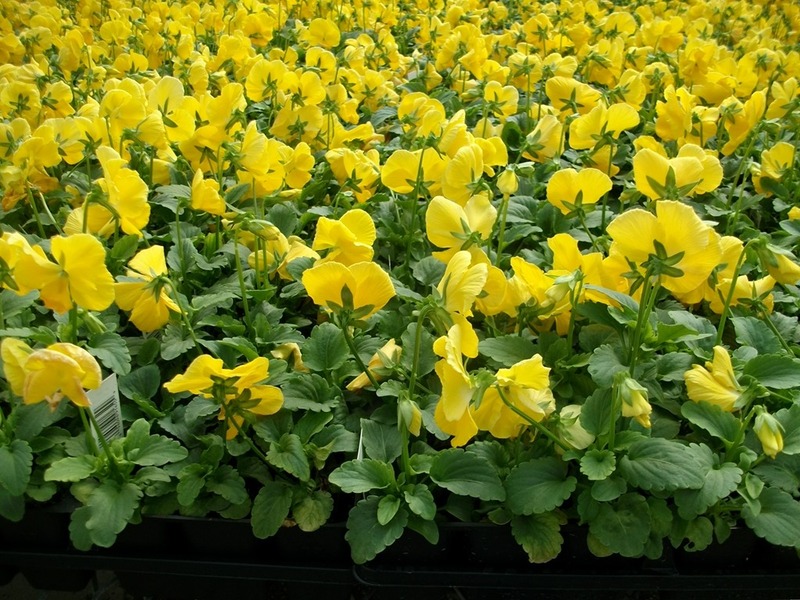 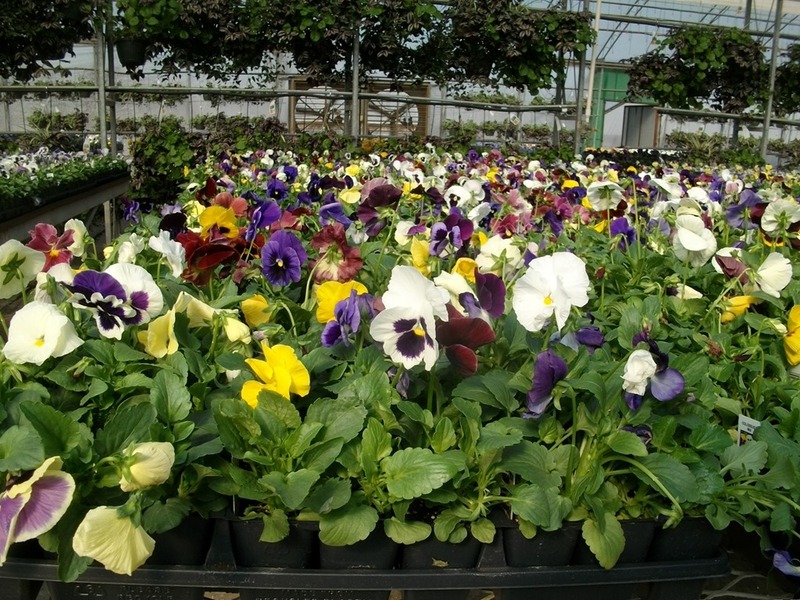 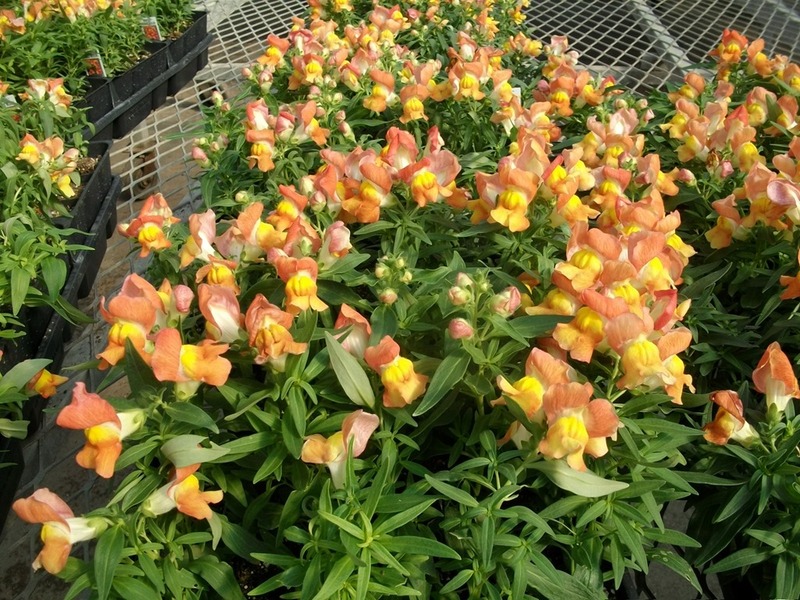 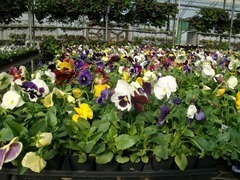 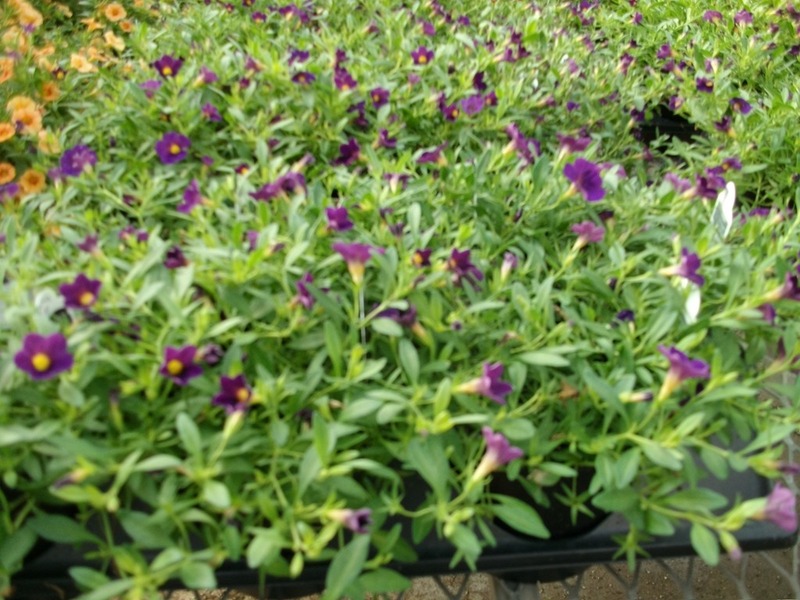 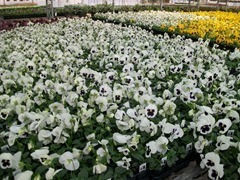 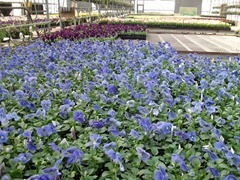 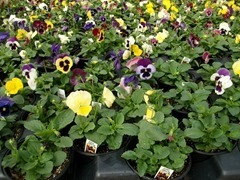 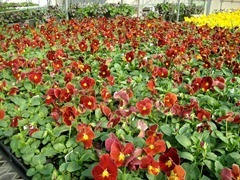 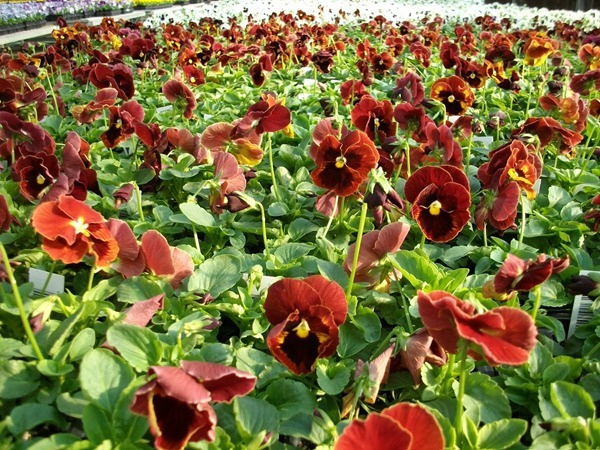 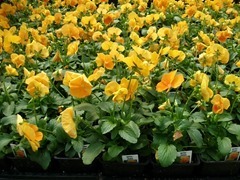 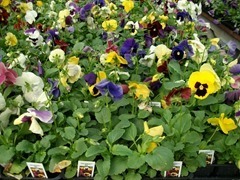 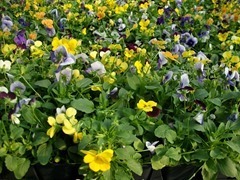 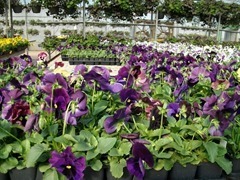 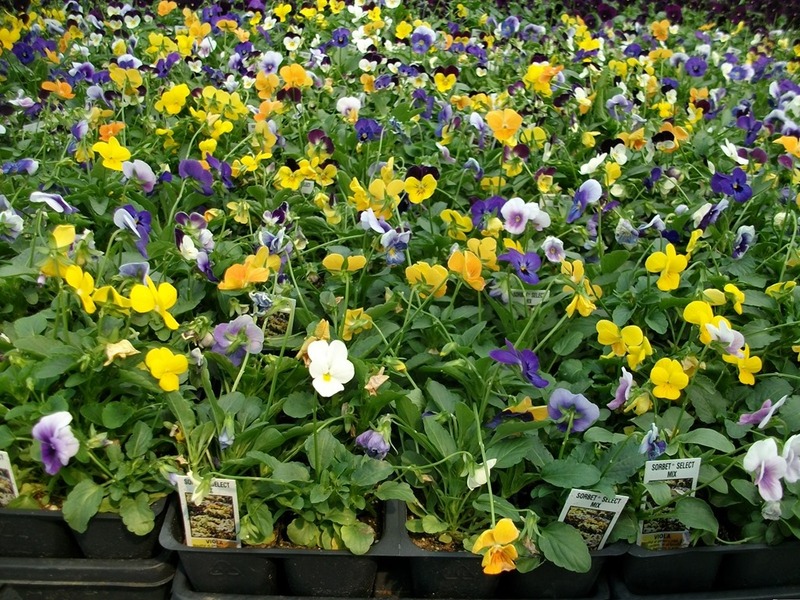 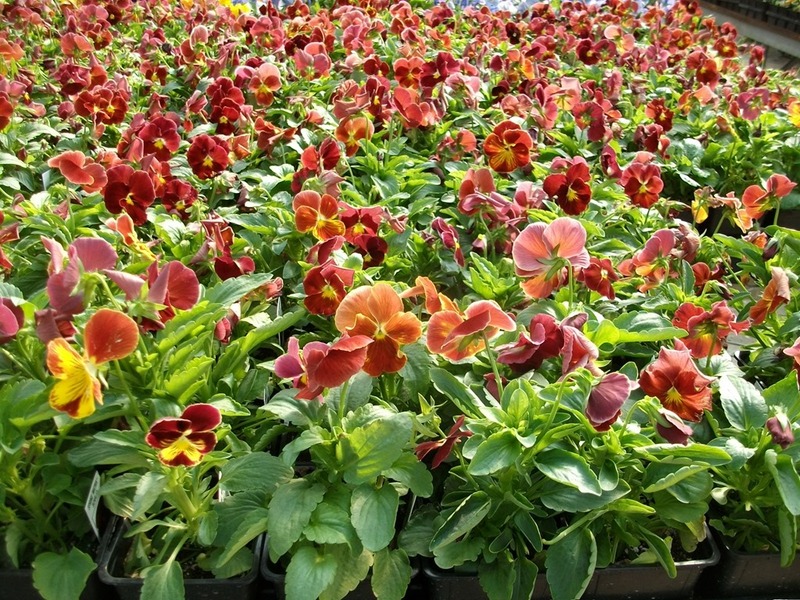 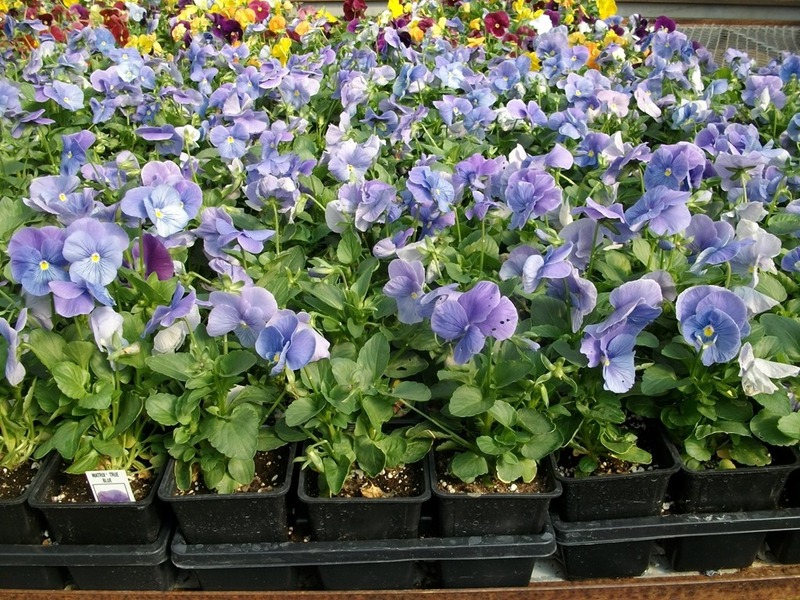 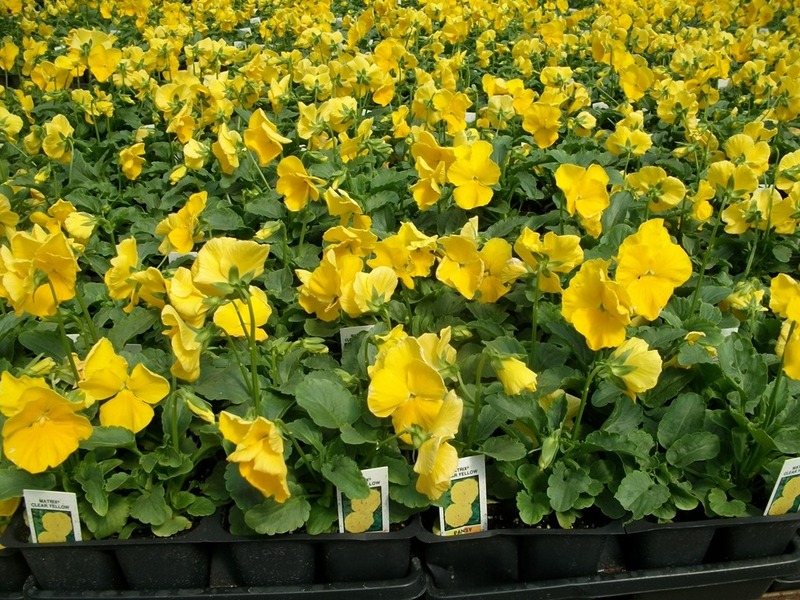 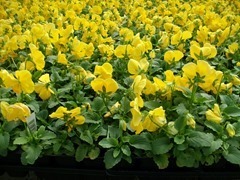 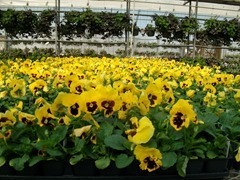 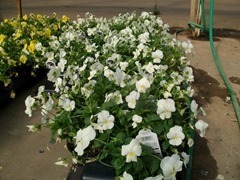 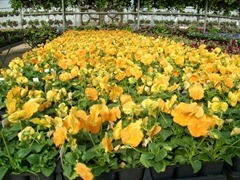 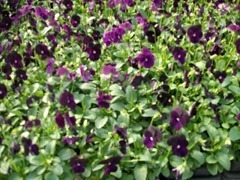 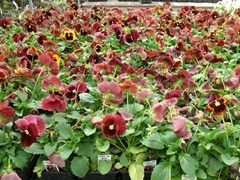 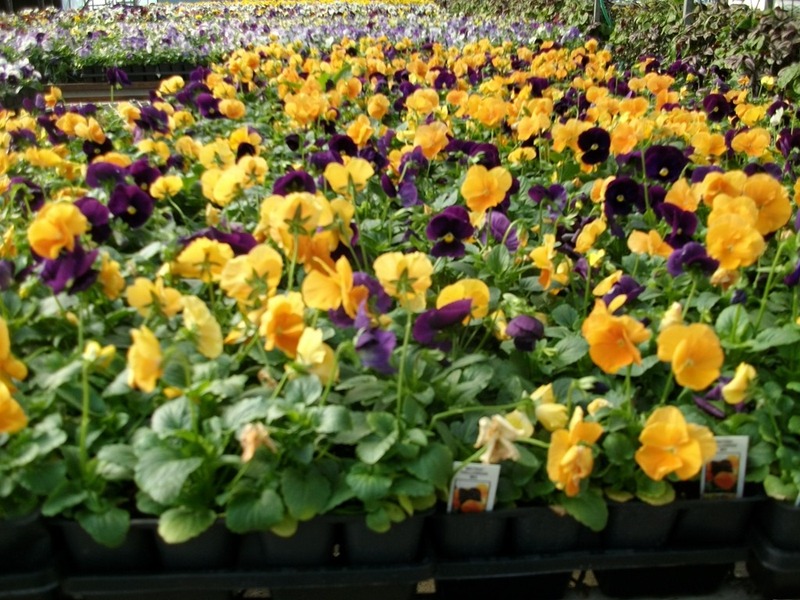 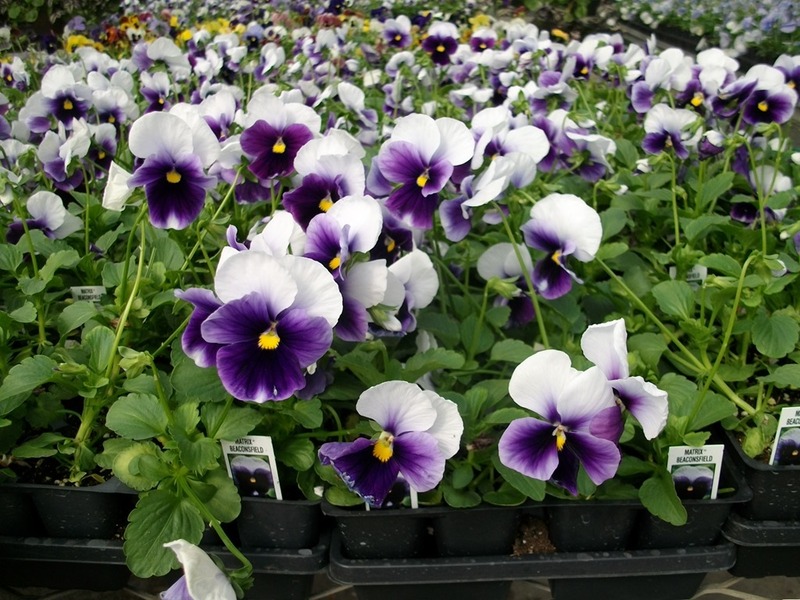 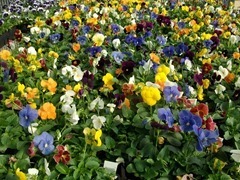 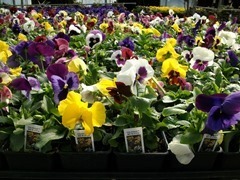 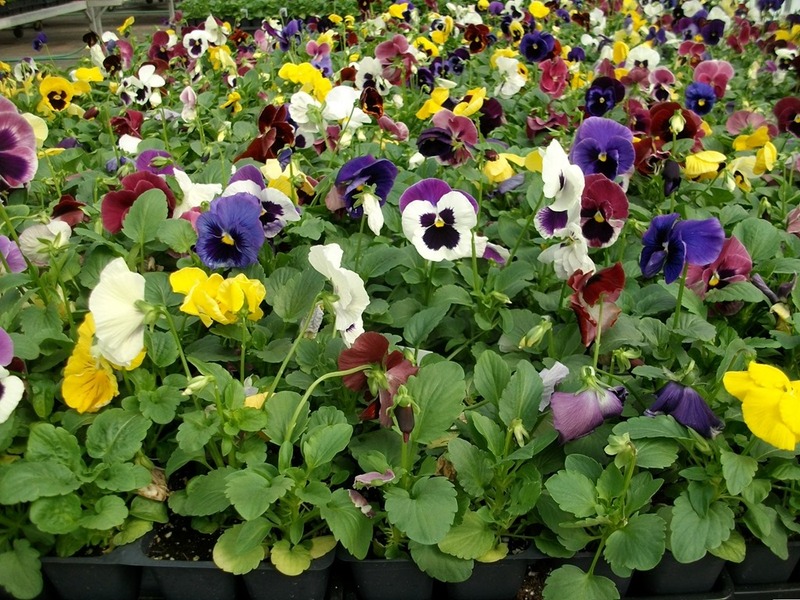 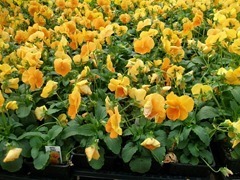 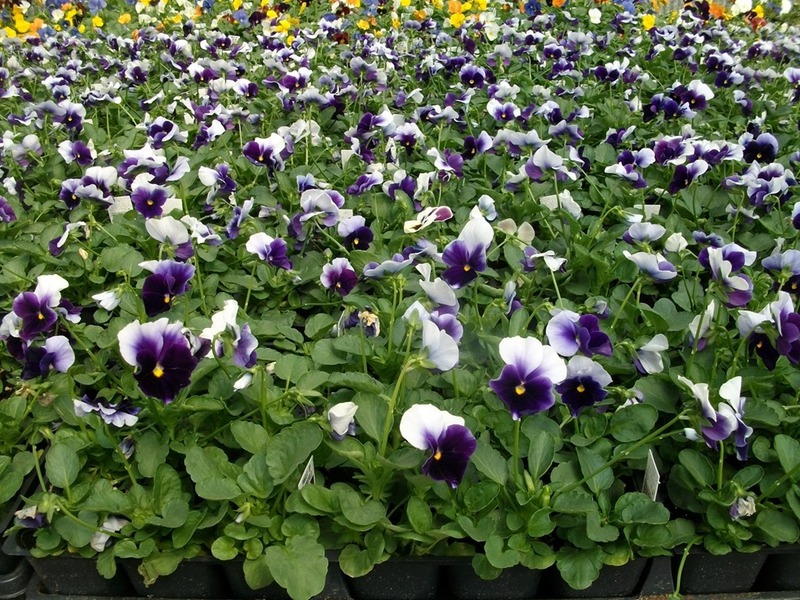 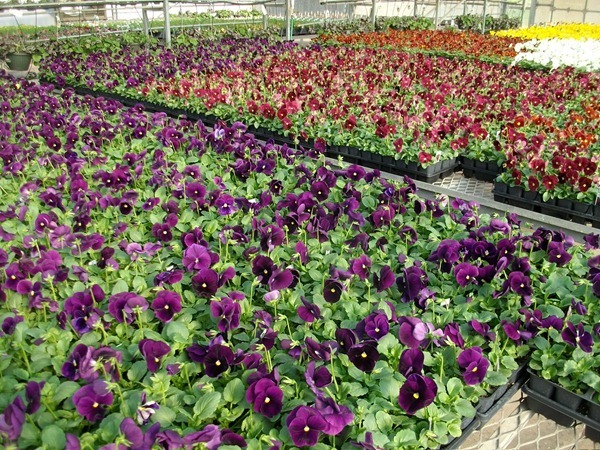 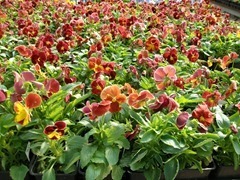 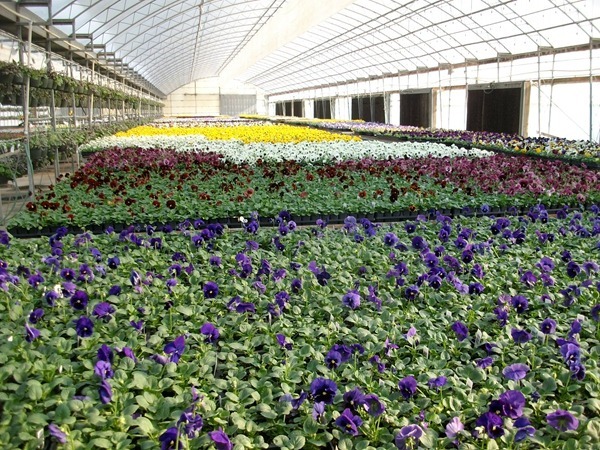 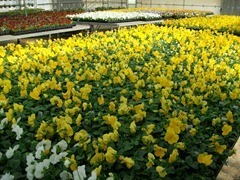 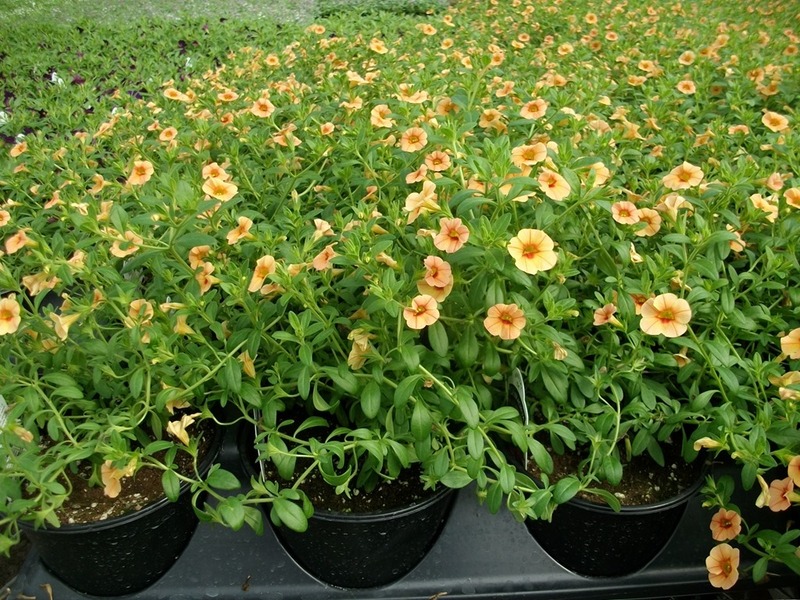 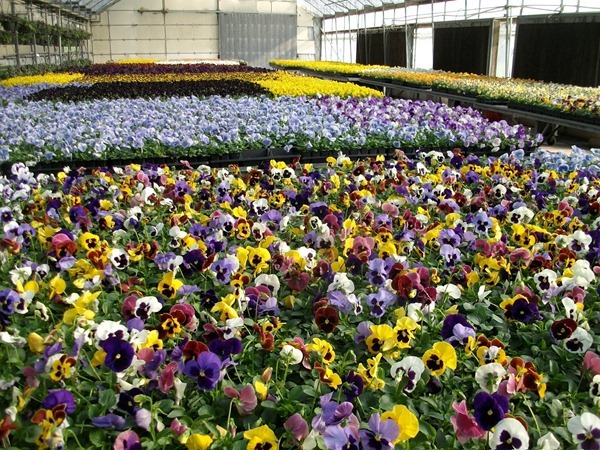 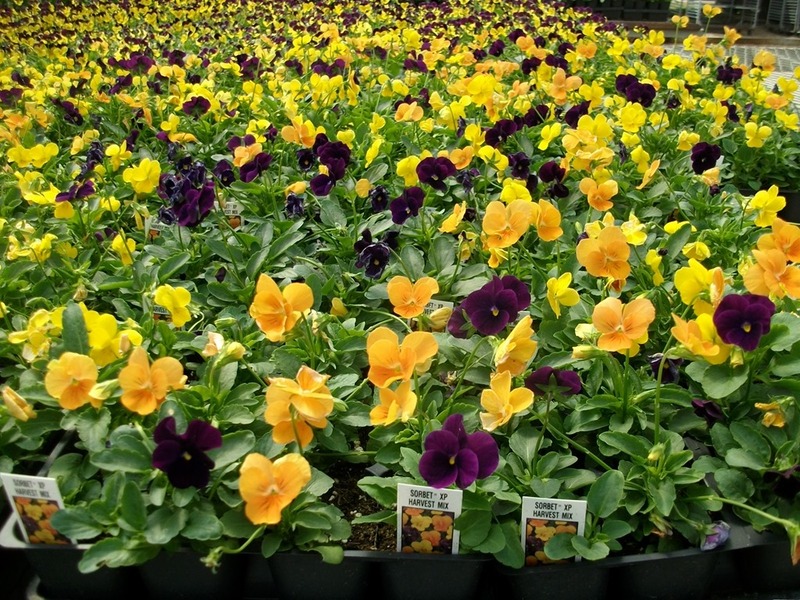 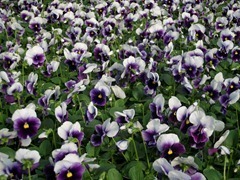 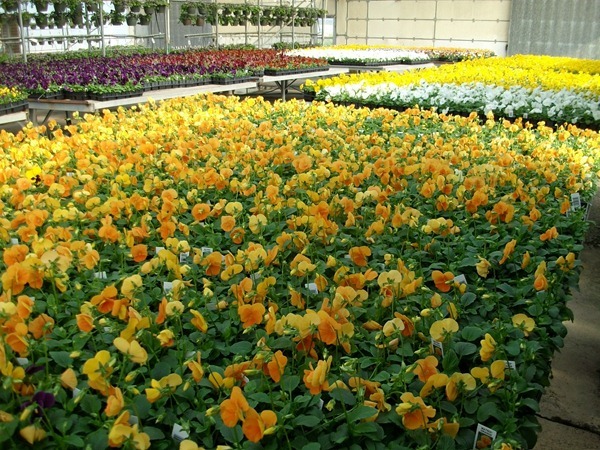 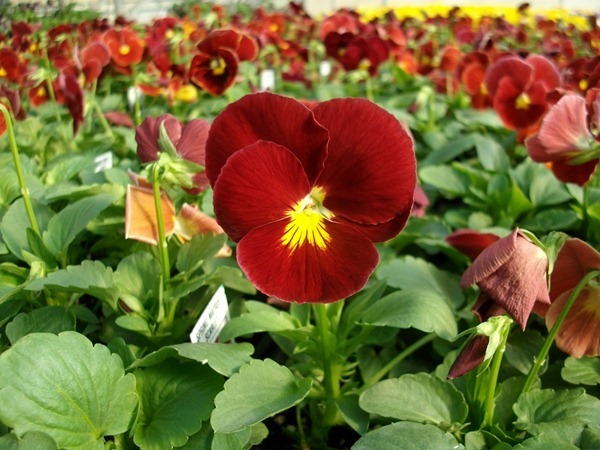 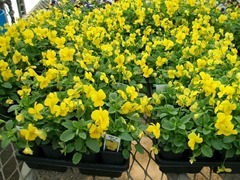 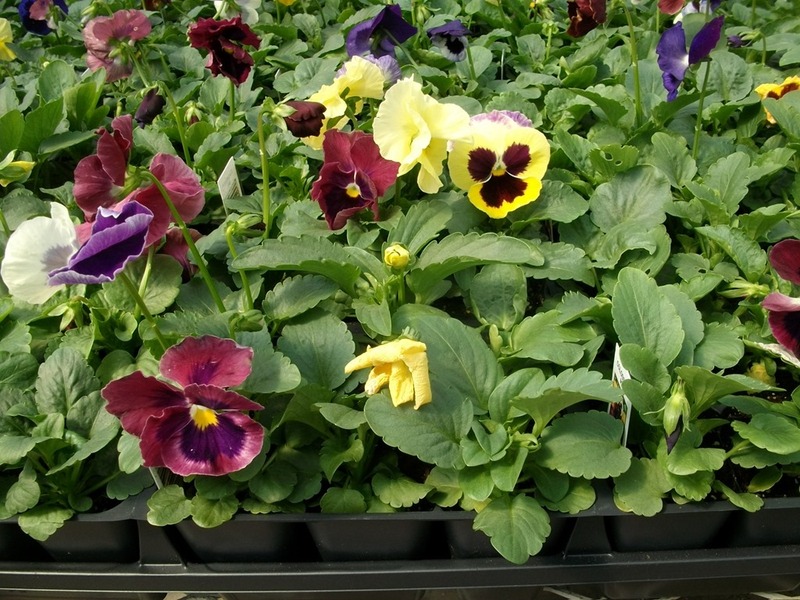 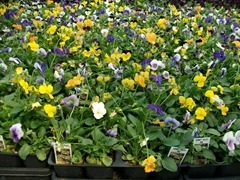 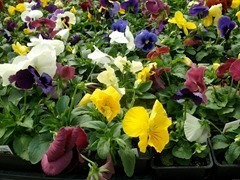 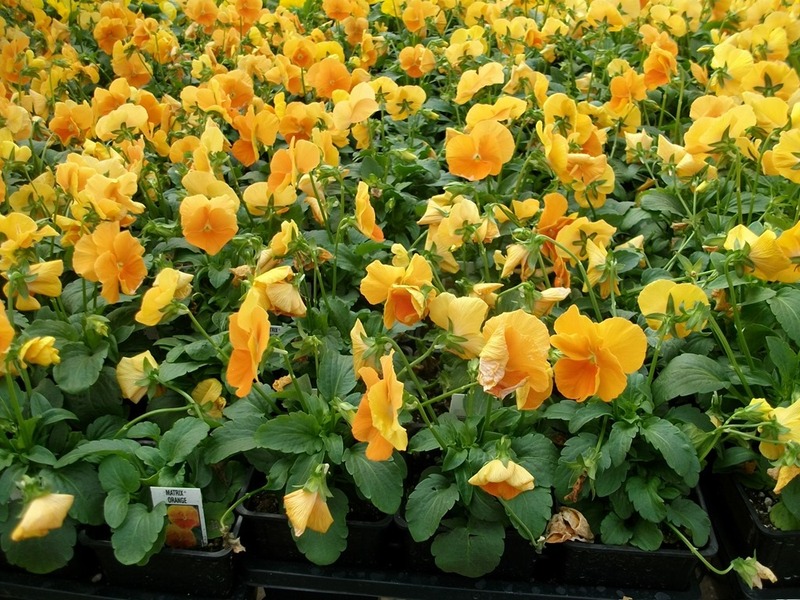 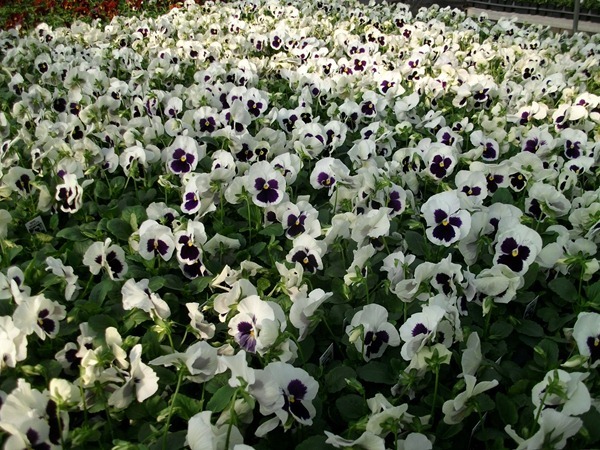 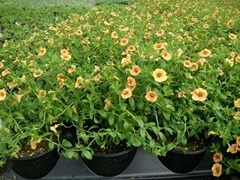 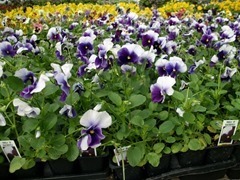 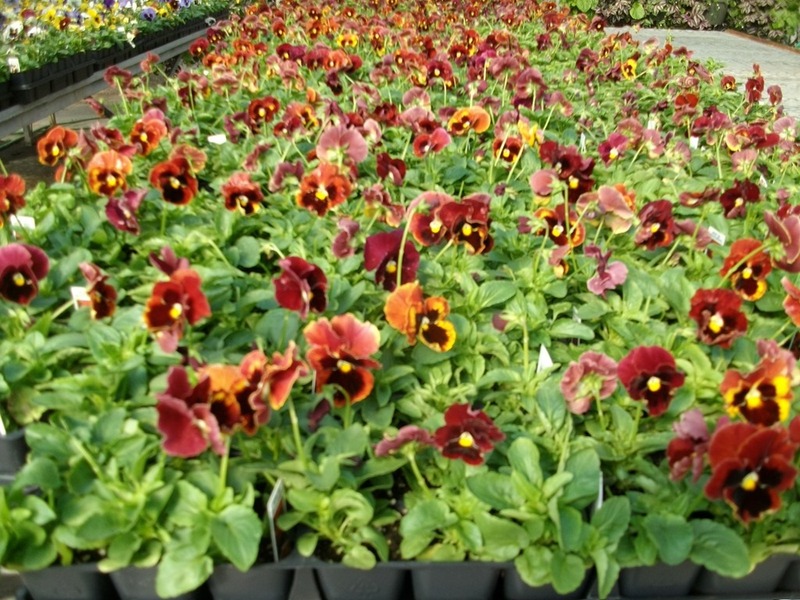 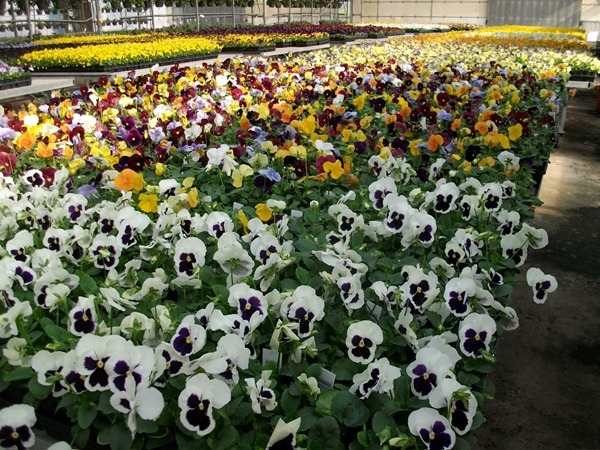 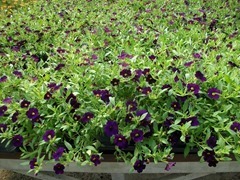 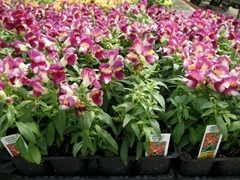 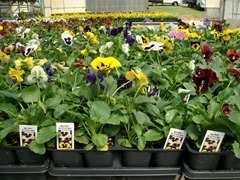 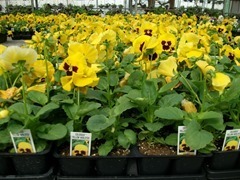 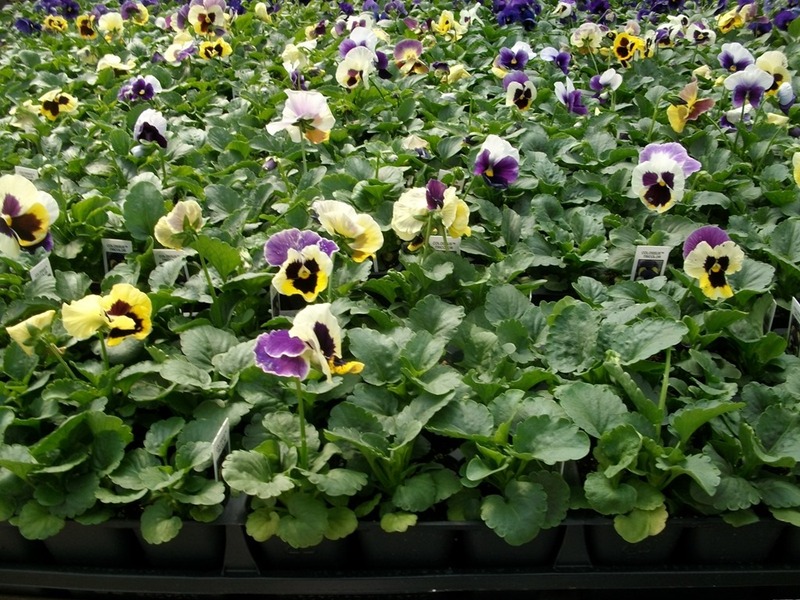 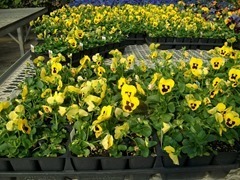 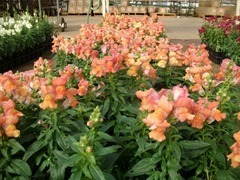 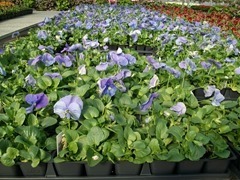 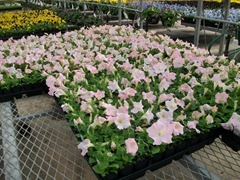 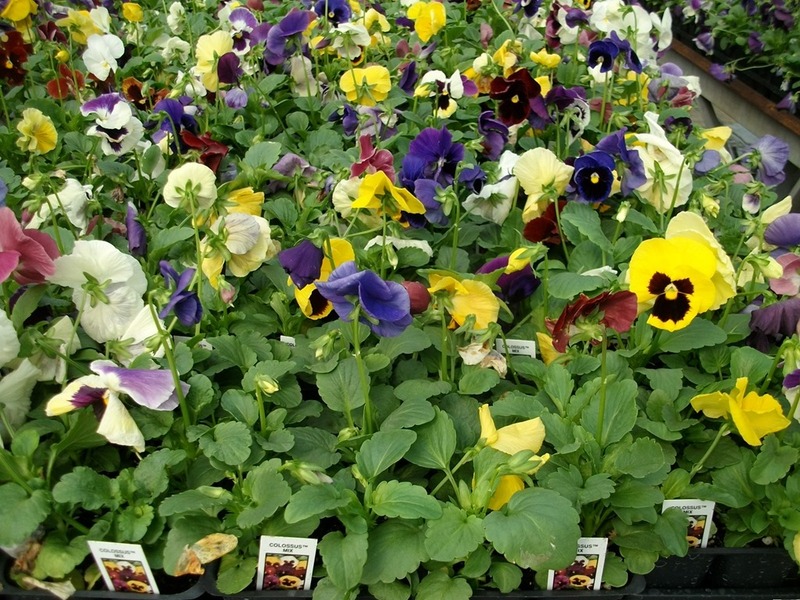 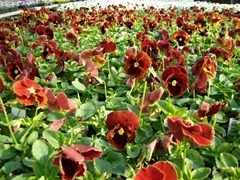 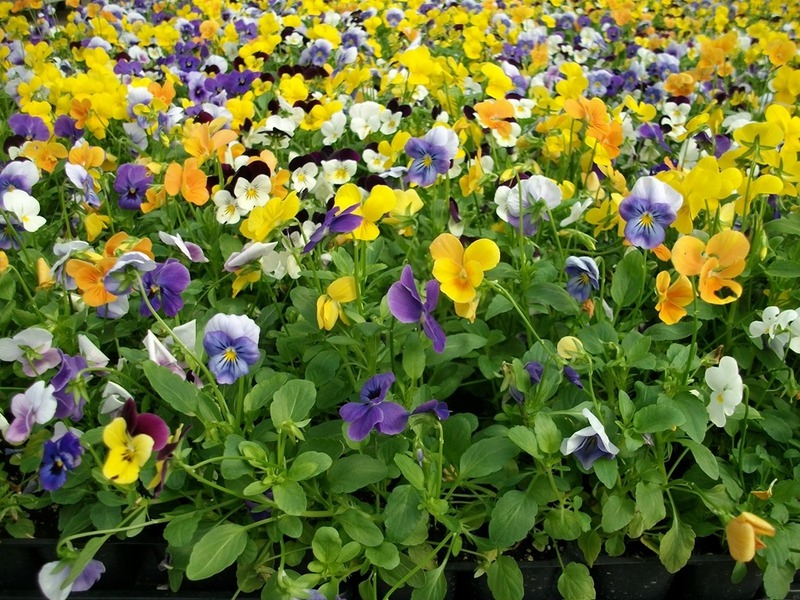 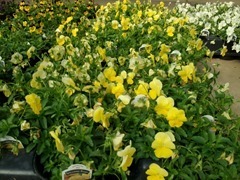 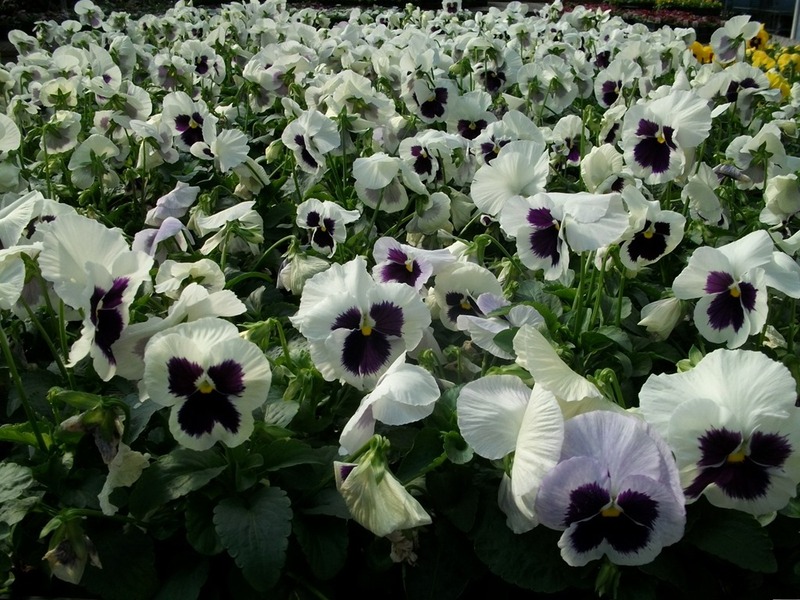 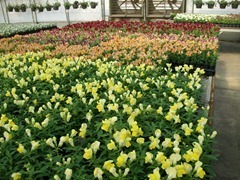 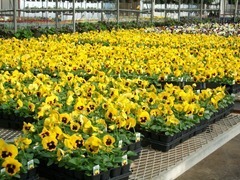 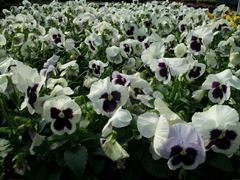 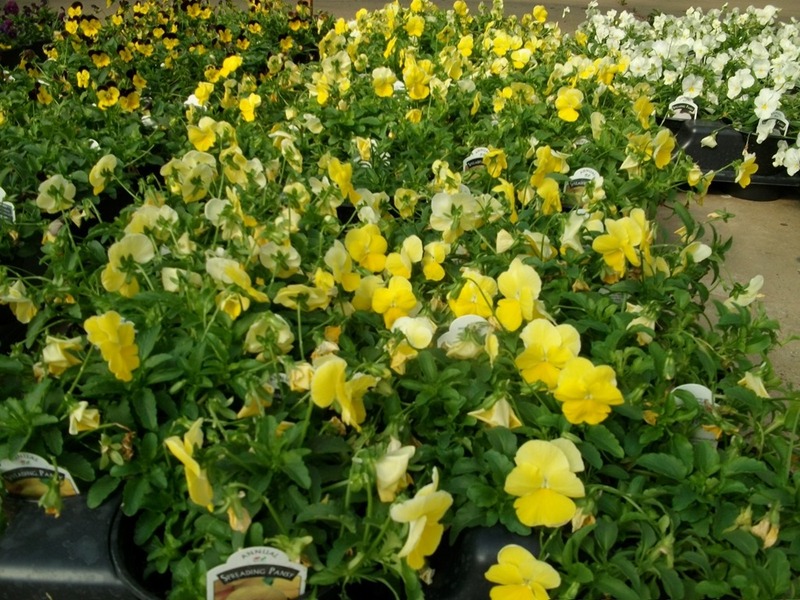 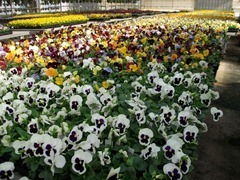 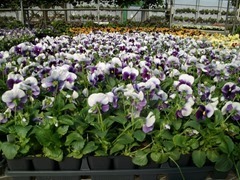 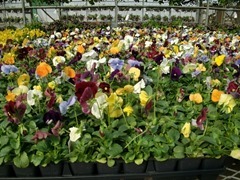 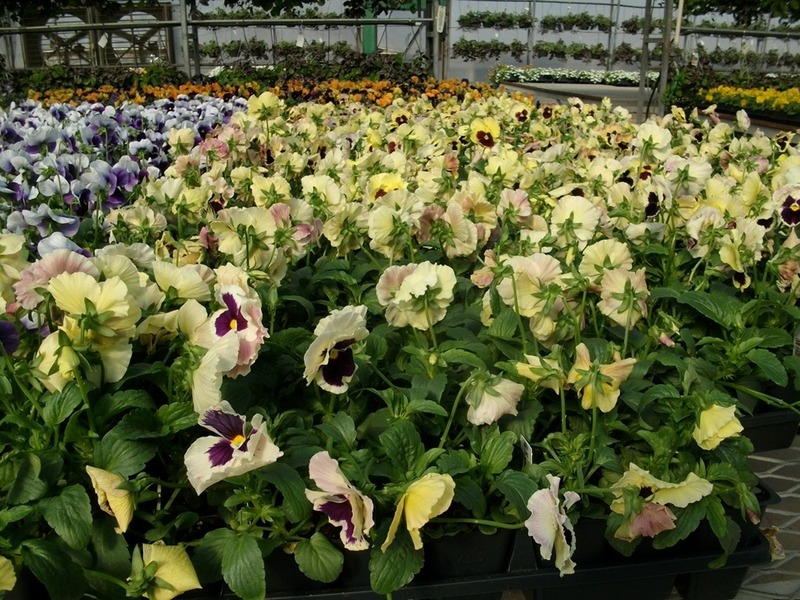 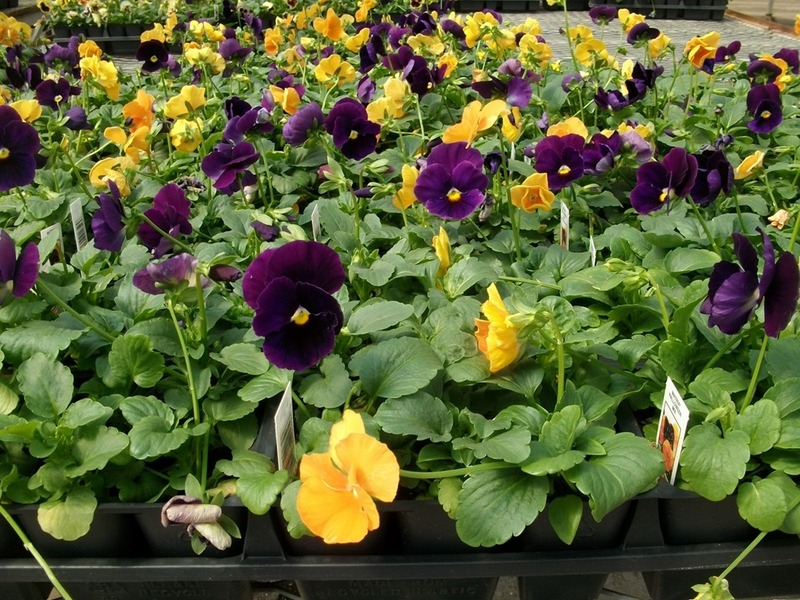 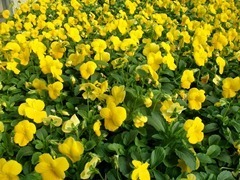 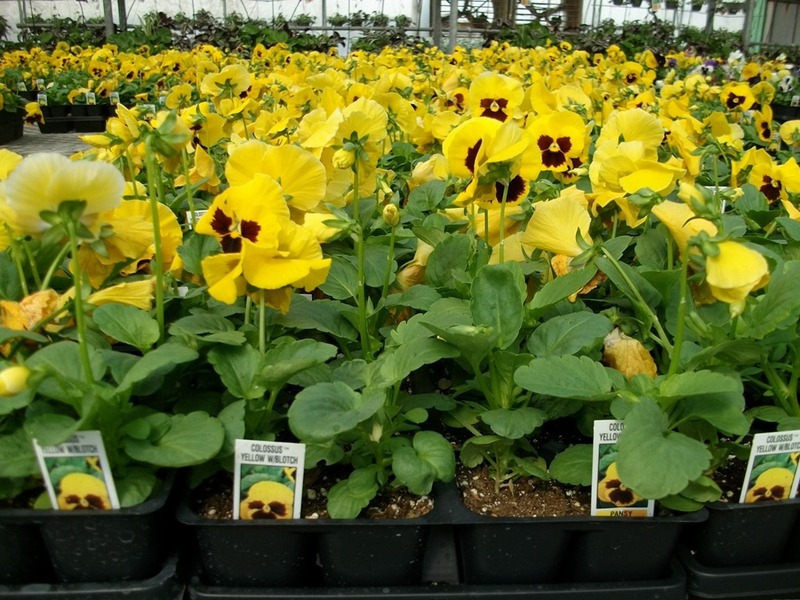 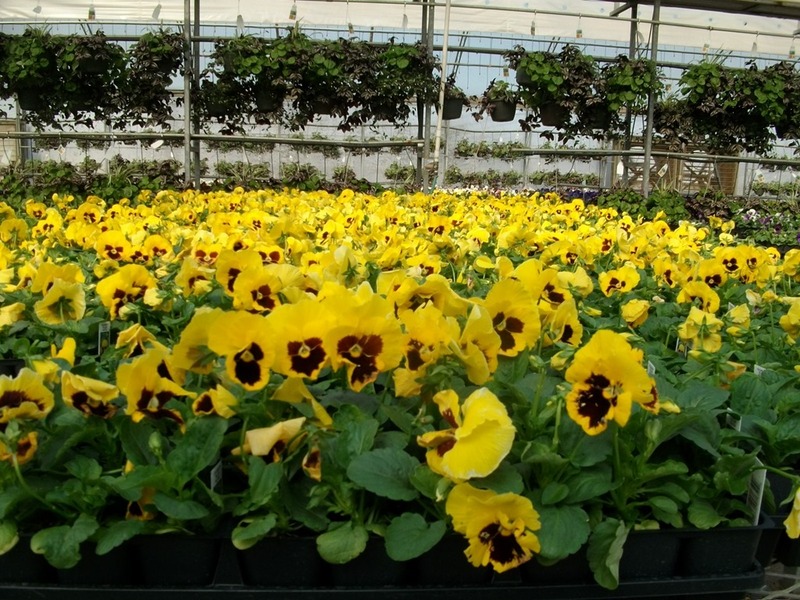 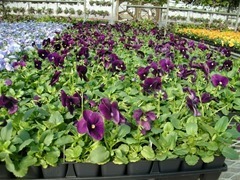 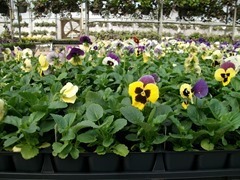 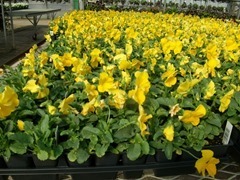 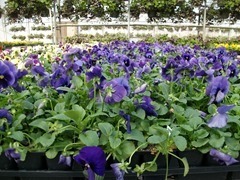 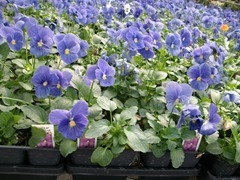 We have good color in almost all our J6 pansies, panolas and violas. 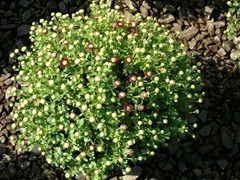 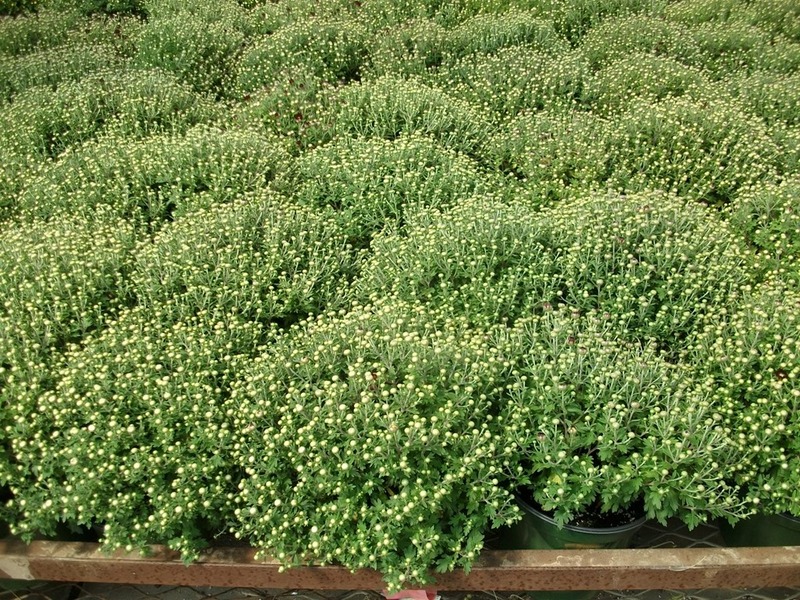 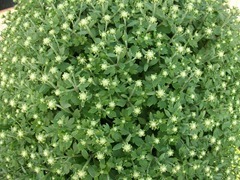 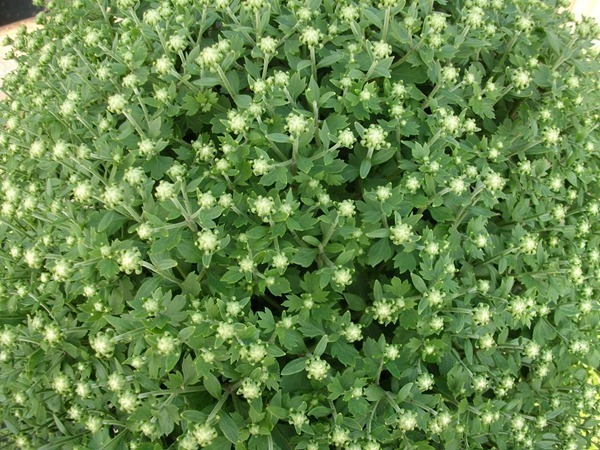 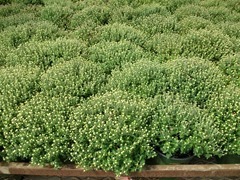 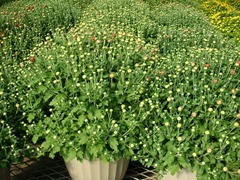 Most of the mums are starting to show some color in the buds. A few have some blooms open. 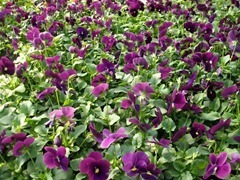 The #8 Bronze and Purple have Buds, and the #12 Bronze have Buds. 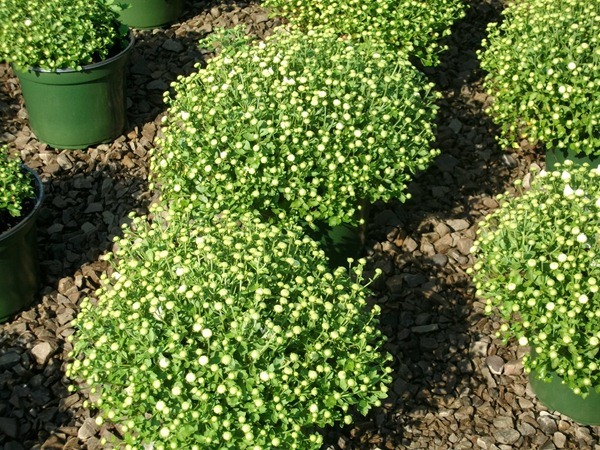 These first 2 pictures are of the 3 color #12 mums. 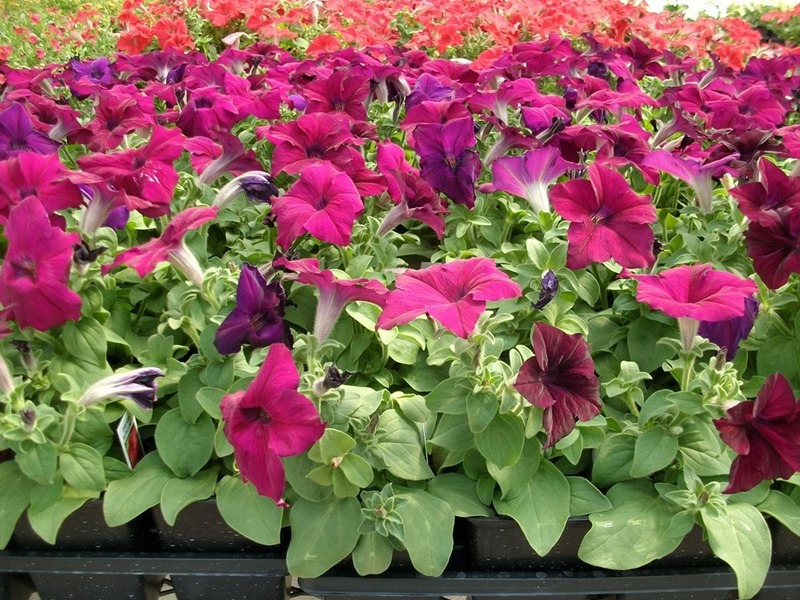 We’ve been calling them tricolor which I think is confusing because it implies the blooms are tricolored. 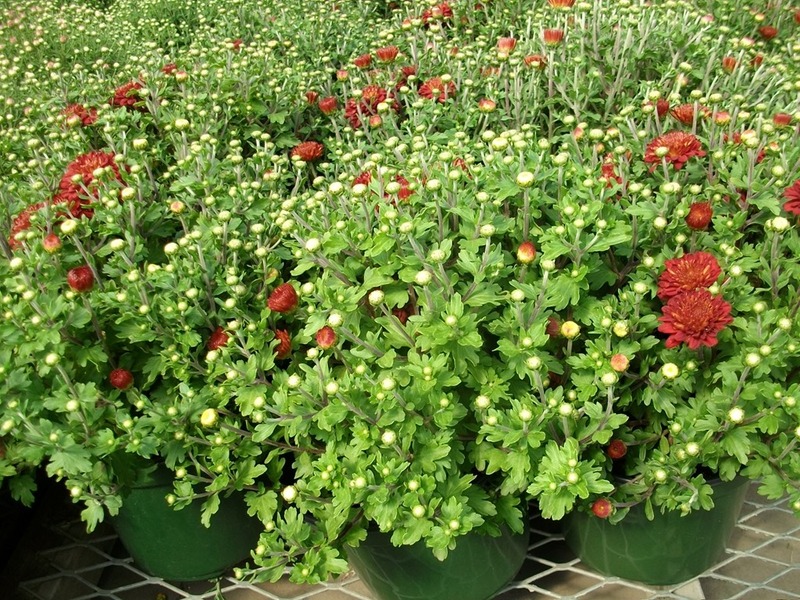 I think 3 color is a more accurate representation because they are #12 mum pots planted with 3 different colors that look more like a color wheel than a true combination where the colors are mixed on all sides of the container. 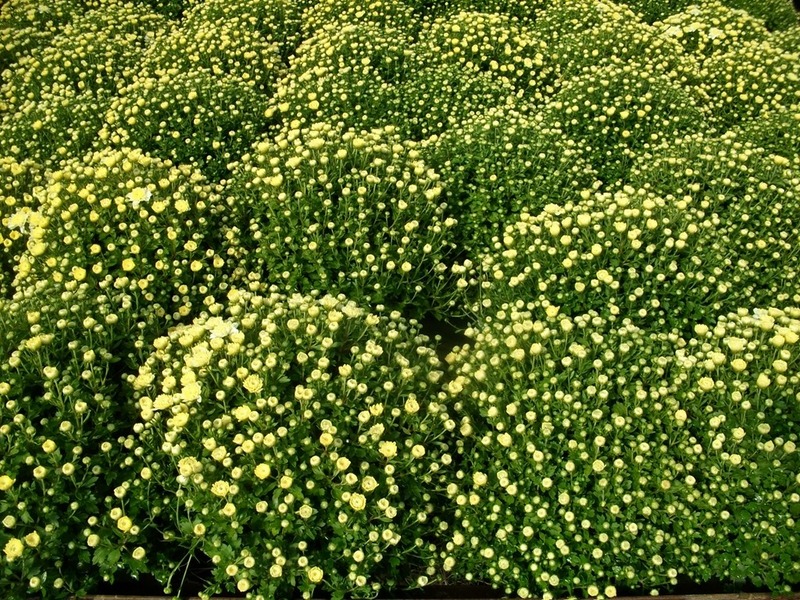 Just my opinion on that. 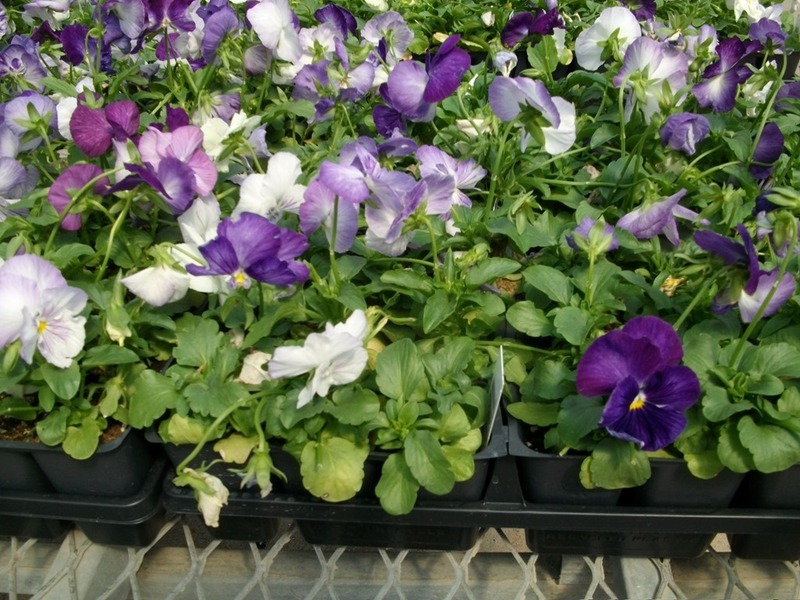 We’ll see how the name change goes. 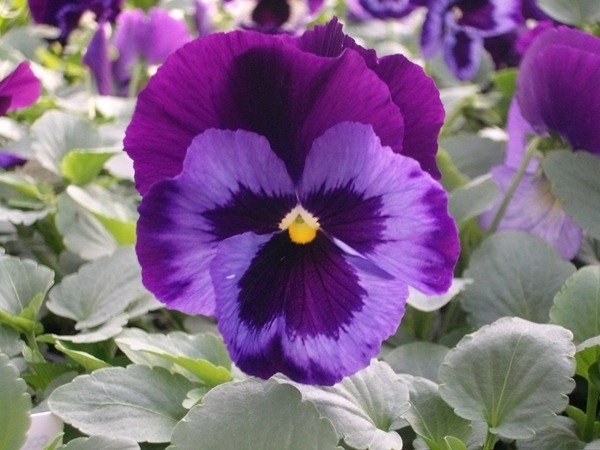 Changing it now may cause more confusion at this point. 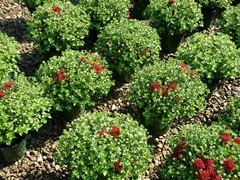 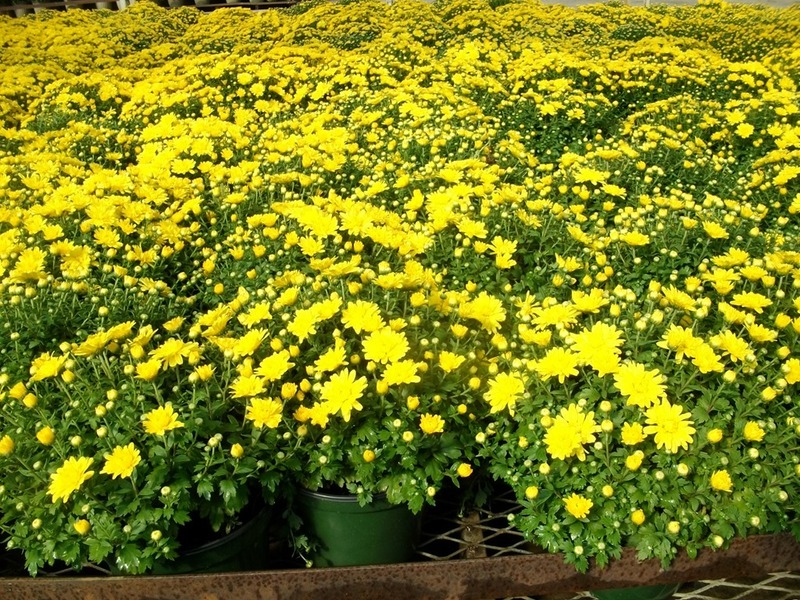 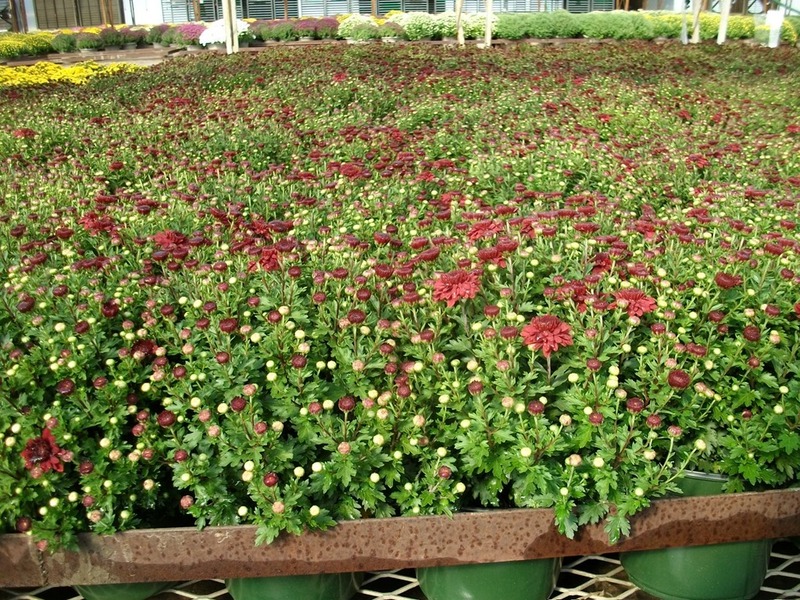 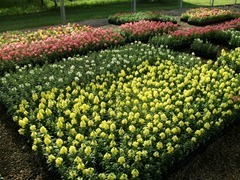 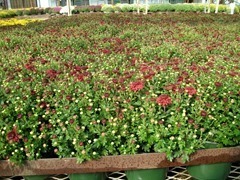 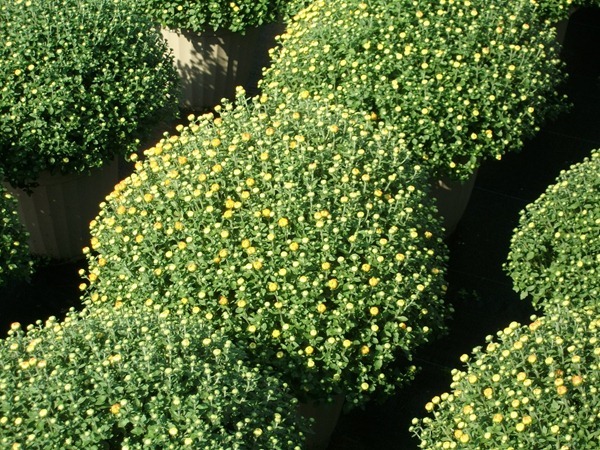 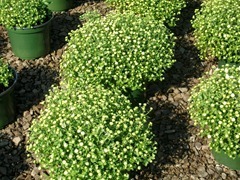 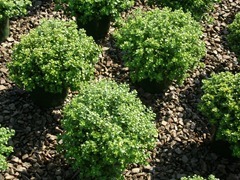 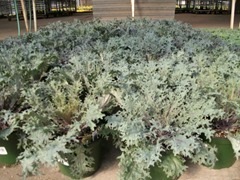 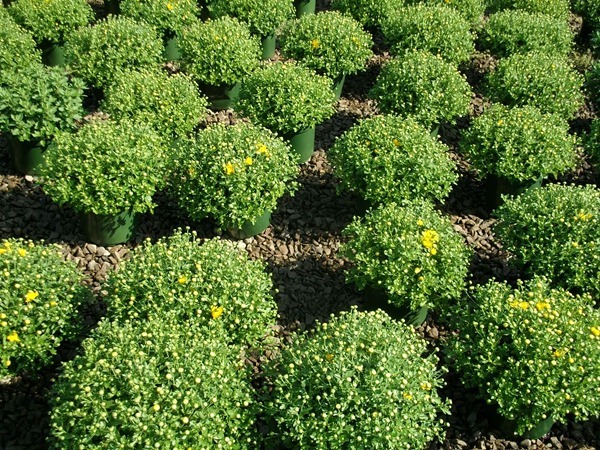 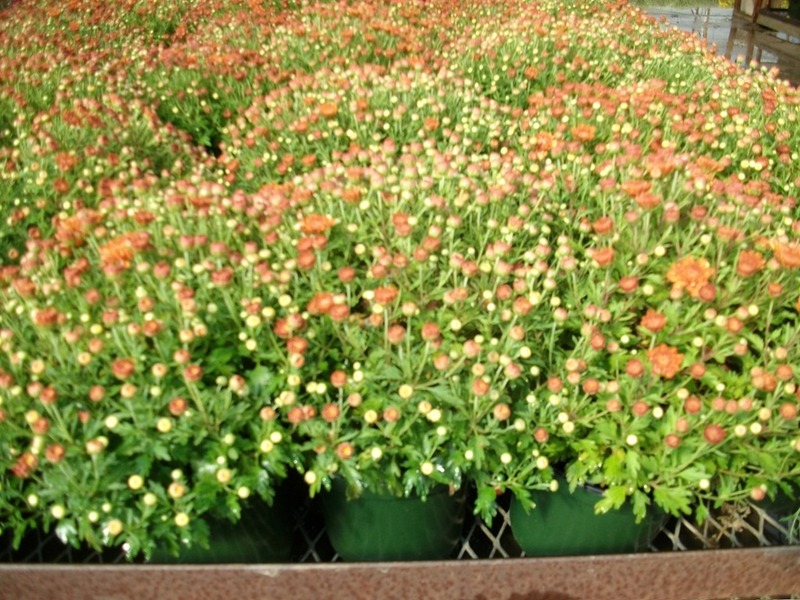 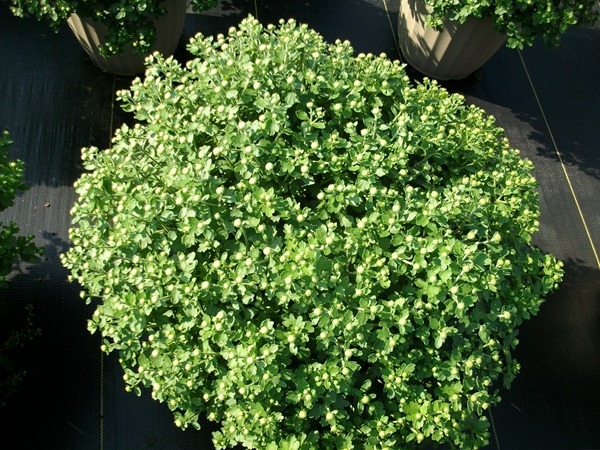 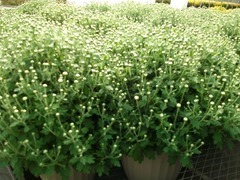 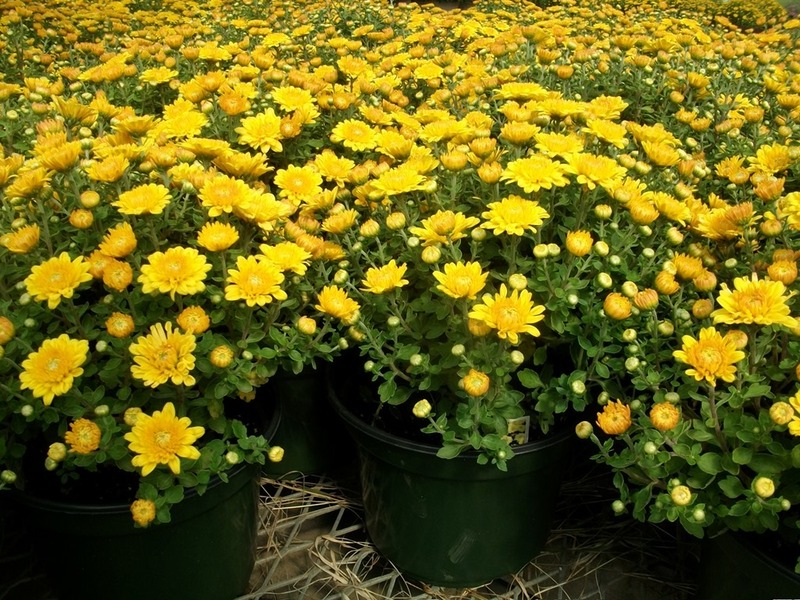 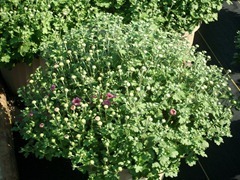 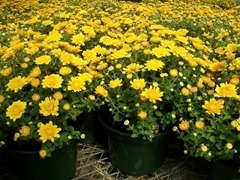 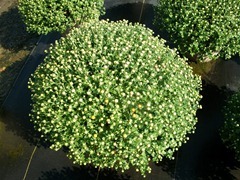 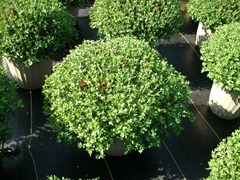 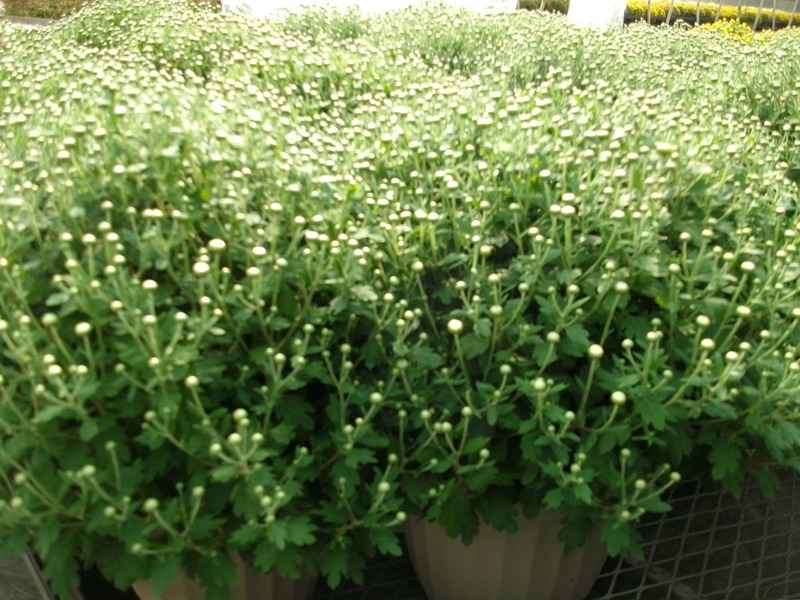 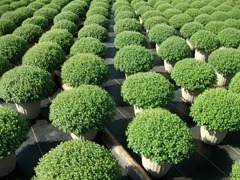 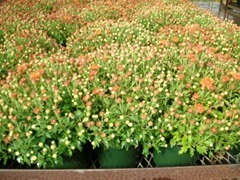 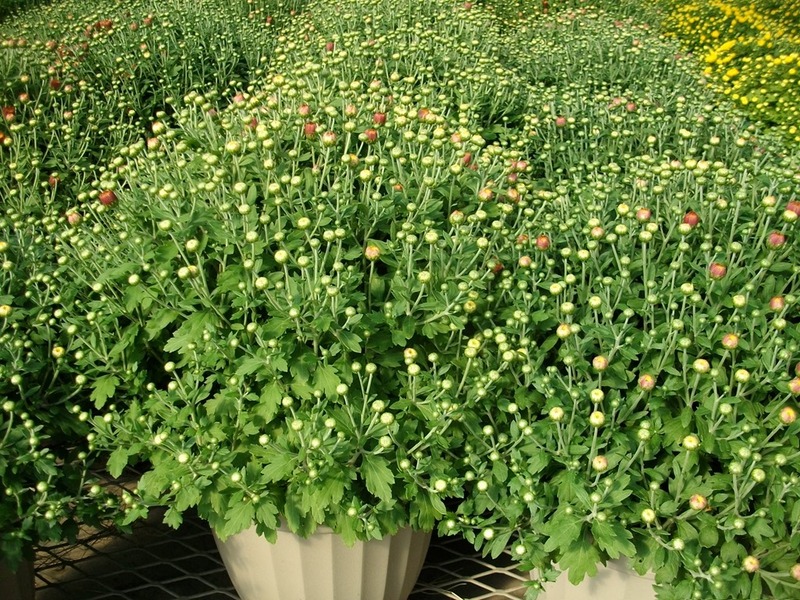 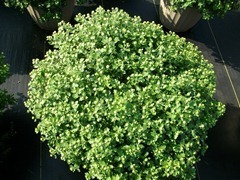 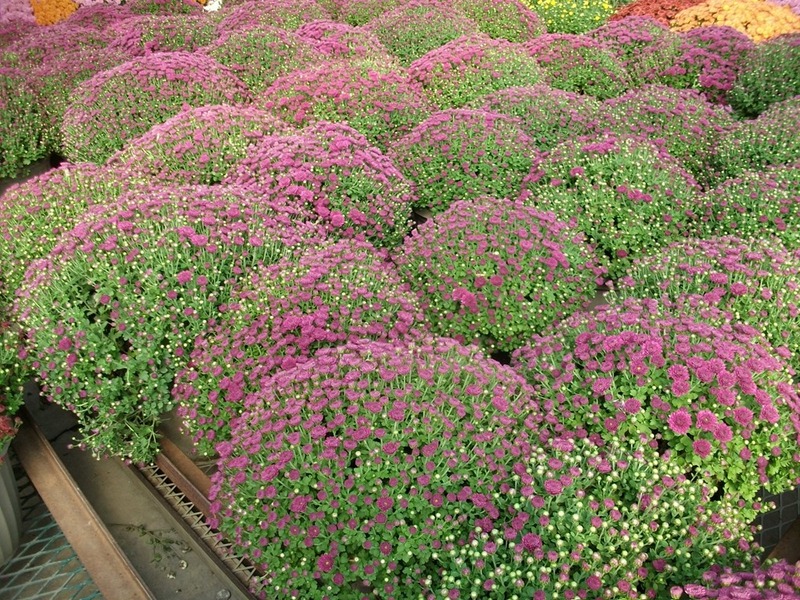 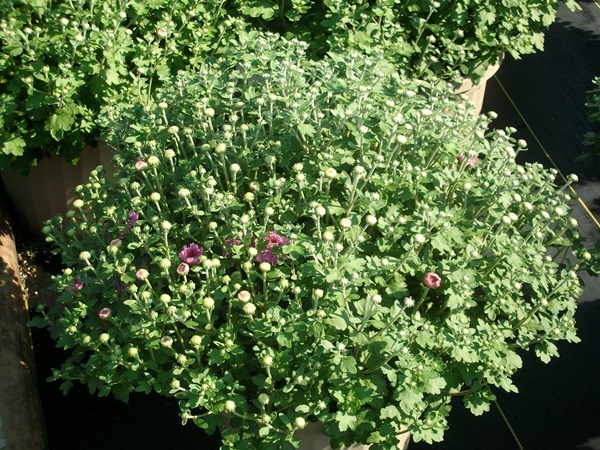 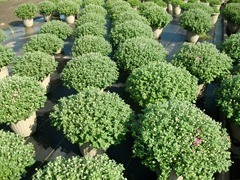 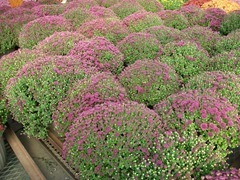 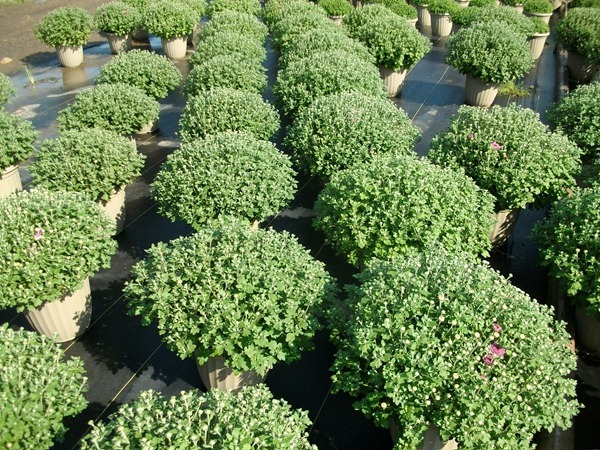 The 3 color mums are a couple of weeks away from showing any color. 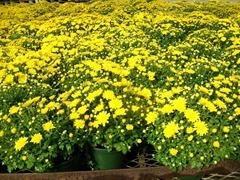 Here are the rest of the #12 mums.